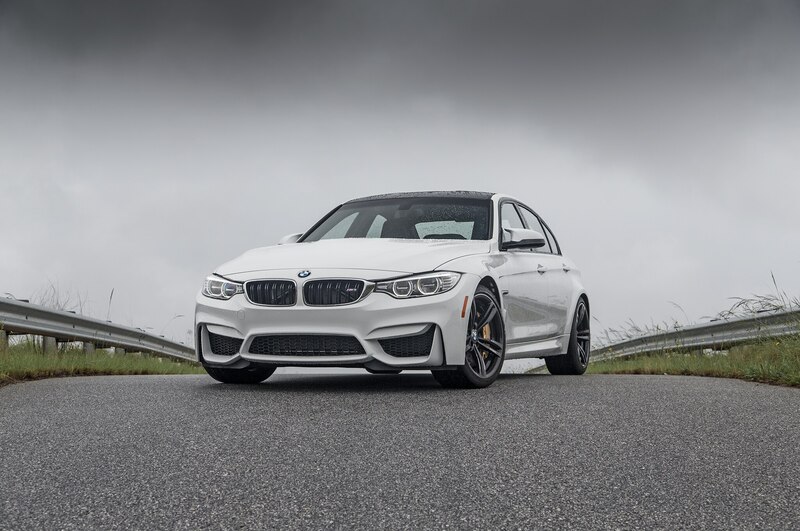 Don’t let the spec sheets fool you—these rival high-performance sedans could hardly be more different. 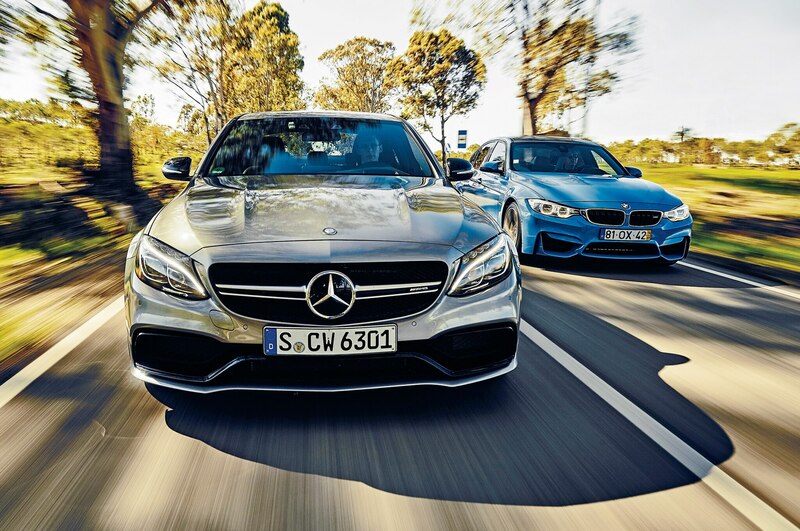 And they don’t like each other. 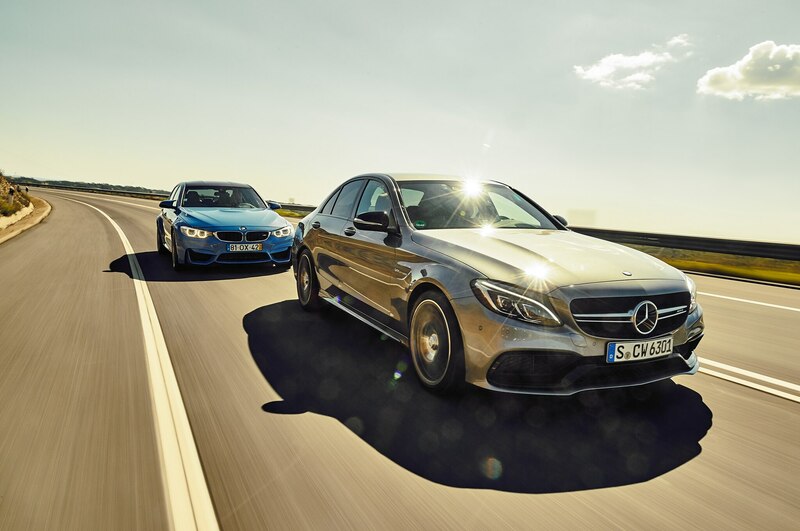 To say the 2015 Mercedes-AMG C63 sedan happens to perform similarly to the BMW M3 is like saying Russian troops happen to be vacationing in Crimea. 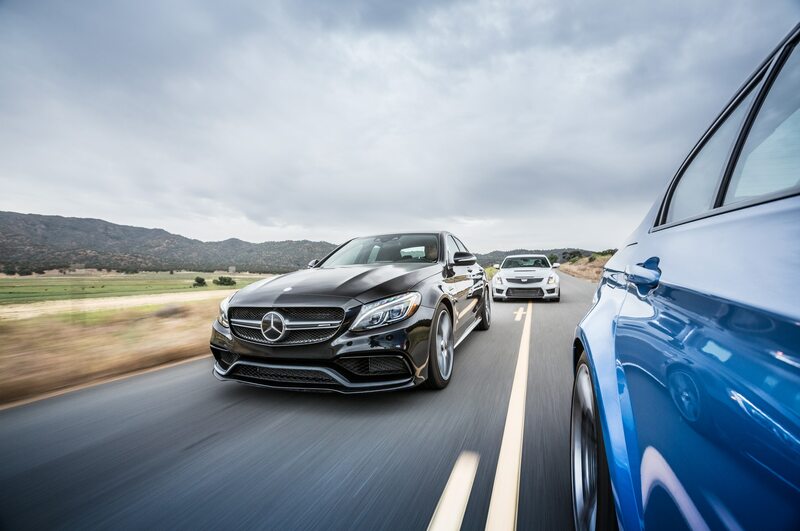 Mercedes-AMG’s latest effort targets BMW’s venerable supersedan with all the focus and intent of a laser-guided missile. 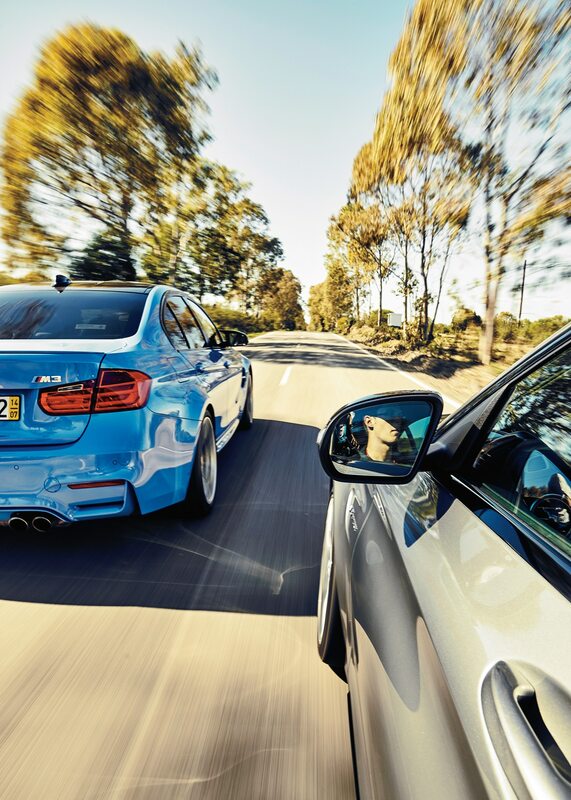 Look at the numbers: 0-60 mph in 3.9 seconds for the BMW M3, 4.0 seconds for the Mercedes-AMG C63 (3.9 seconds for the more powerful C63 S). 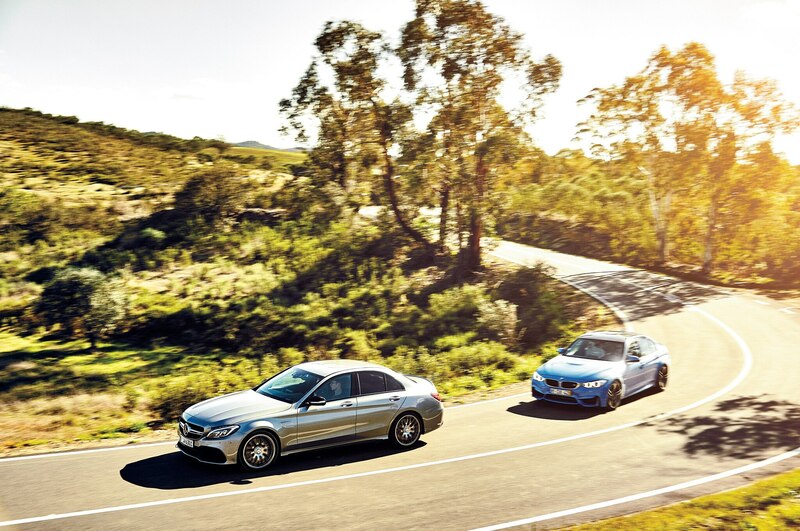 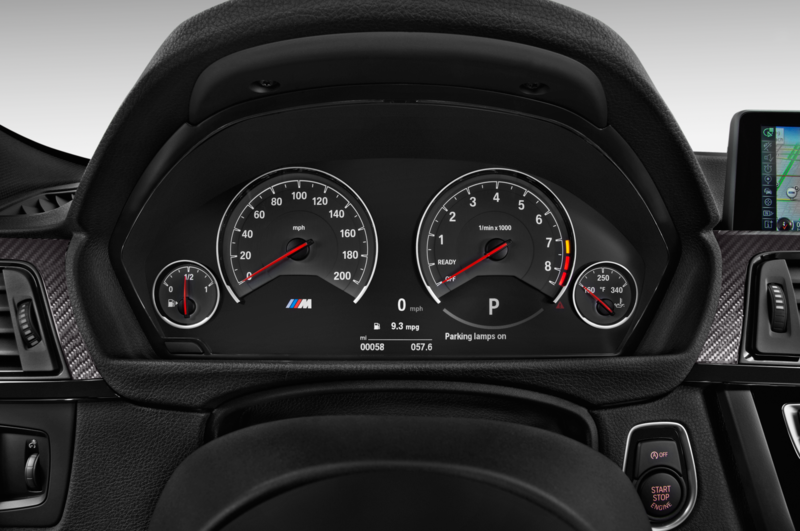 Top speed is governed at 155 mph for both the BMW and the Mercedes (option packages for both remove the governors). 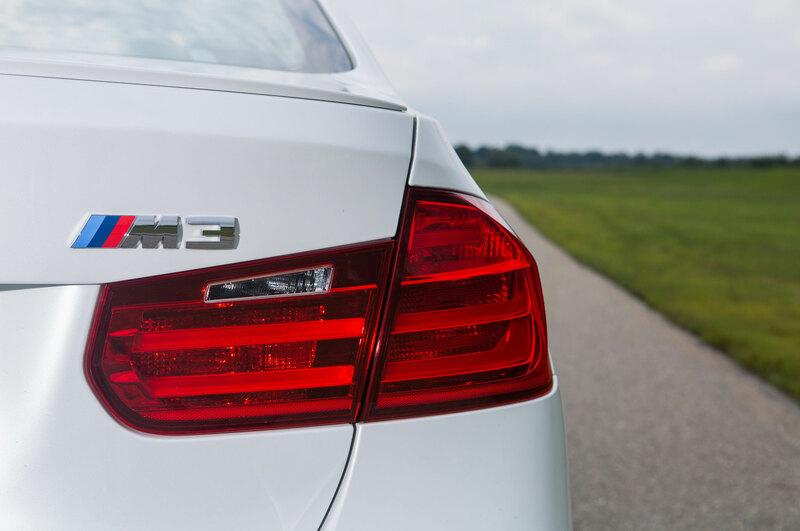 Also, Mercedes barely beats BMW in fuel economy, hitting 29 mpg combined on the European cycle versus 28 mpg for the M3. 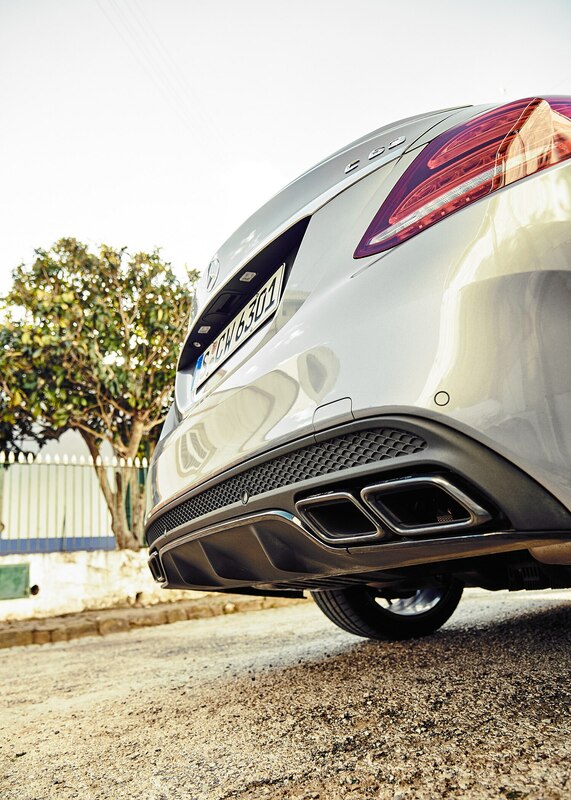 (EPA ratings for the C63 have not yet been announced.) 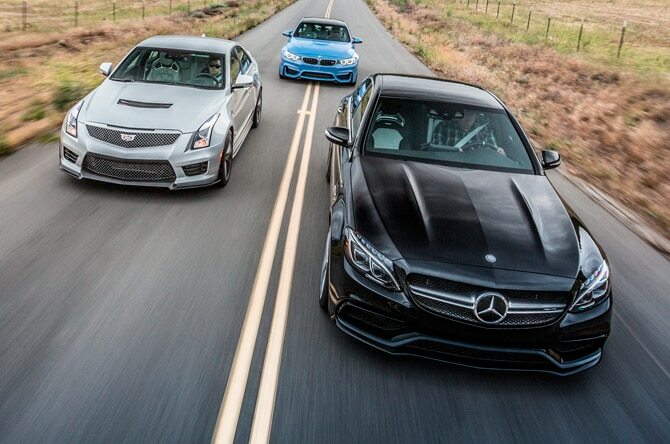 The Mercedes will start at $64,825 in the States, $1,875 more than the BMW. 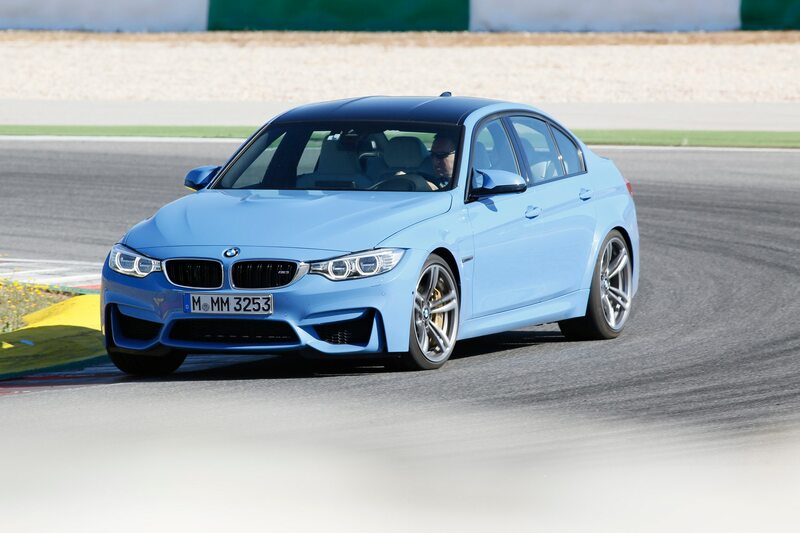 So intent is Mercedes-AMG on beating its nemesis that it introduced the C63 at the same Portuguese venue where BMW introduced the latest M3 a few months earlier. 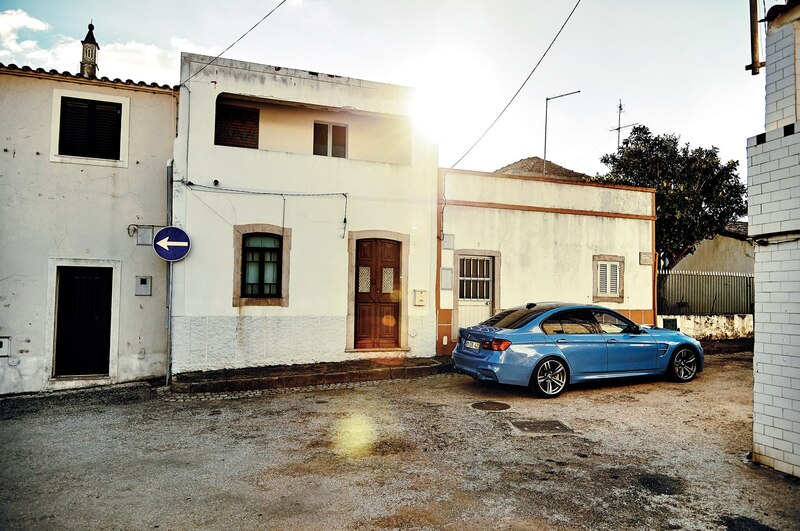 Funny, we just so happen to be here in Portugal with a baby blue M3. 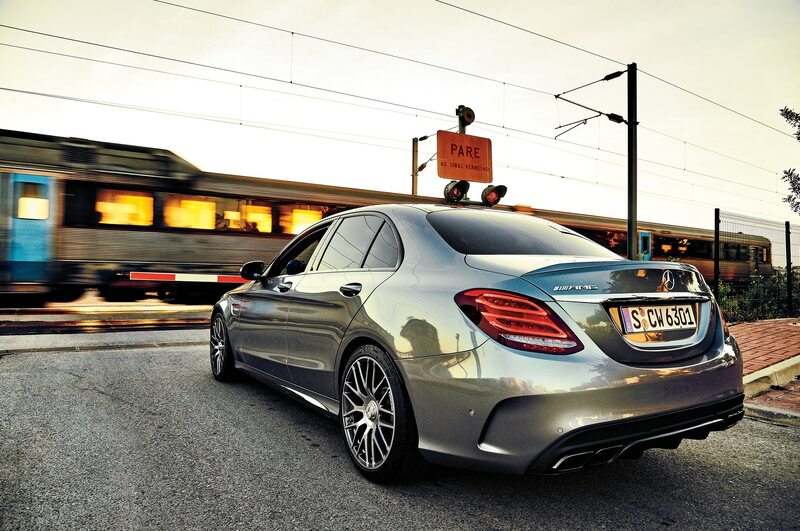 Let’s see if the C63 can hit its target at point-blank range. 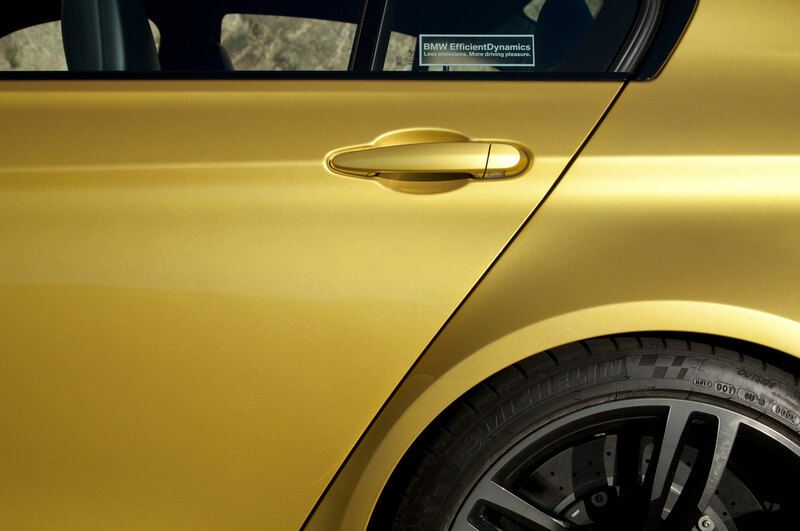 The Mercedes wears its usual AMG war paint. 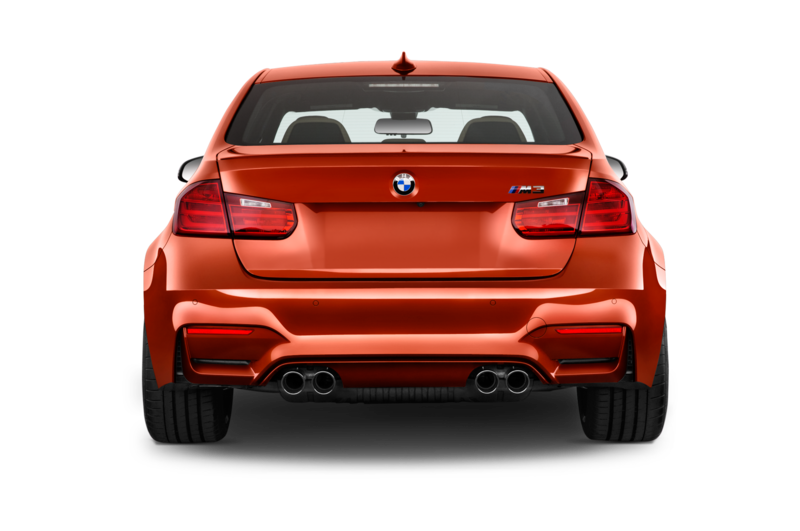 Cues include additional brightwork, larger air intakes, more sculptured bumpers, air deflectors front and rear, available 19-inch wheels, and quad tailpipes. 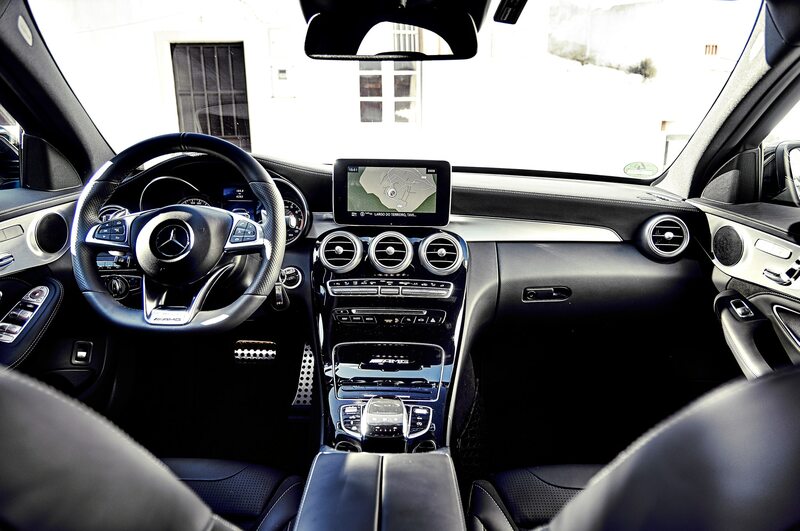 To make room for the V-8 and the extensive plumbing that goes with it, AMG lengthened the car’s nose by almost 3 inches versus the regular C-Class. 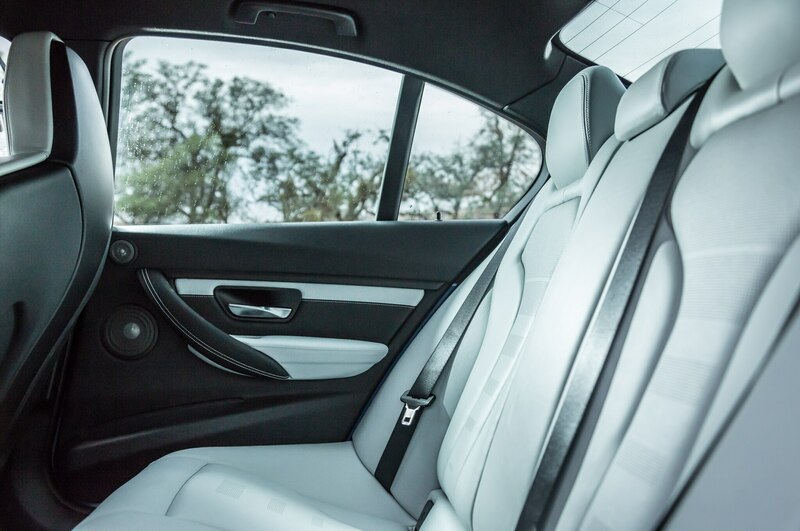 The cabin can be trimmed either like a baby S-Class or like a pseudo-race car. 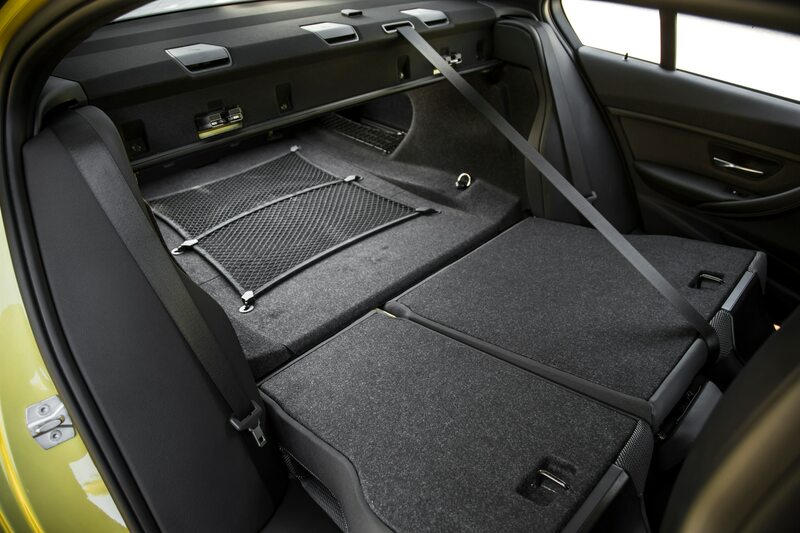 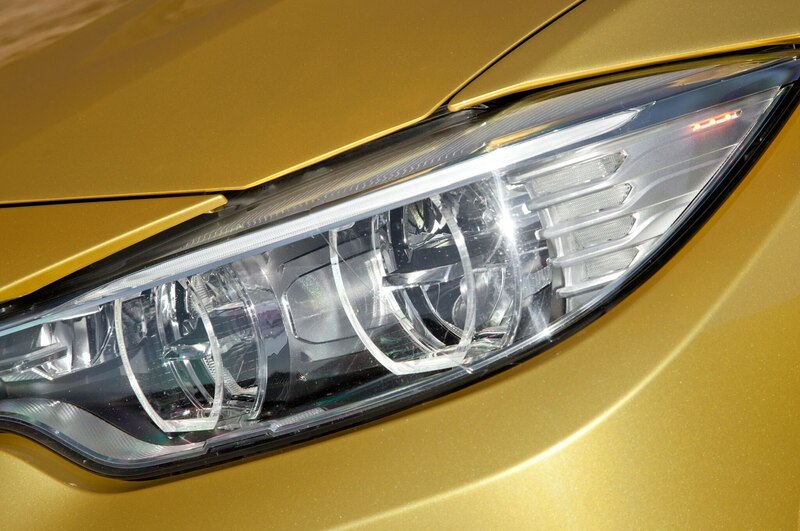 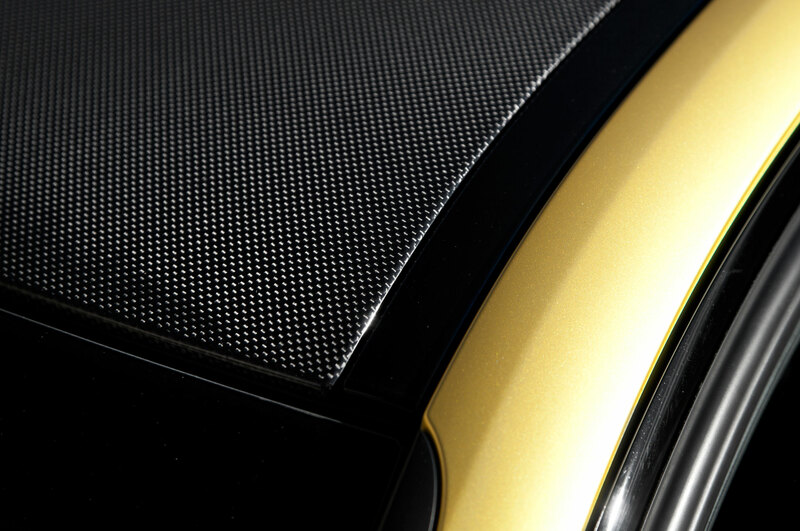 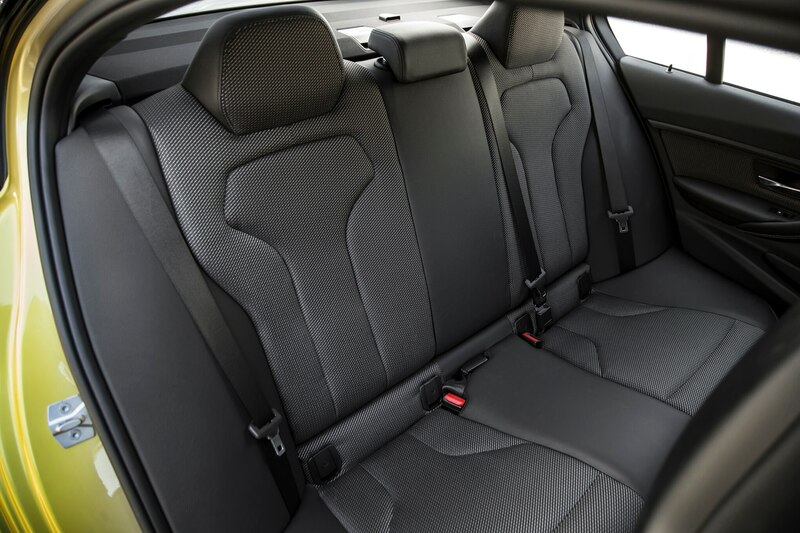 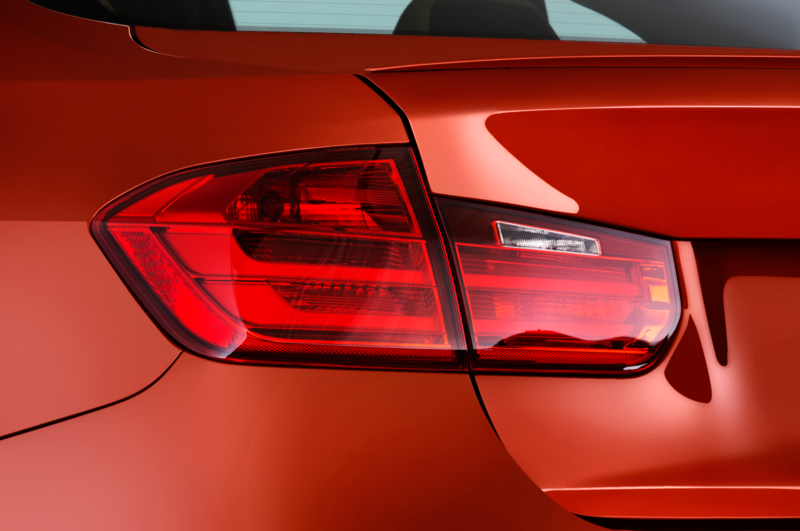 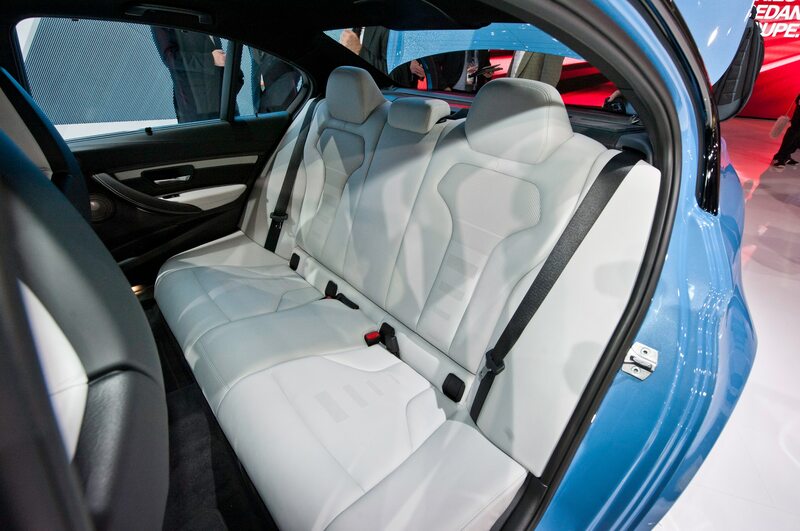 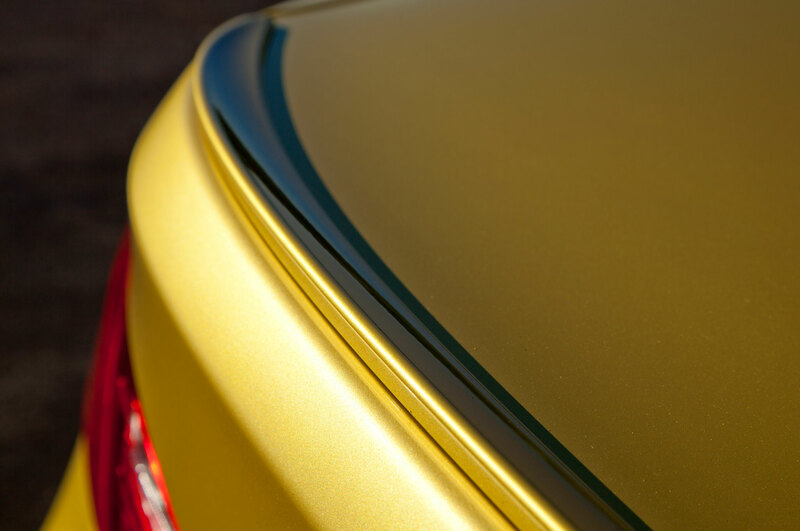 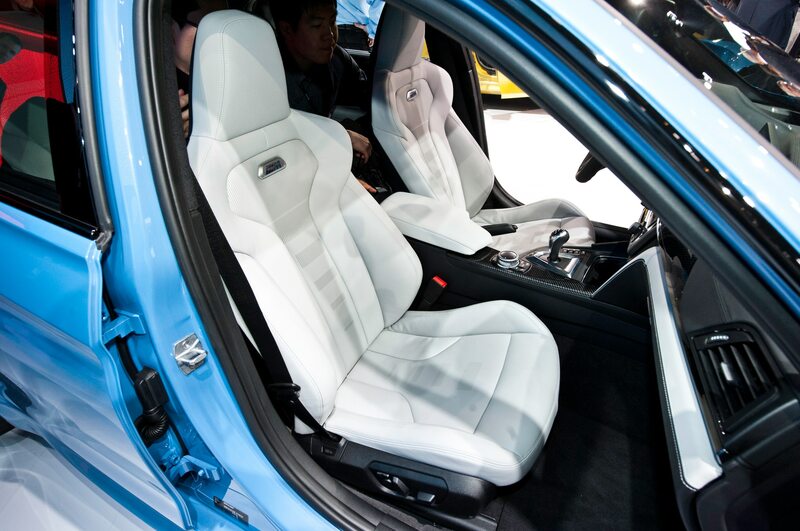 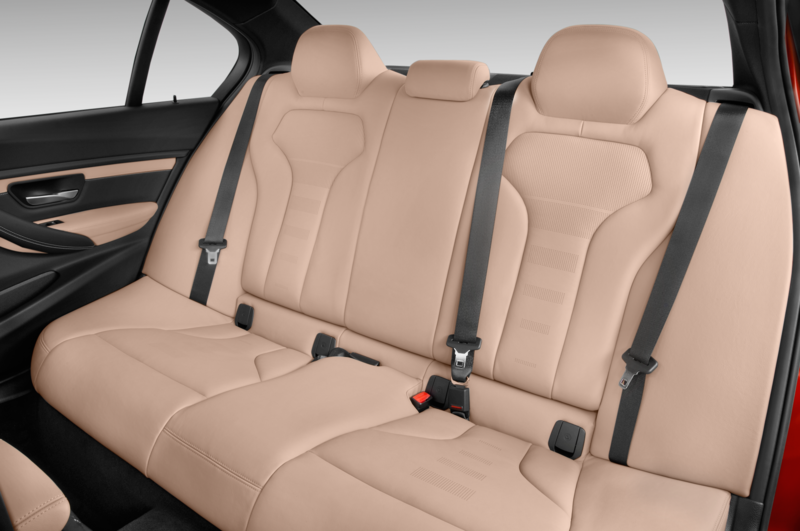 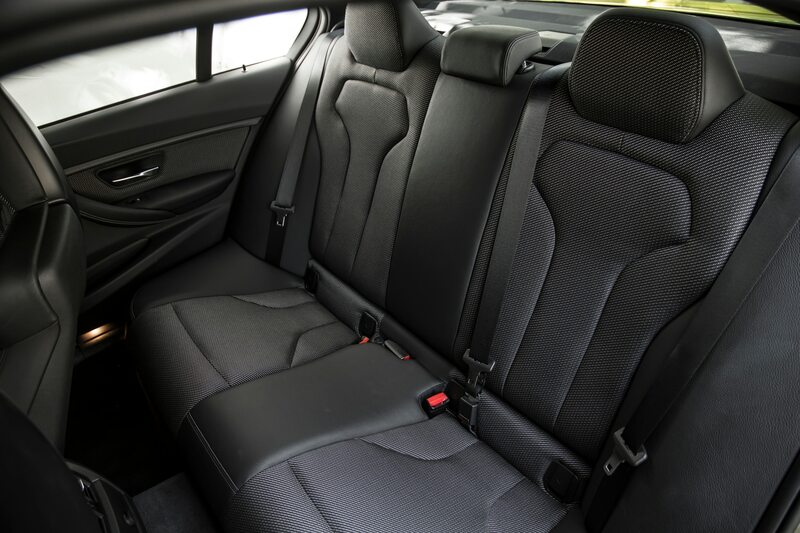 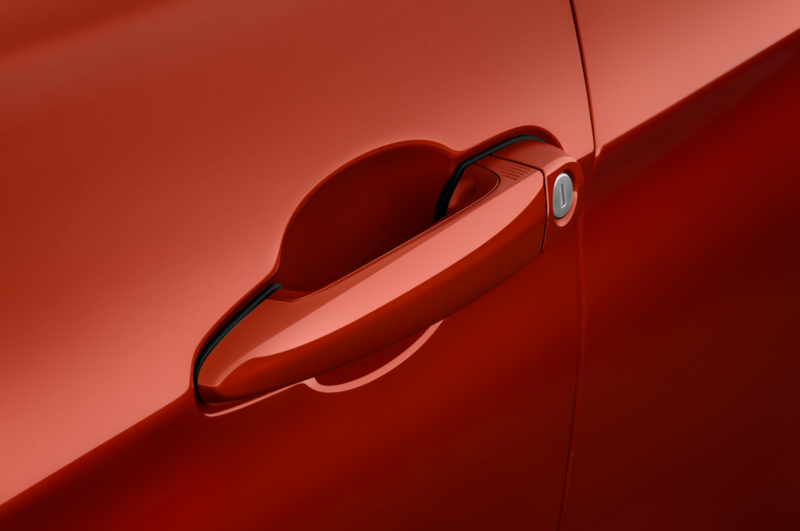 Just as in the base C-Class, the materials are top-notch and the fit and finish impeccable. 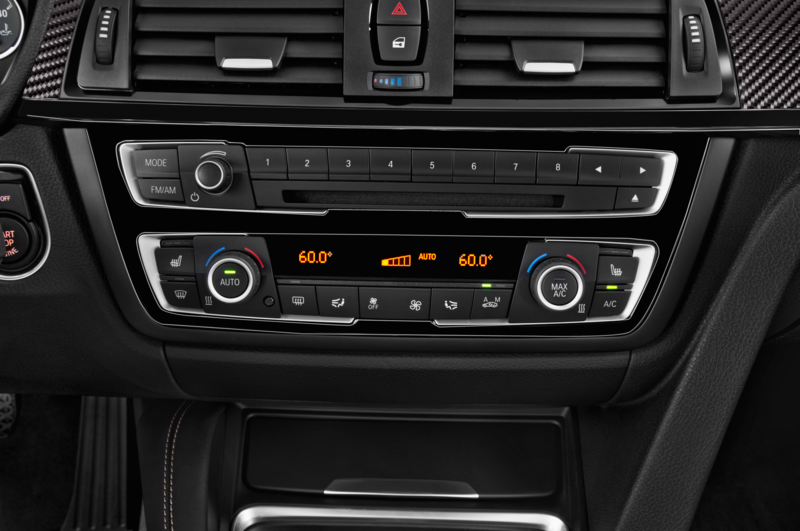 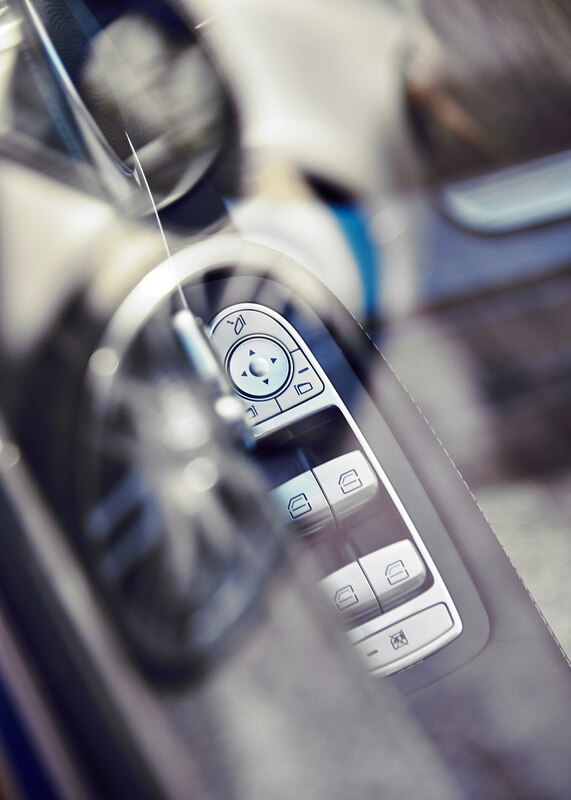 But no matter how sporty the driver environment might look, there is no way to get rid of that Buick-esque column-mounted gear selector—a letdown in a car as involving as this one. 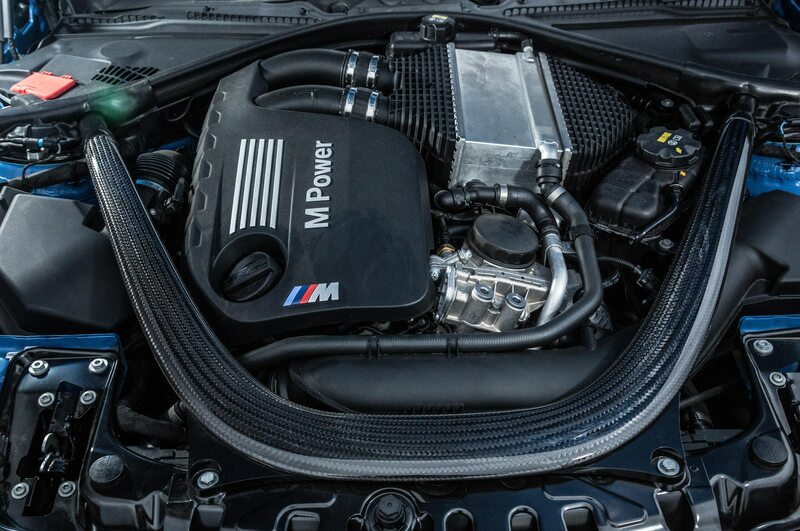 BMW spared no effort in developing the latest M3’s engine, once again a straight-six after a one-generation V-8 dalliance. 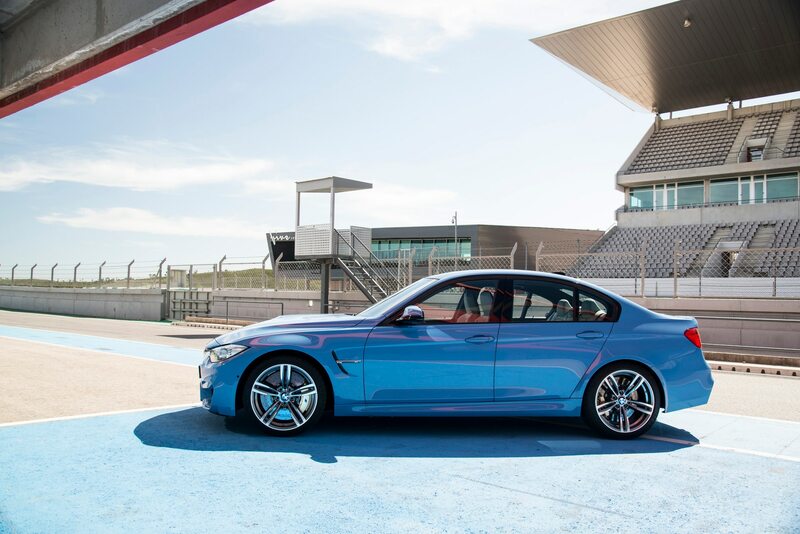 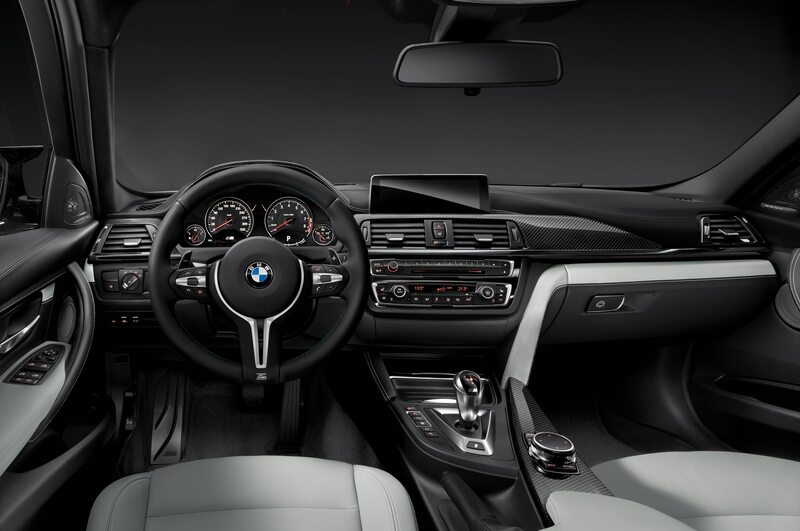 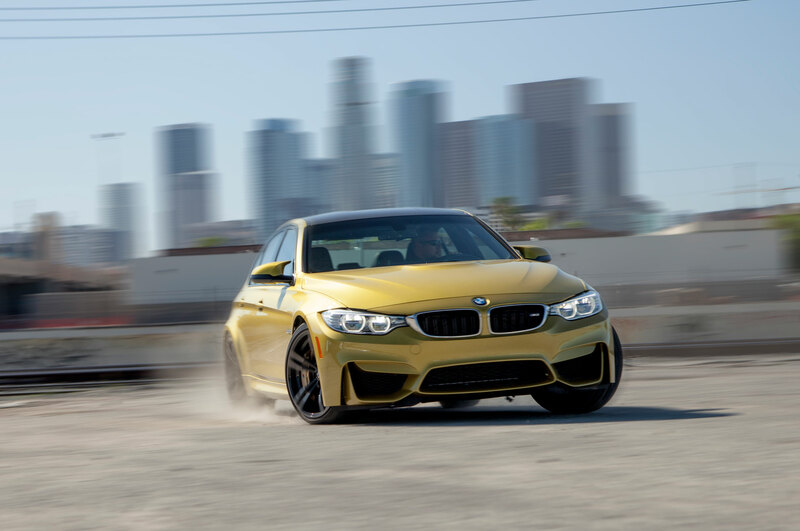 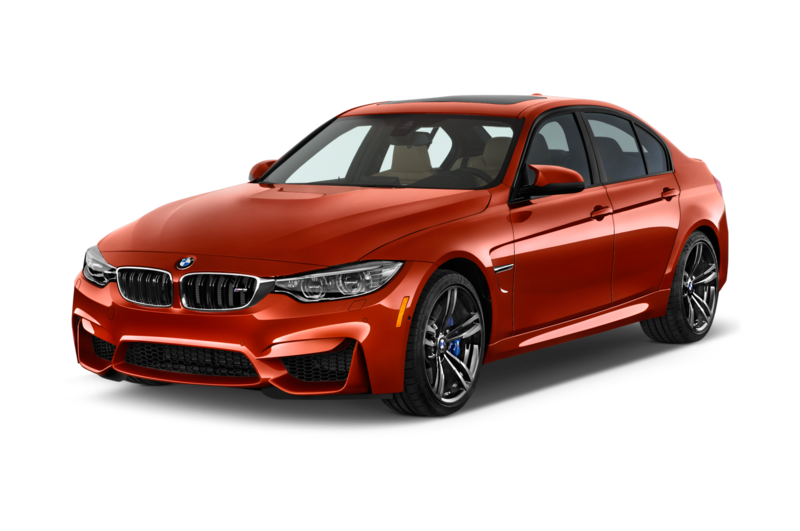 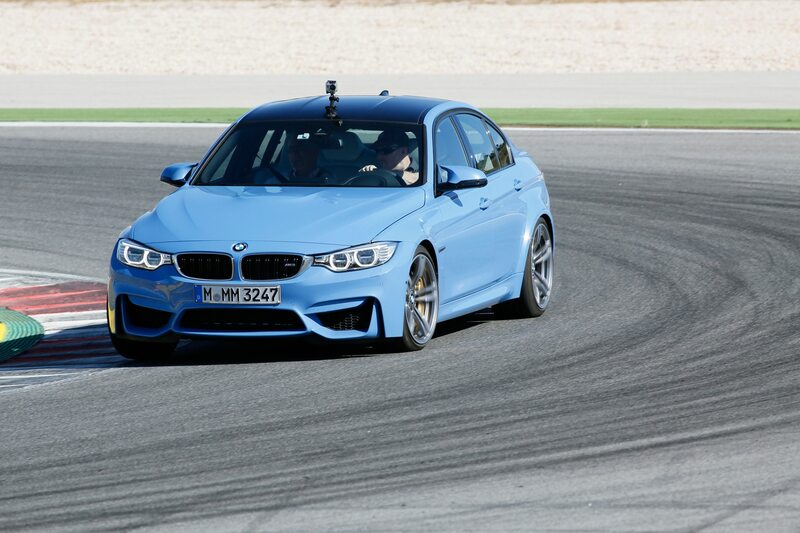 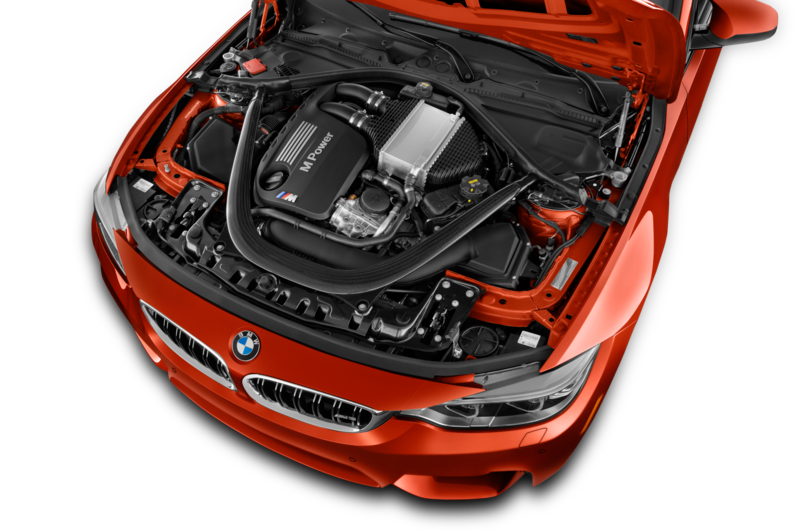 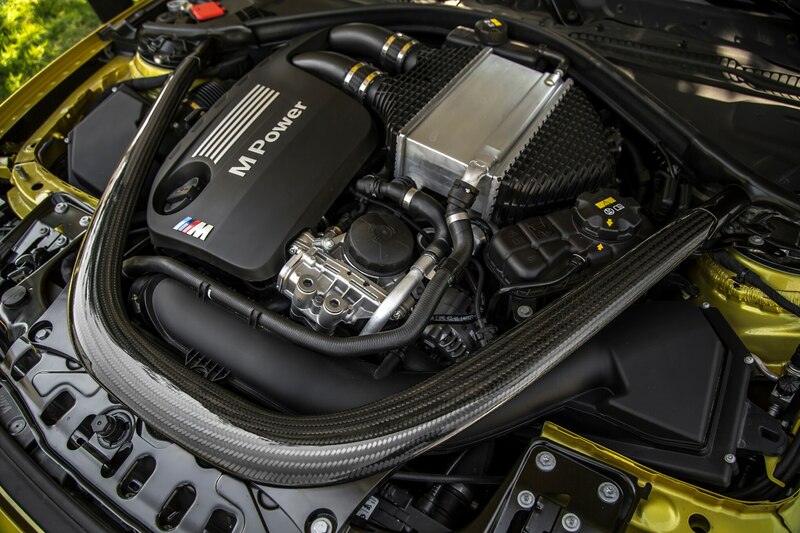 The M3’s new twin-turbo 3.0-liter develops 425 hp and sings up to 7,600 rpm, at which point the seven-speed dual-clutch automatic rifles to the next gear. 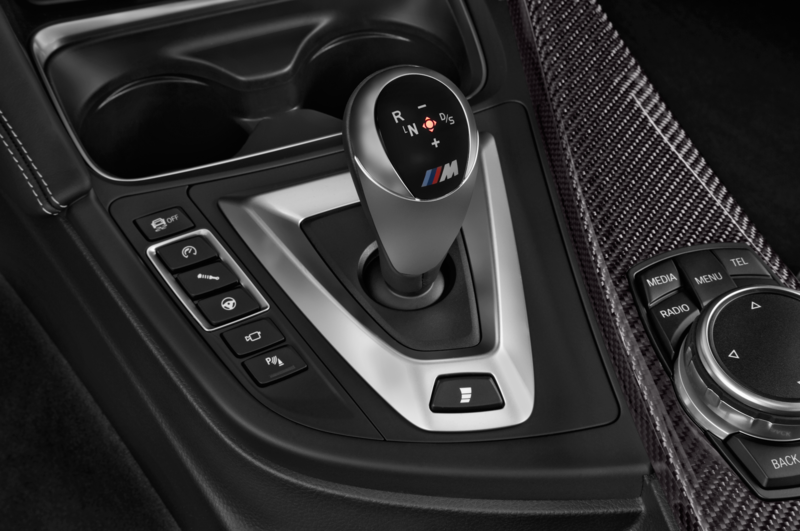 We also appreciate that the BMW holds gears in M mode and that it shifts to the lowest possible gear when you pull and hold the left paddle. 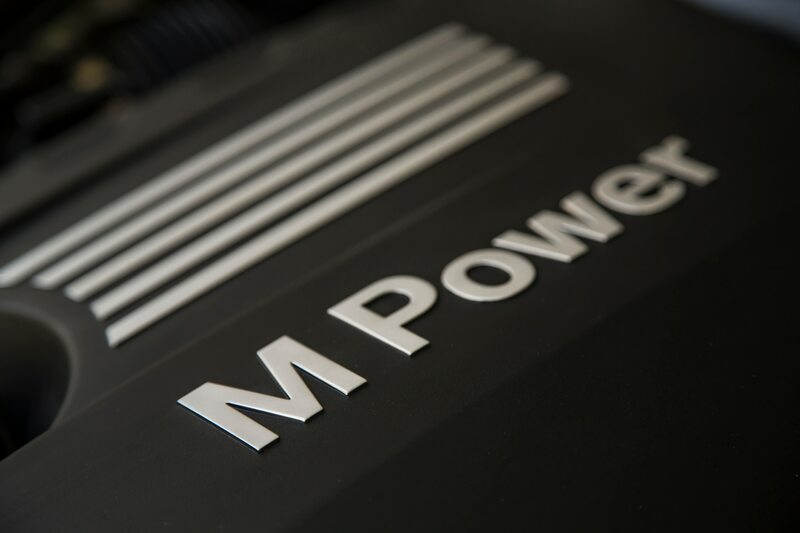 The rival twin-turbocharged 4.0-liter V-8 prepared by AMG delivers 469 hp in a notably more relaxed fashion, calling it a day at 7,000 rpm. 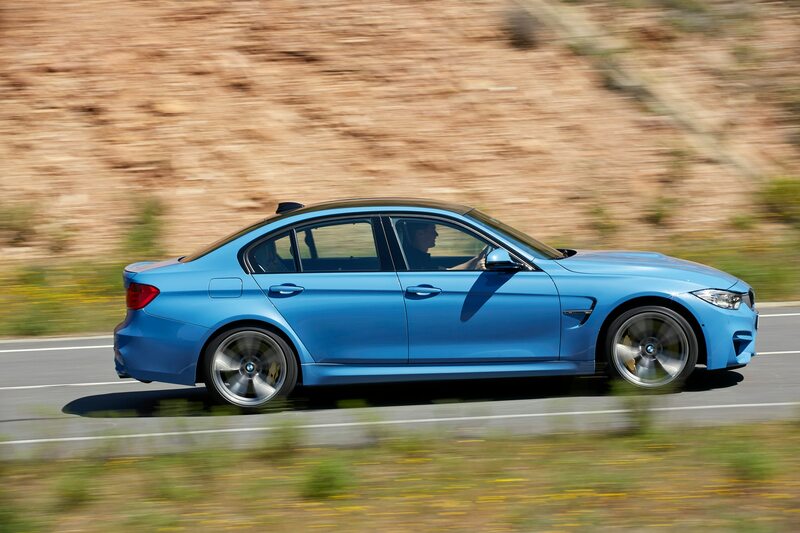 Its seven-speed transmission likewise does not shift quite as energetically. 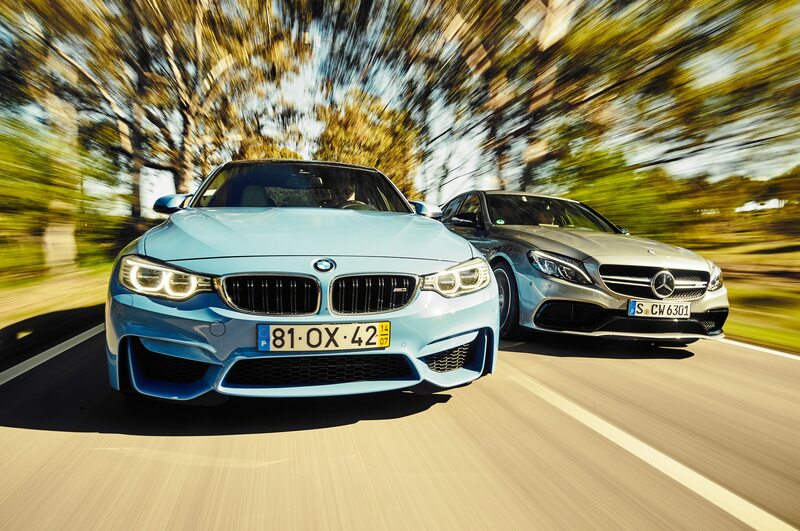 Yet despite all this, not to mention a 175-pound weight disadvantage, the Benz hangs right with the M3. 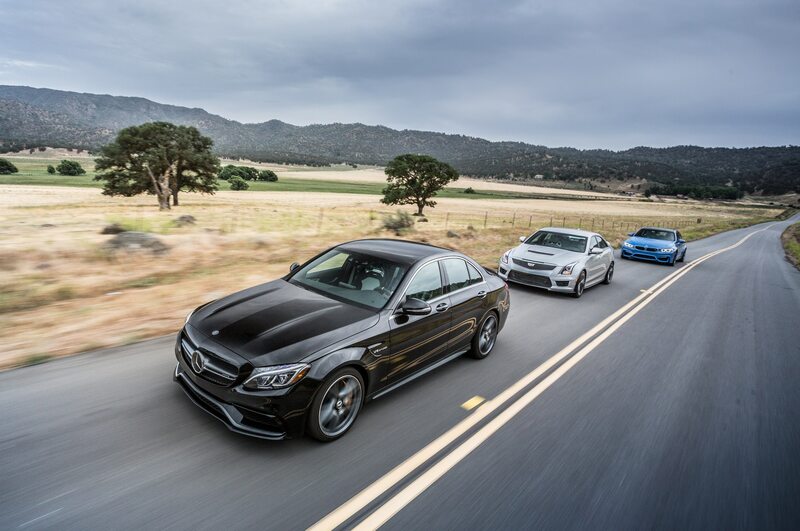 That’s the magic of torque—the AMG has 479 lb-ft, 73 lb-ft more than the M3. 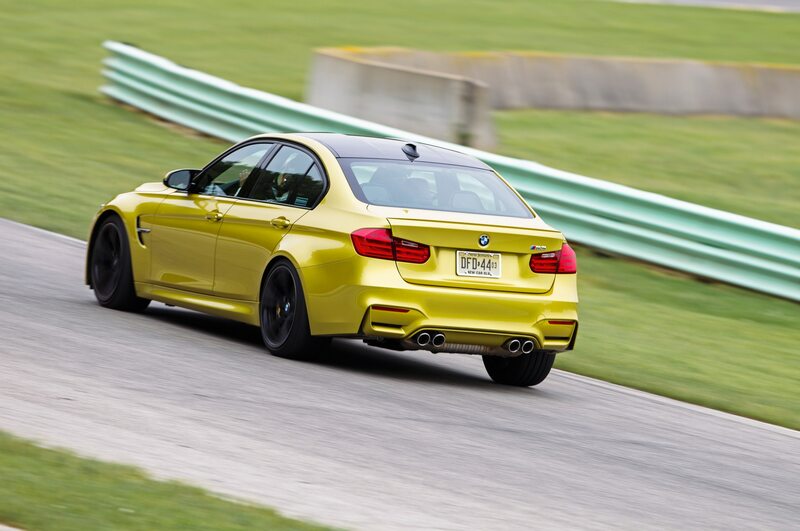 The extra grunt also makes the Mercedes-AMG C63 feel faster than the BMW M3 when accelerating between 60 and 100 mph. 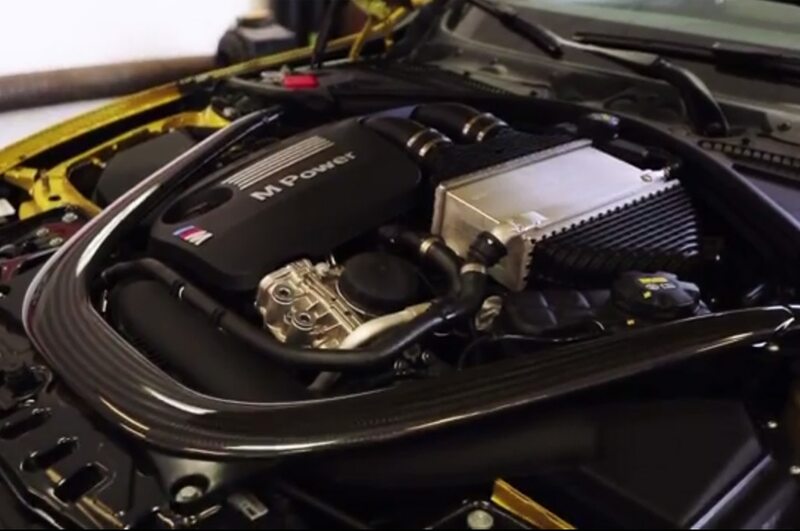 Both engines have musical talent, although the sound engineers at M and AMG alike have dialed in too much computer-generated background music. 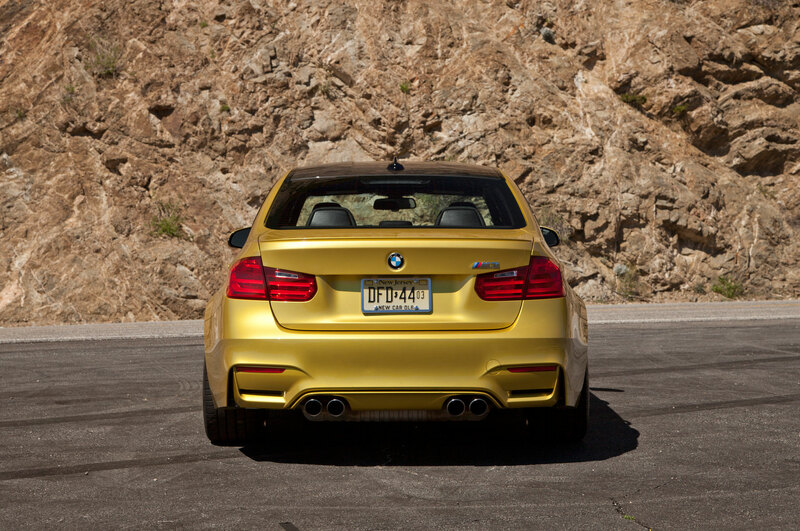 There’s fake heeling-and-toeing, fake blat-blat on overrun, fake upshift ka-chumm, fake idle-speed thud. 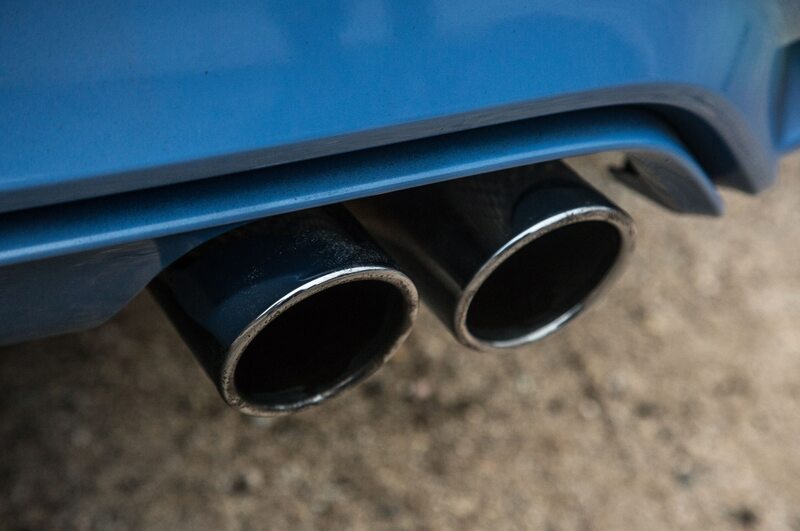 For the AMG car, you can specify an even more hooliganesque triple-flap exhaust, which sounds positively puerile. 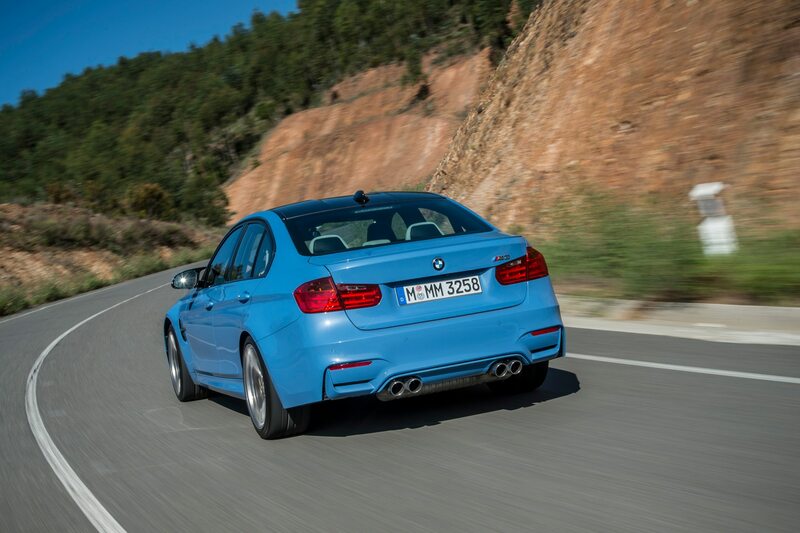 On Portuguese country roads that have not yet been resurfaced with European Union money, the M3 is not happy. 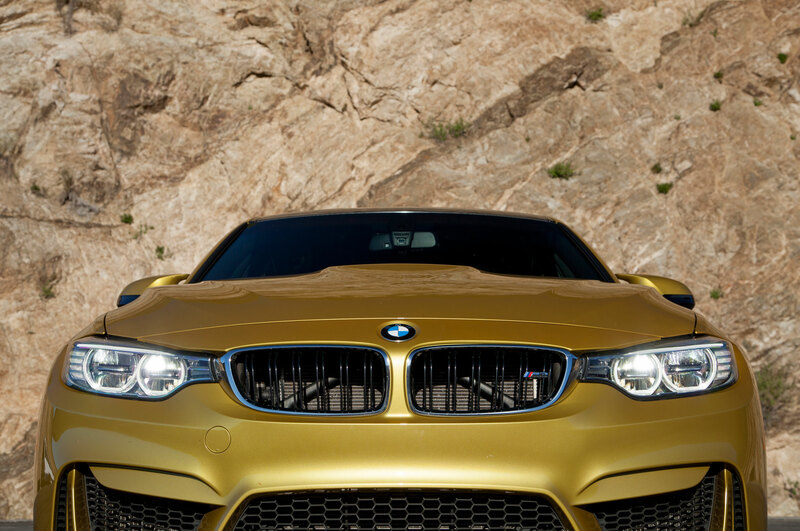 Not happy at all. 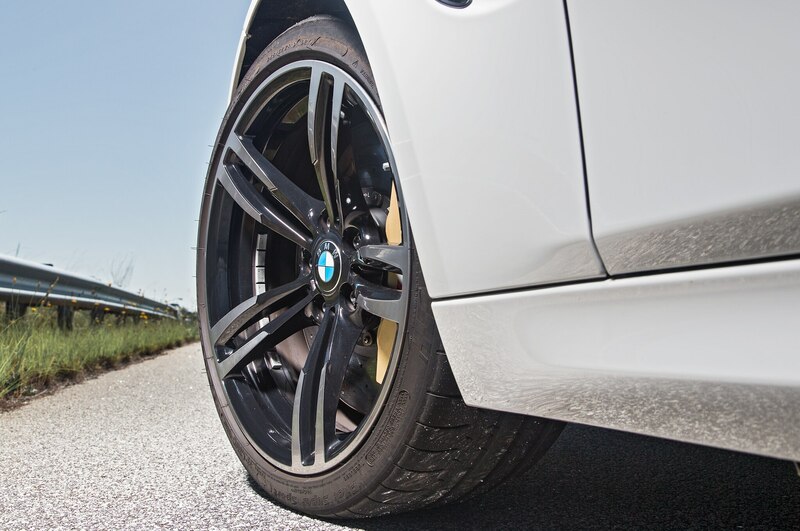 Its rear wheels scrabble about the poor pavement whenever we nail the accelerator, even when we’re already rolling at 130 mph. 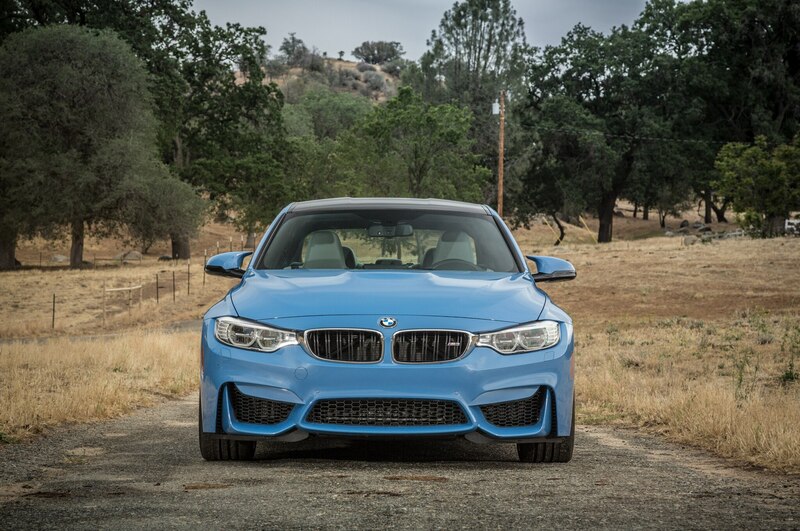 The Bimmer’s rigid chassis shines on the track and on smooth A-roads, but it backfires when the going gets rough. 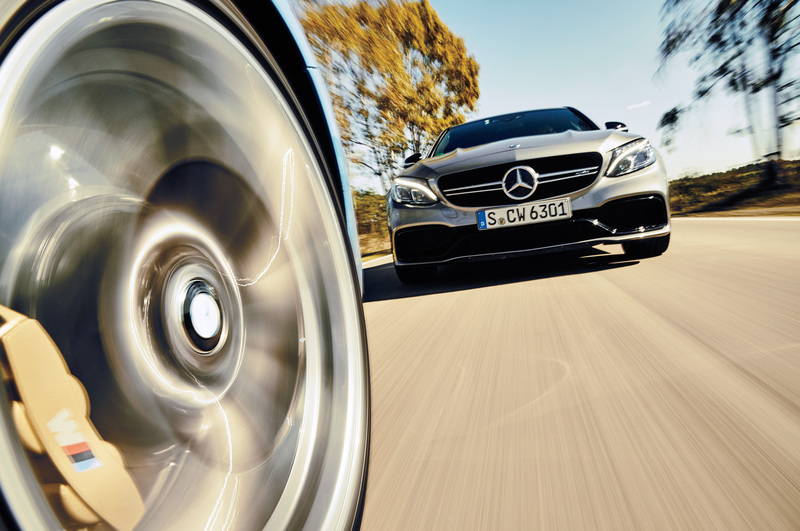 The C-Class pulls out a small lead here, but it, too, has flaws. 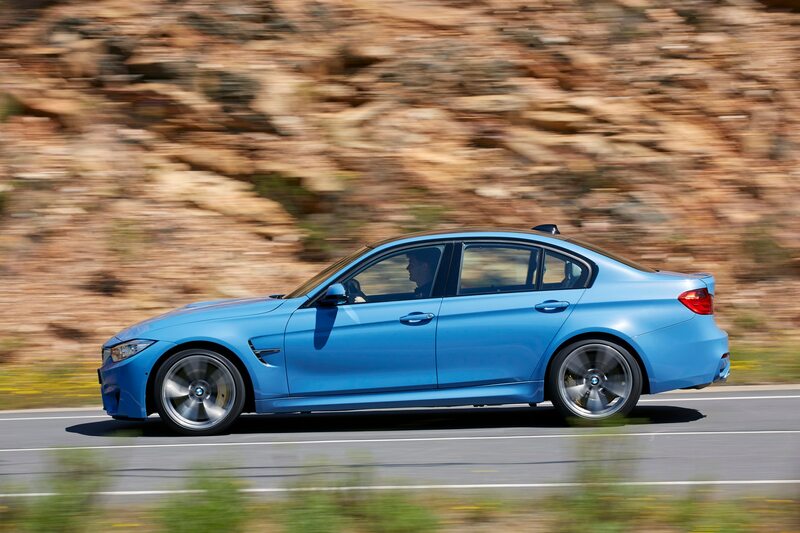 The low-speed ride is, for instance, disappointingly brittle, and body roll is occasionally an issue. 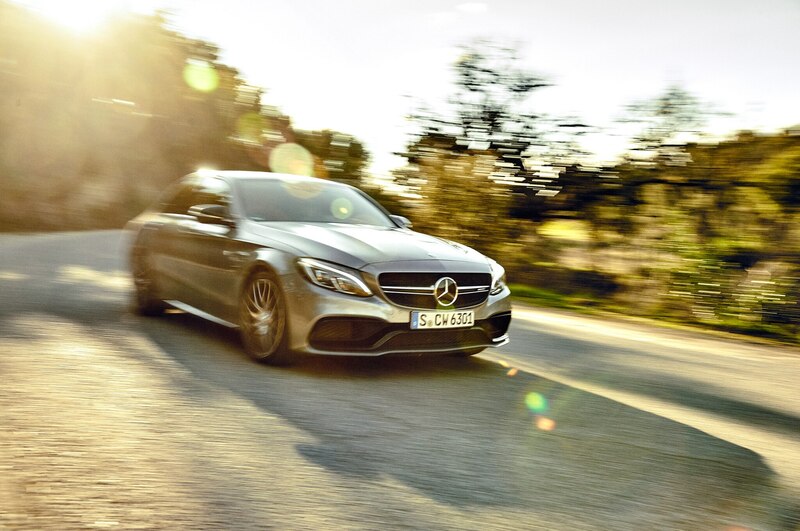 And when it comes to crunch time, the C63 AMG will try to ever so slightly understeer out of trouble. 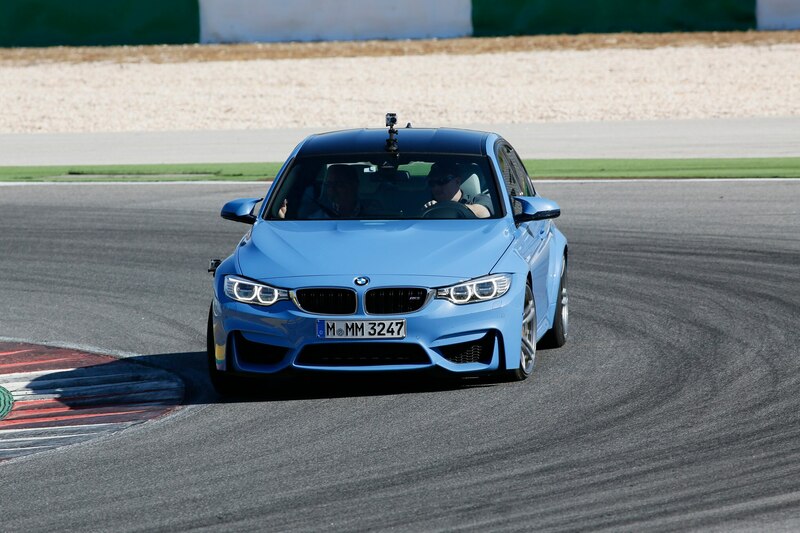 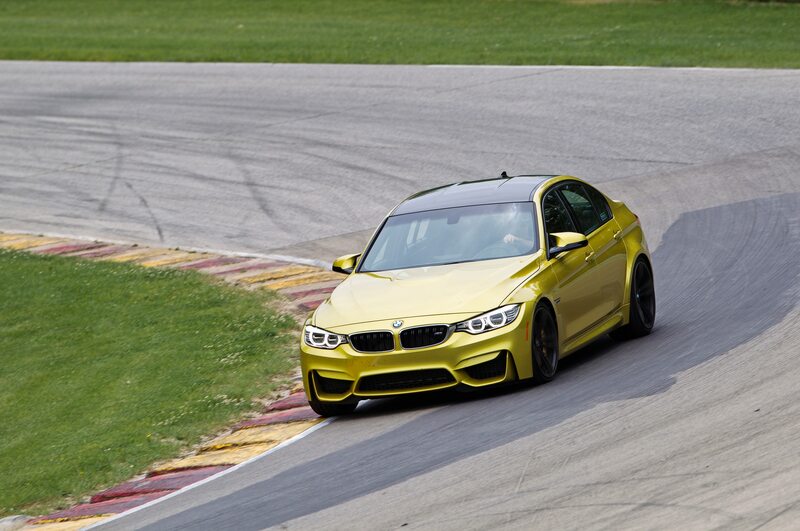 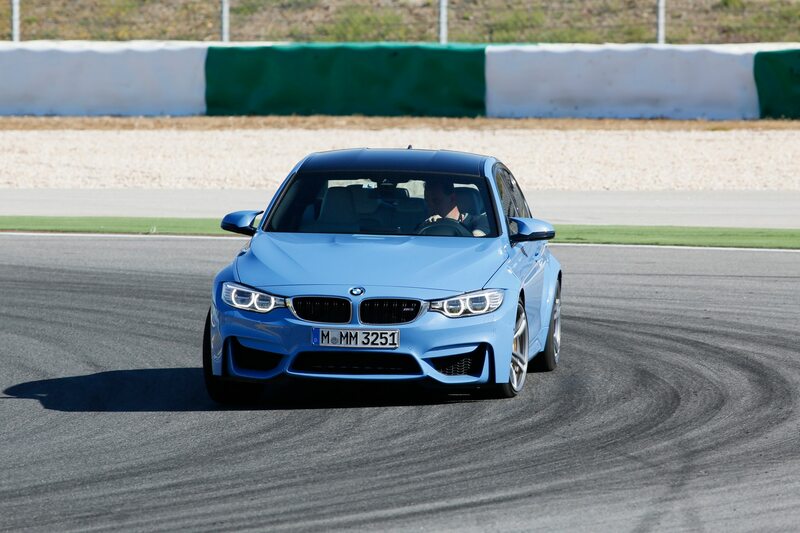 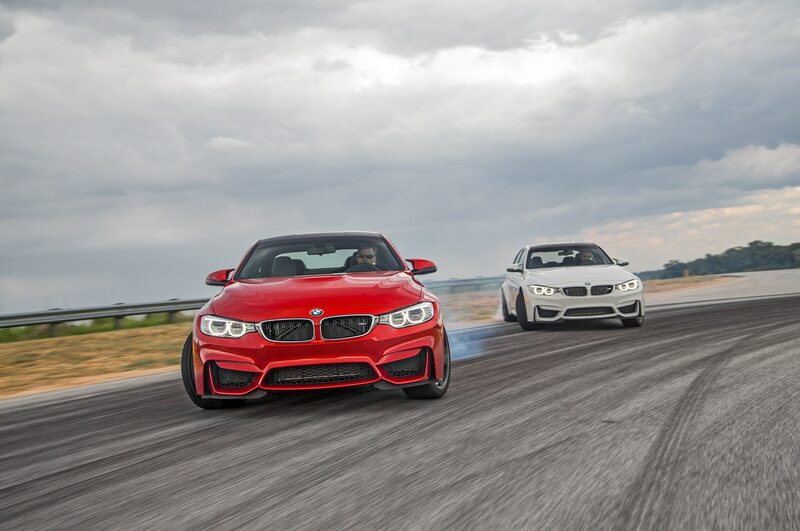 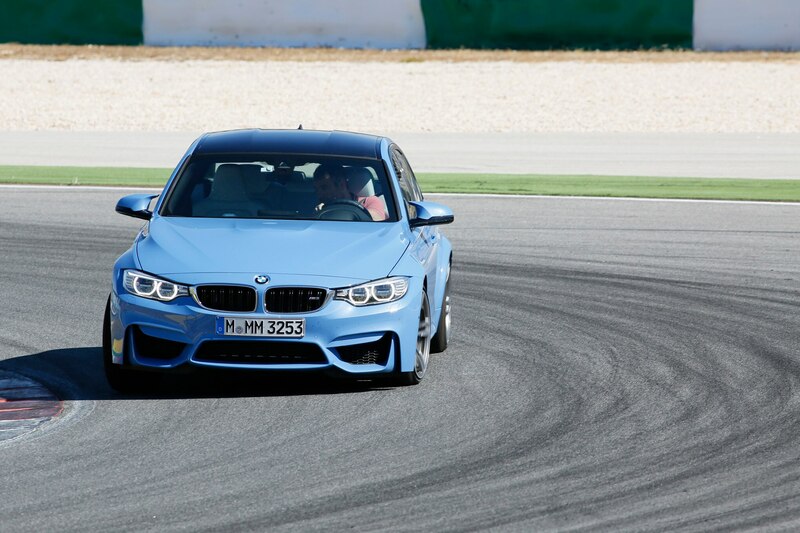 Through the same series of corners taken at comparable velocity, the M3’s nose bites, turns in, and holds the line. 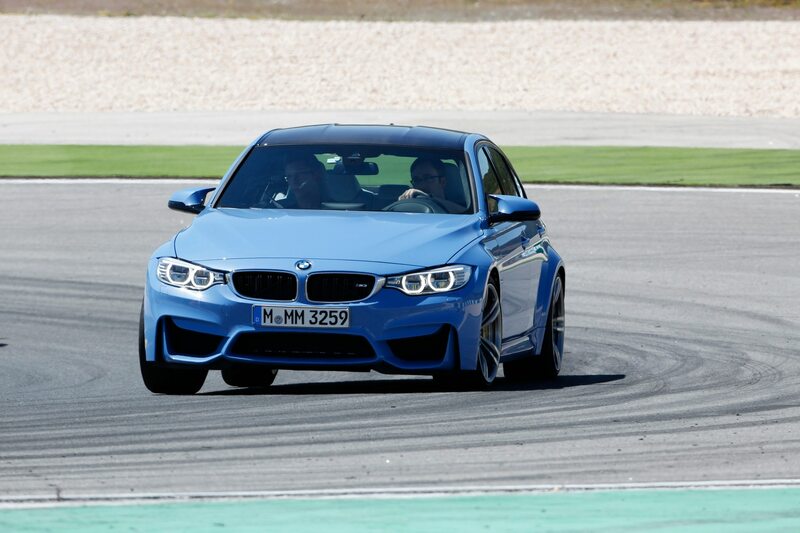 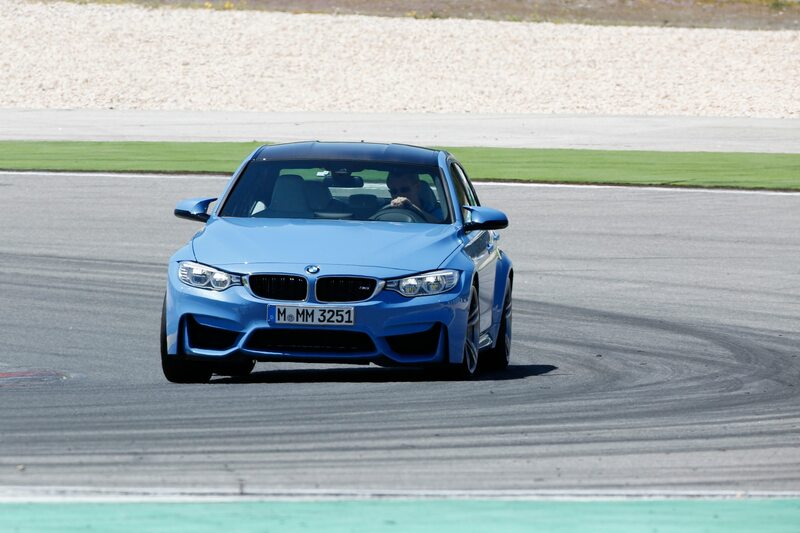 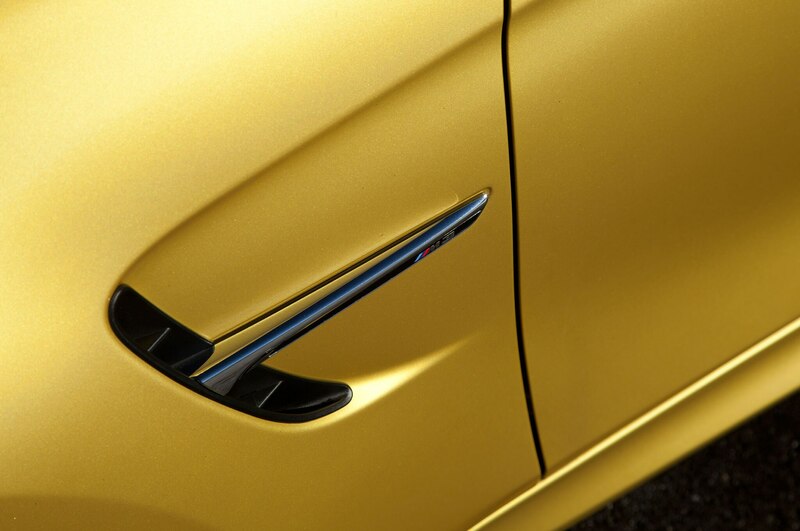 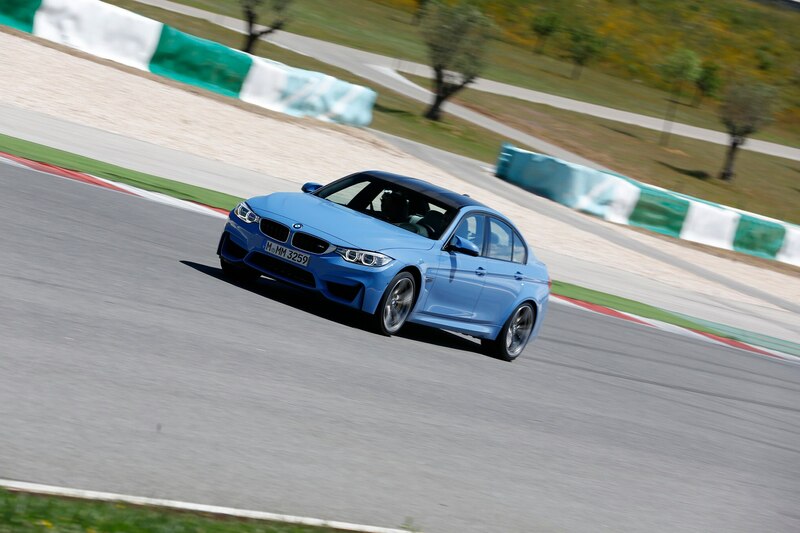 And if all else fails, the M3 still has an old-fashioned hand brake to yank in the hairpins. 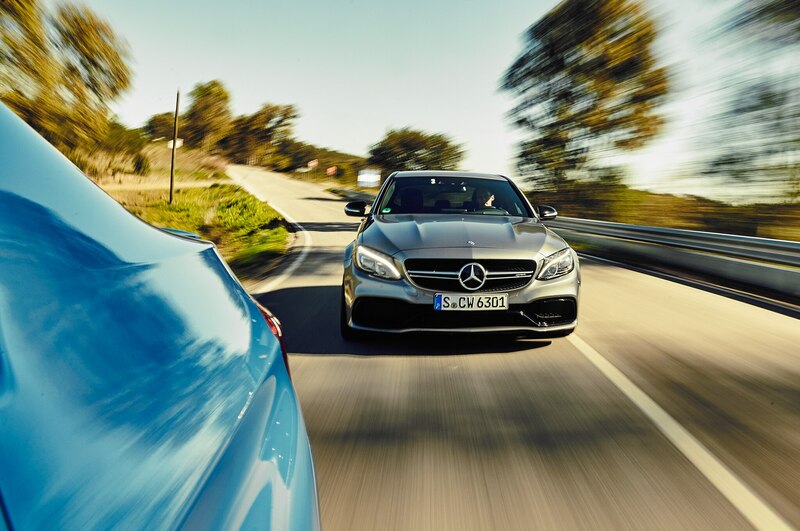 The Mercedes is nearly invincible in two areas: traction and deceleration. 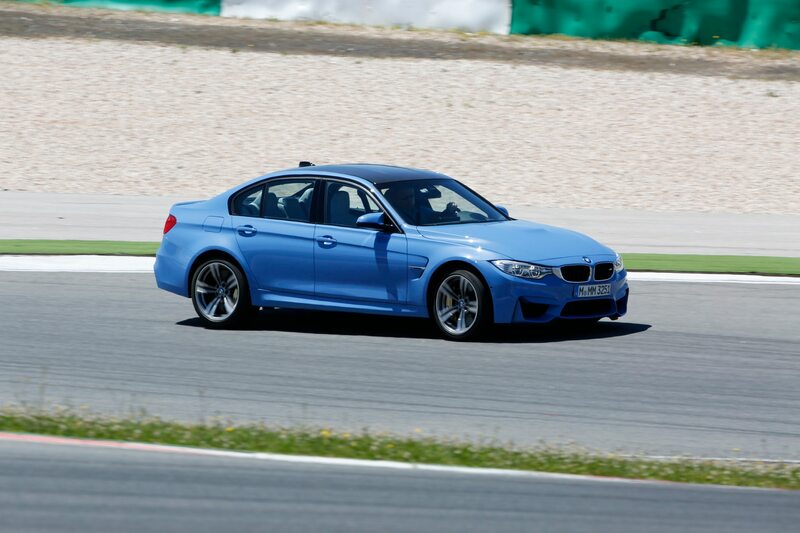 Even with stability control in permissive Sport handling mode, you can floor the throttle ridiculously early, well before unwinding the steering. 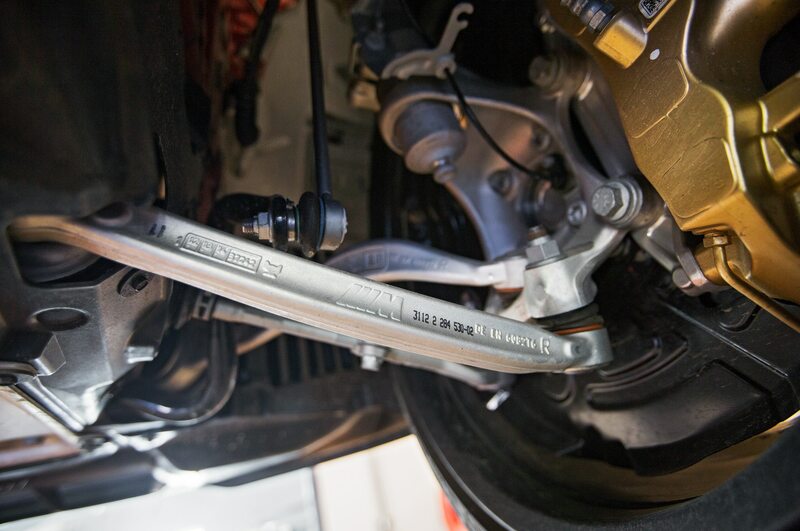 Although stability control will step in eventually and adjust the trajectory, it’s the mechanical rear differential that performs magic by feeding exactly the right amount of torque to each of the rear wheels at exactly the right time. 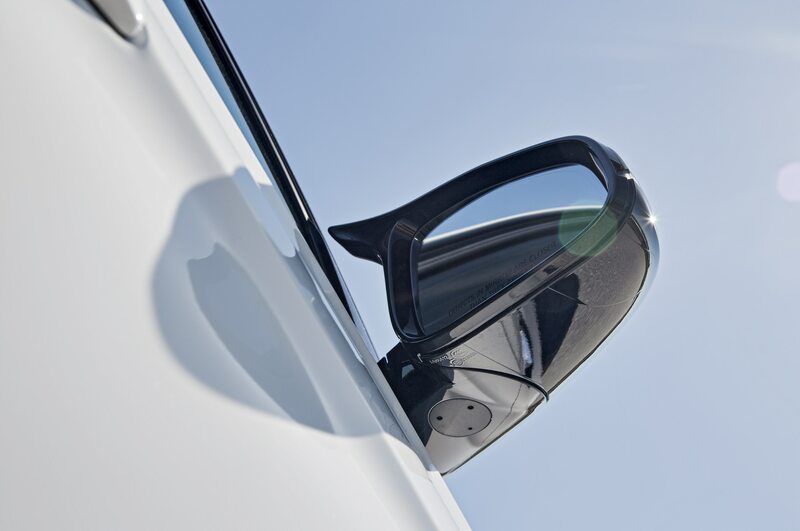 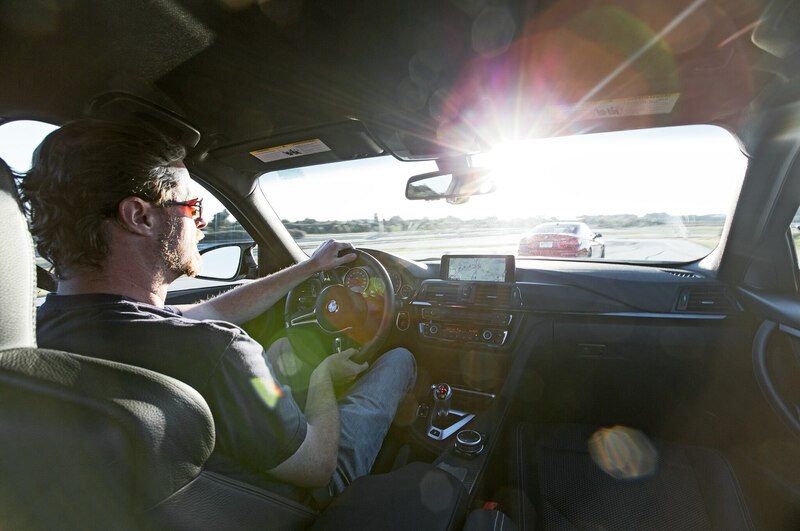 By doing so, it helps maintain the proper dynamic flow, and it manifests what might be best described as blind dialogue between driver input and vehicle response. 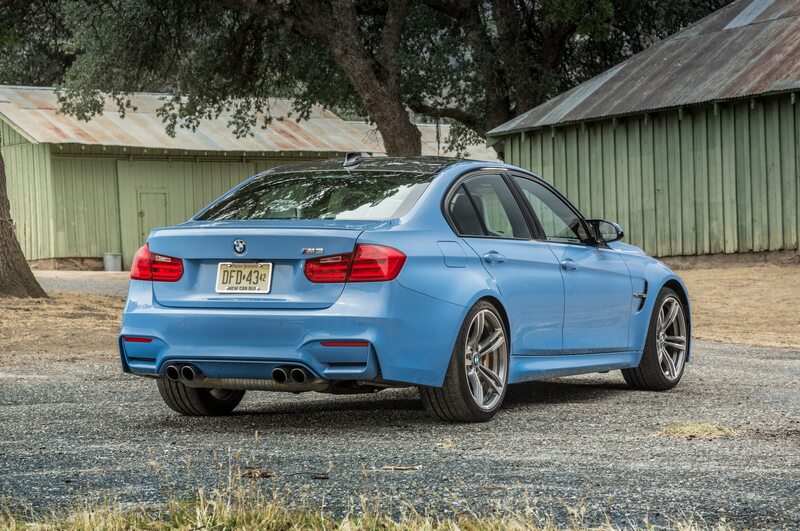 The M3 is, in contrast, ragged and uncouth, but is also more entertaining. 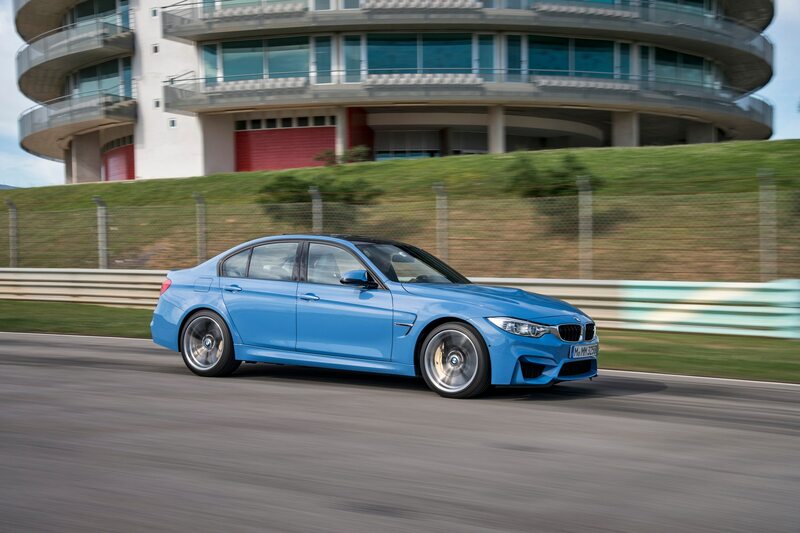 An electronically controlled rear differential—an option on the C63 but standard on the M3—tends to whip the car through tight corners in zig-zag, grip-no-grip fashion. 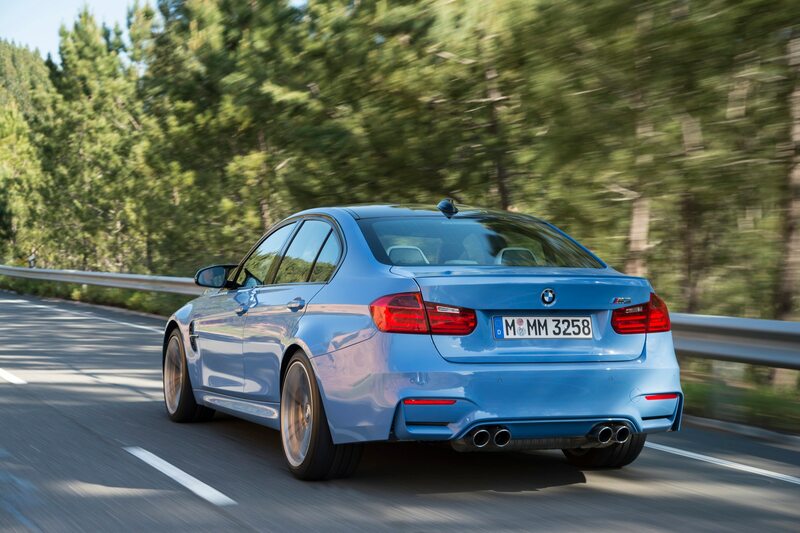 We’re not saying it’s a 1980s 911 Turbo, but it is a letdown compared to the totally unruffled C63. 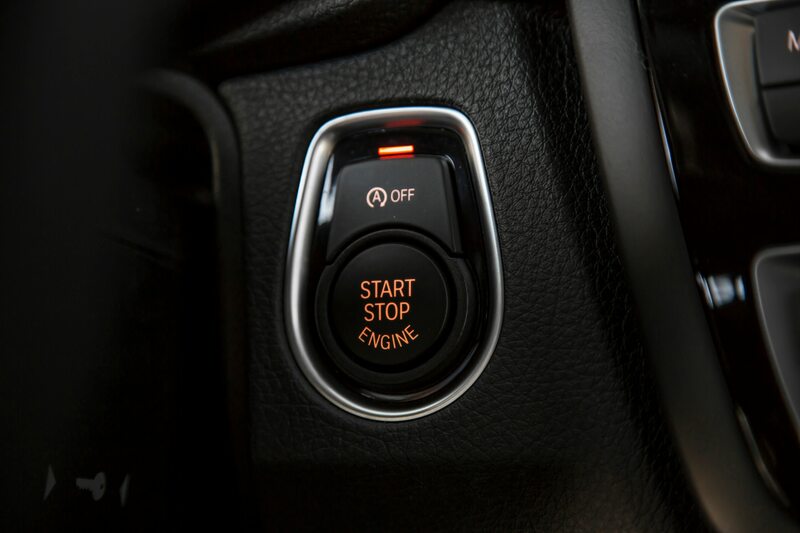 There is a way to erase this behavior for good: Keep the ESP button pushed for more than 5 seconds, check the pacemaker one last time, and then go for it. 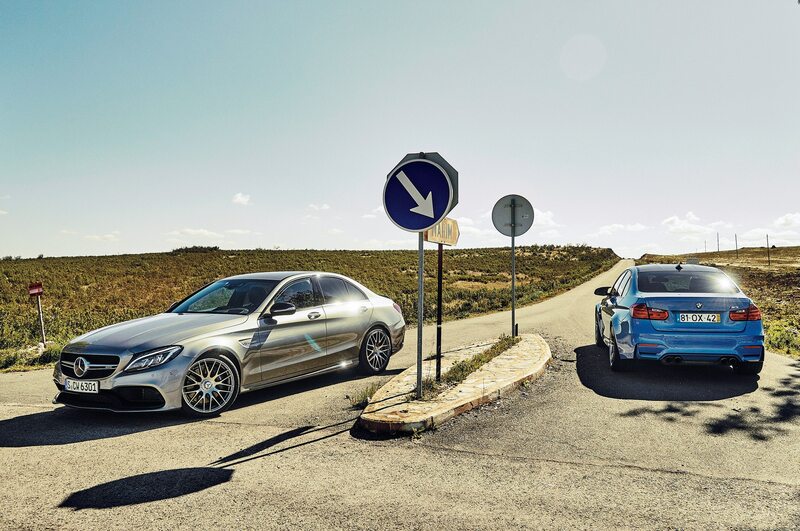 The BMW almost always let go first at the rear; the C63 will in all likelihood not let go at all. 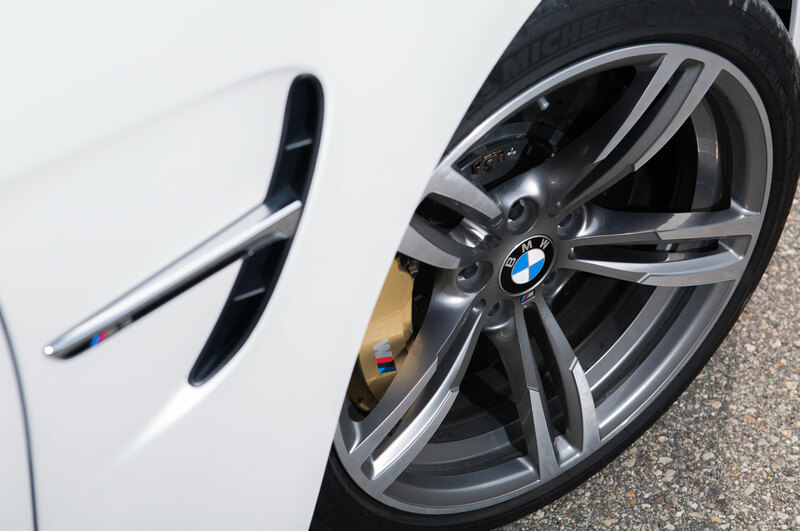 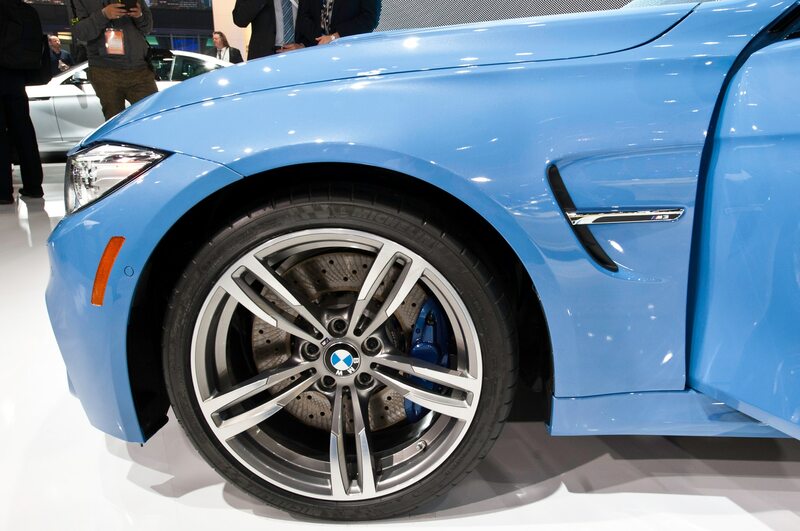 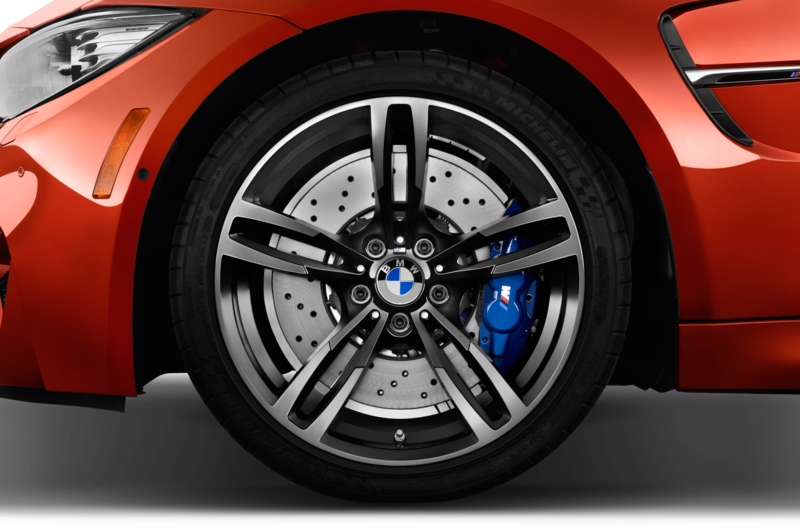 This BMW should have had a clear braking advantage, as it came equipped with optional carbon-ceramic rotors (also offered on the C63 but not fitted on our test car). 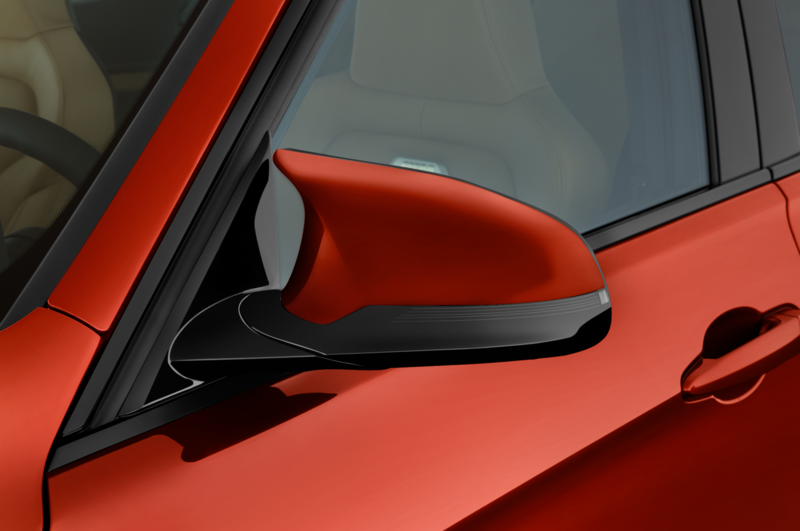 However, it could have used fresh pads. 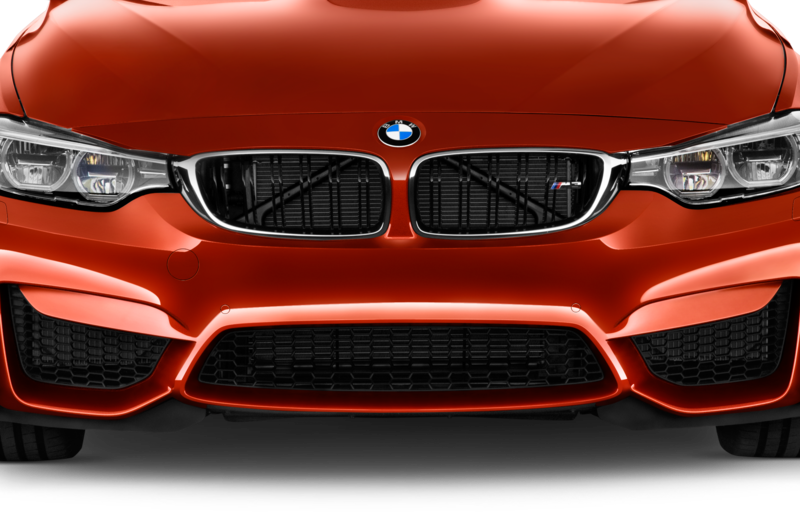 Fading was not an issue, but we expected more bite, more instant action, and more feedback. 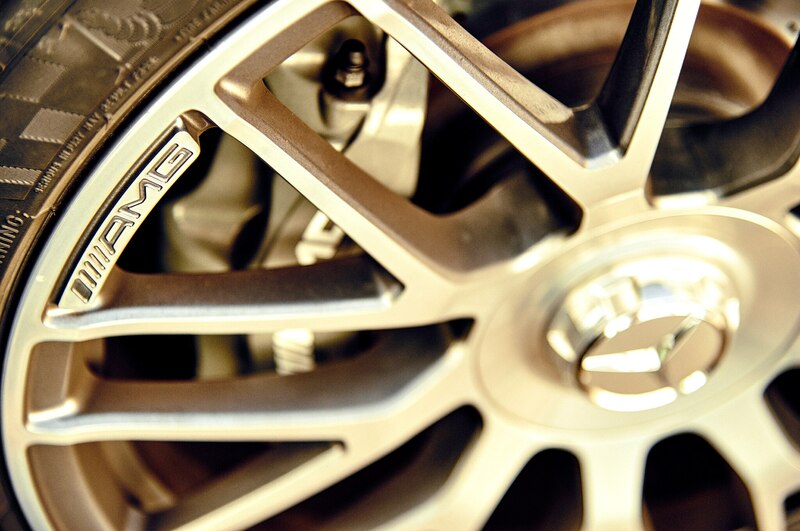 The C63, with its standard steel rotors, delivered all that. 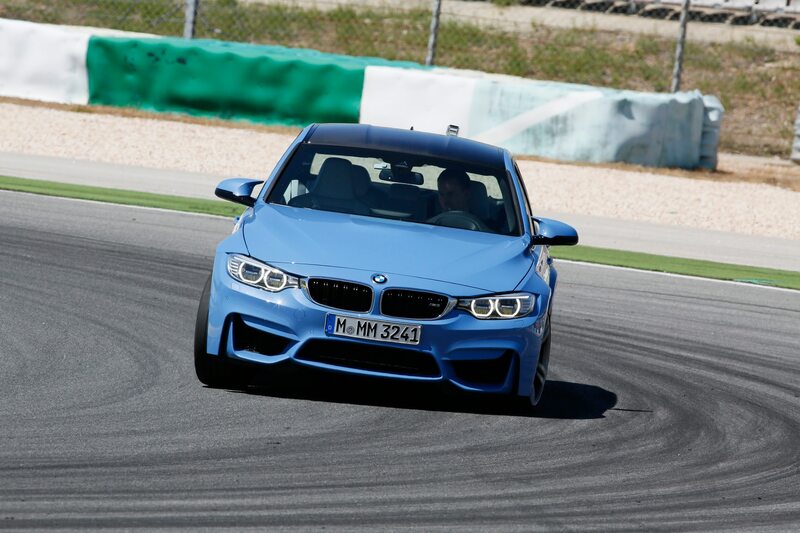 The brakes operated with in-your-face urgency yet were easy to modulate. 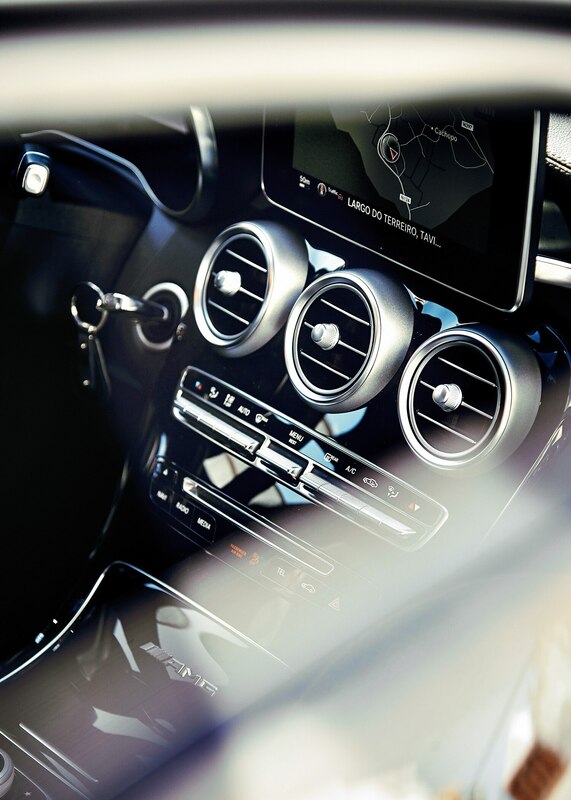 They stopped us with no drama no matter how late we slammed the pedal. 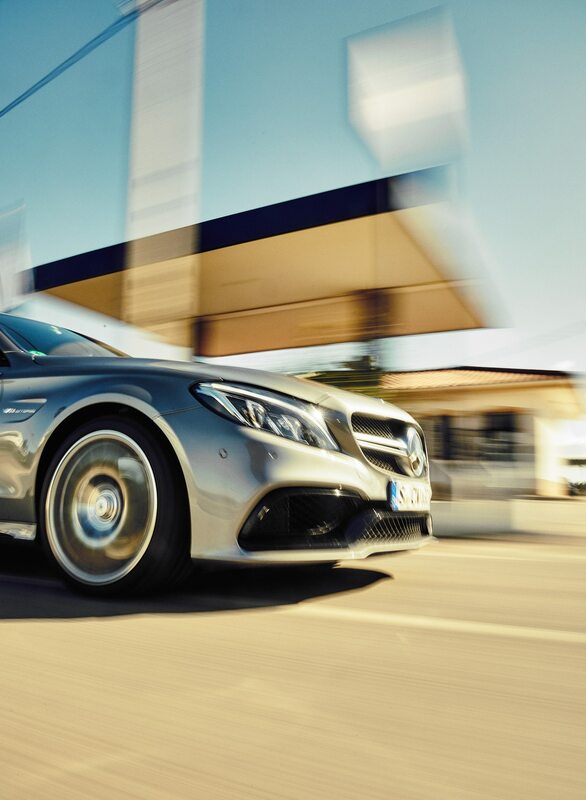 Because they slow the forward thrust with sensitivity and insistence, brakes are also an integral element of the C63’s utterly composed character. 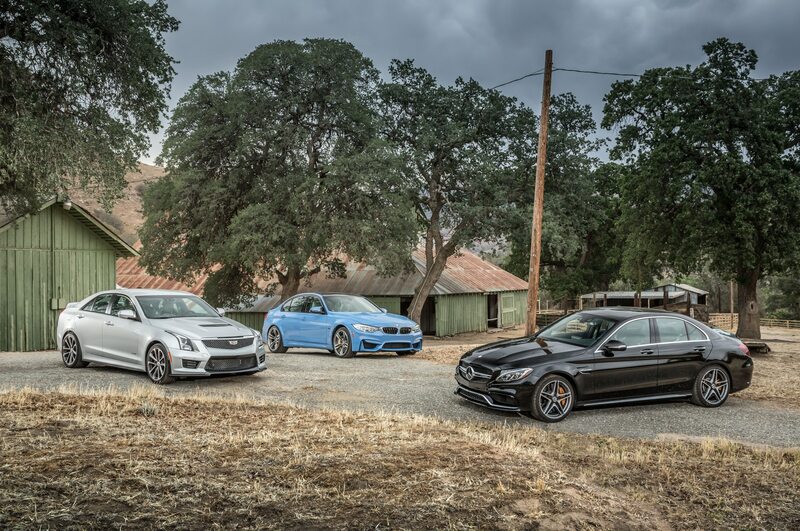 At the end of a 23-mile sickbag stretch driven with a knife between our teeth, the left pedal felt a little soft in the Mercedes, and it needed a somewhat more determined hoof to perform the act. 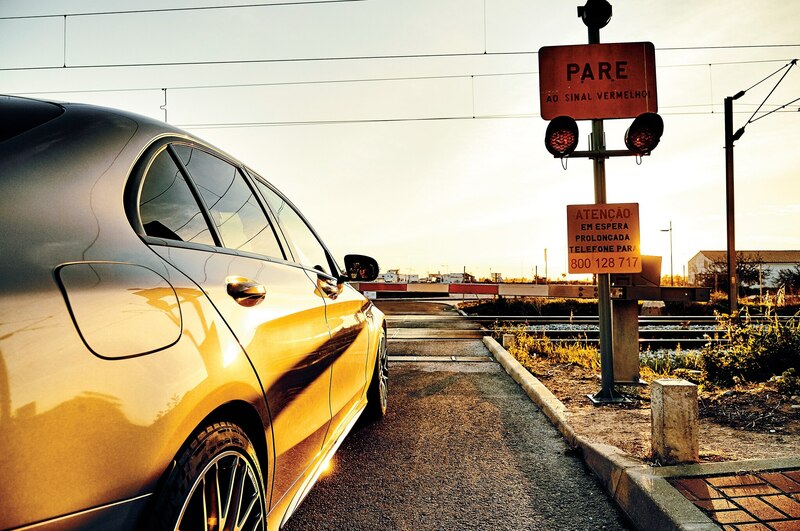 But all in all, this stopping apparatus deserves five stars out of five. 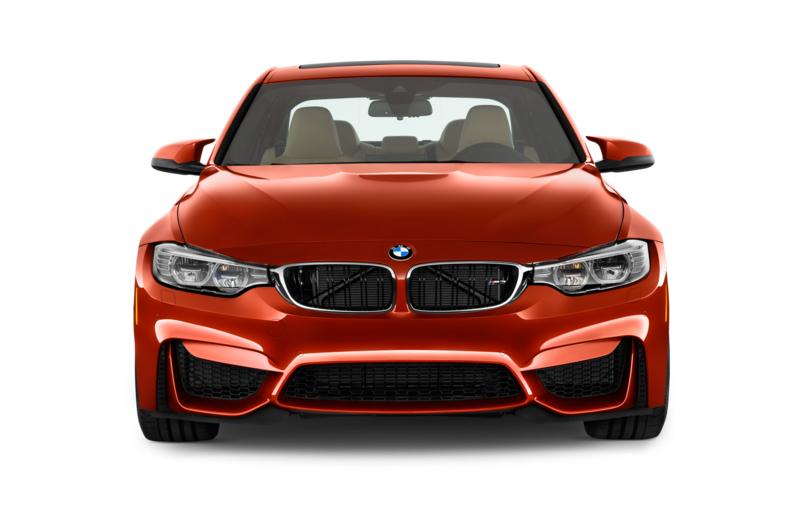 The days of hydraulic steering are history, but fortunately so are the days of overly light, strangely artificial electric power steering. 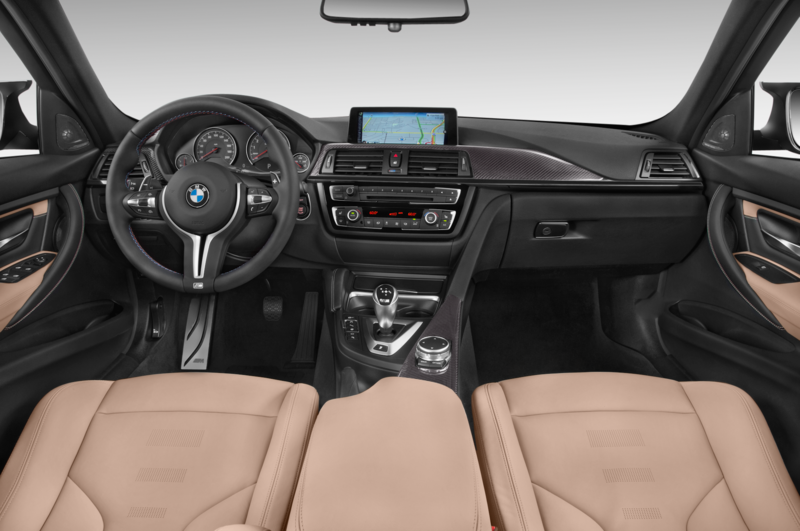 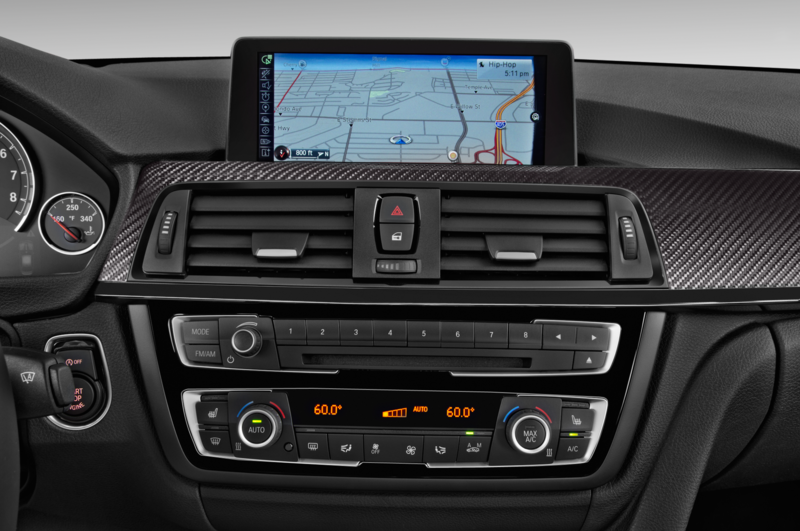 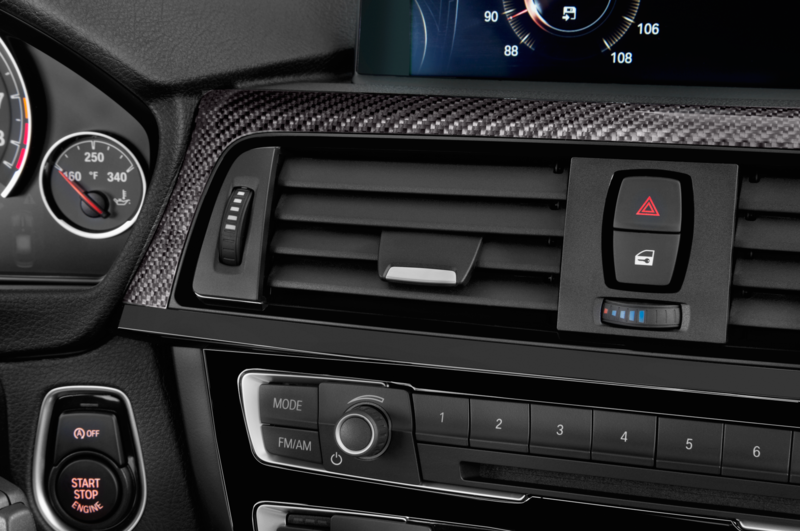 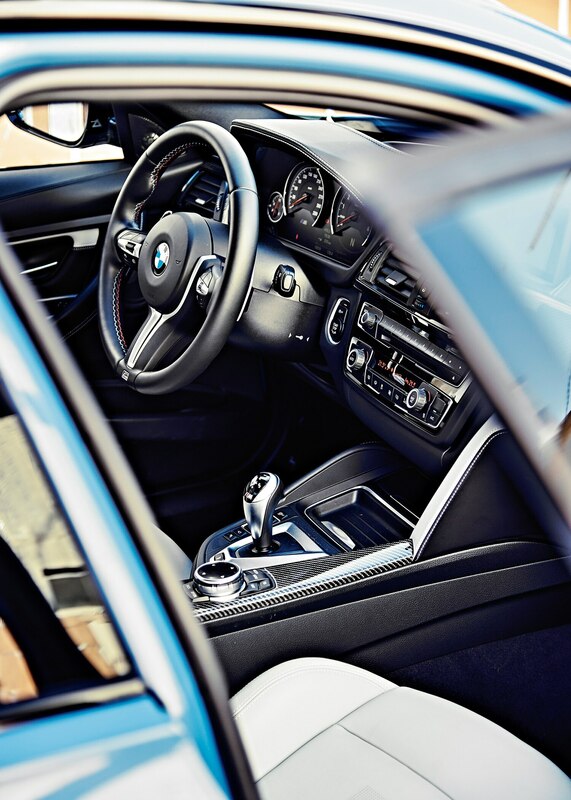 In the BMW, the steering adjusts for effort as well as the ratio. 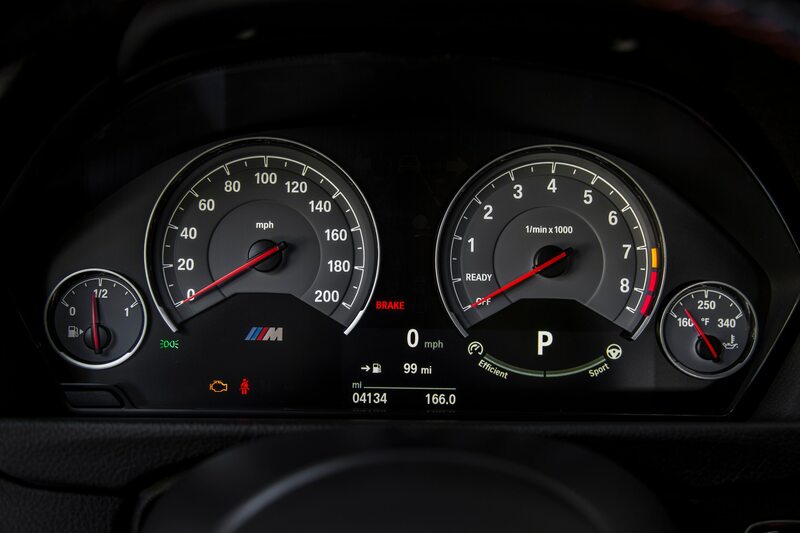 There are the three usual calibrations to select from. 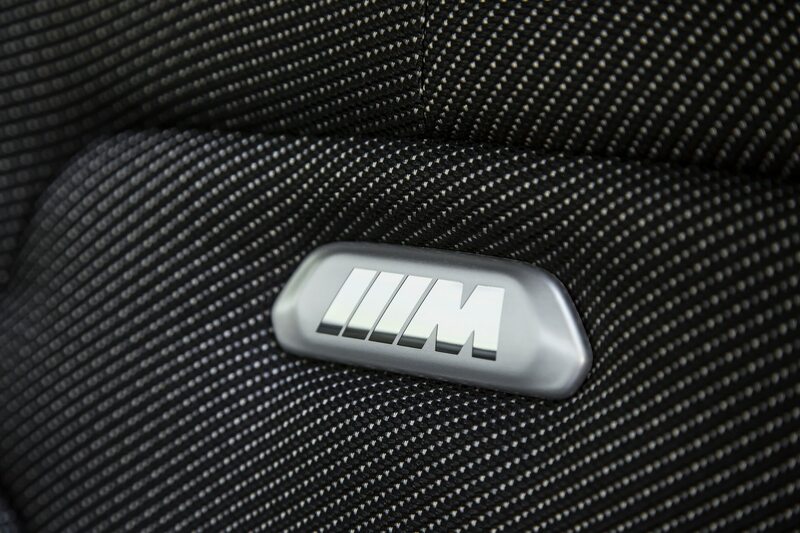 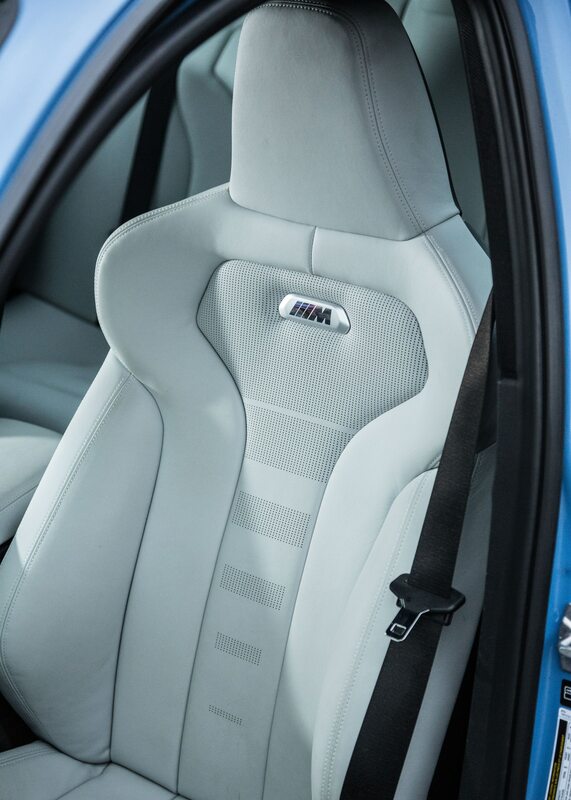 Even in Comfort mode, there is a reassuring stiffness that follows your hands as they apply more lock, but unlike in the M5, it’s not overly heavy. 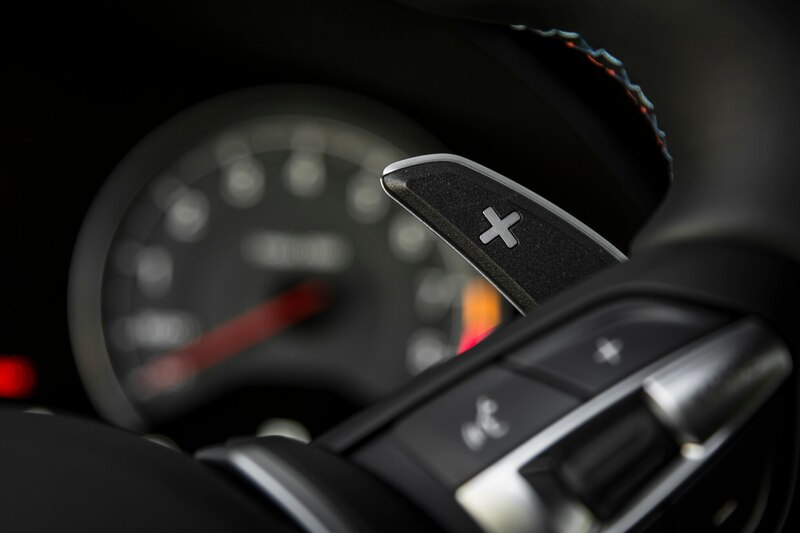 Self-centering is quite subtle, and the gearing is perfect for quick flicks. 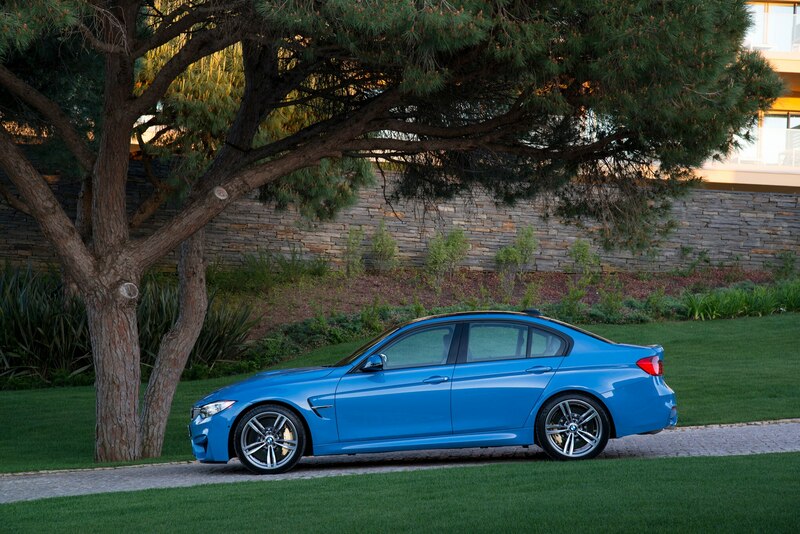 Above all, it’s dead-on accurate. 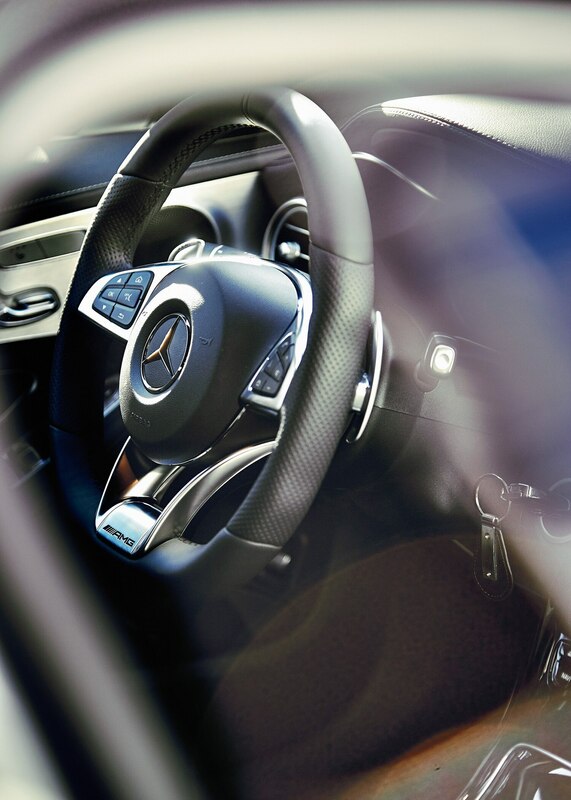 Mercedes’ variable-rate steering is lighter, more forthcoming, and more linear. 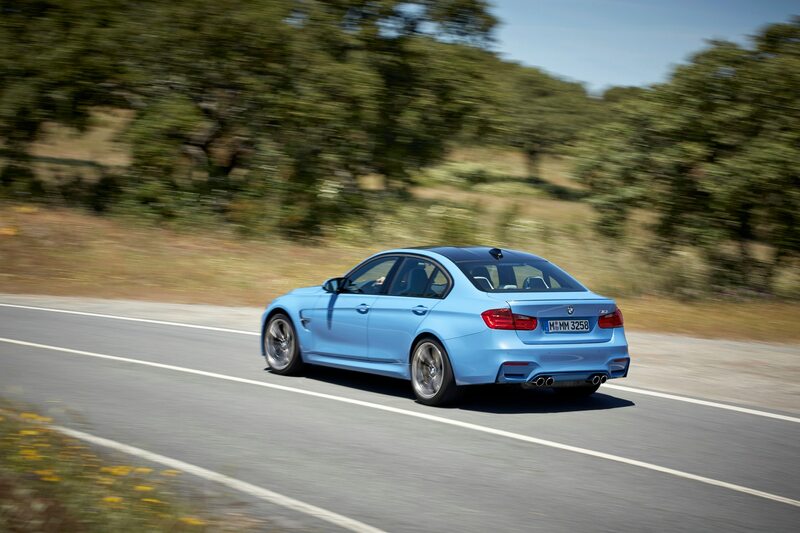 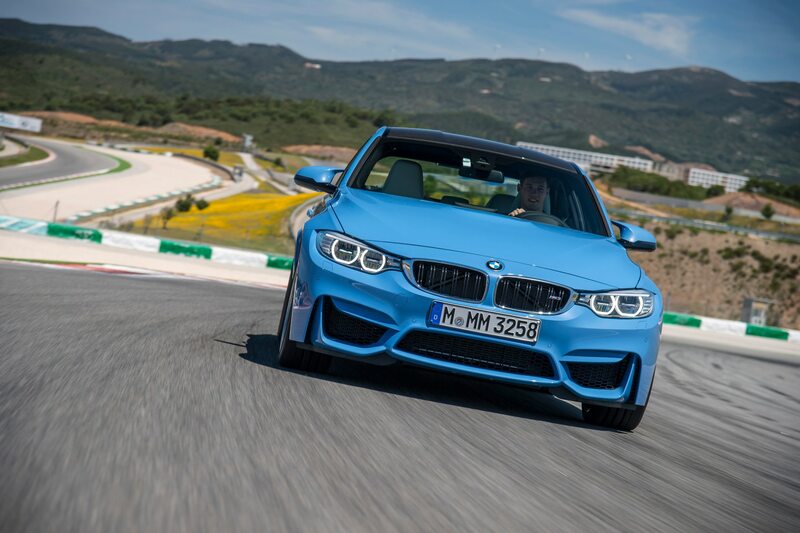 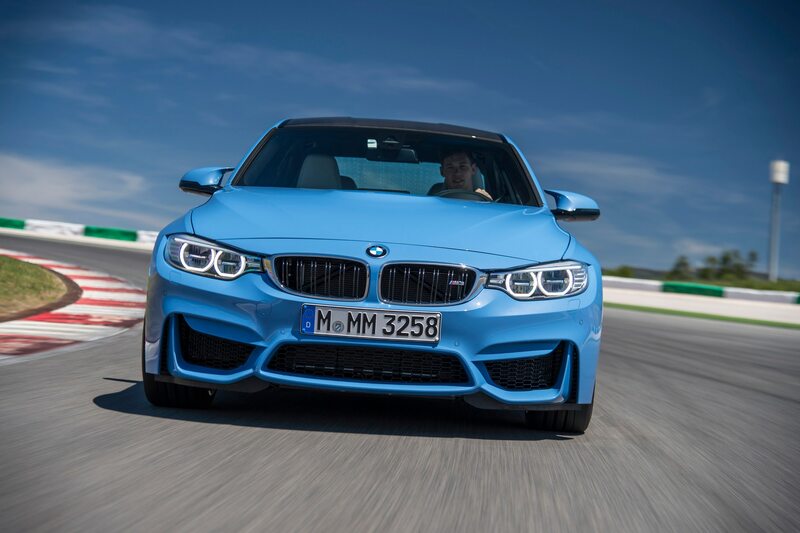 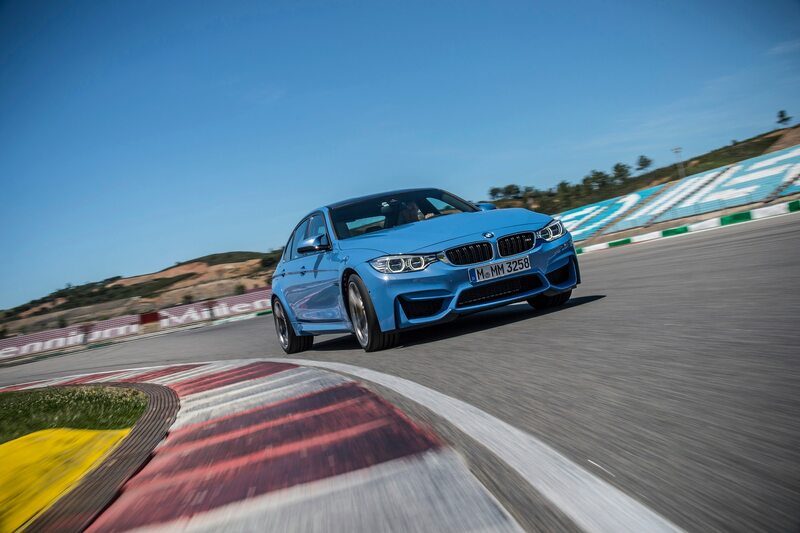 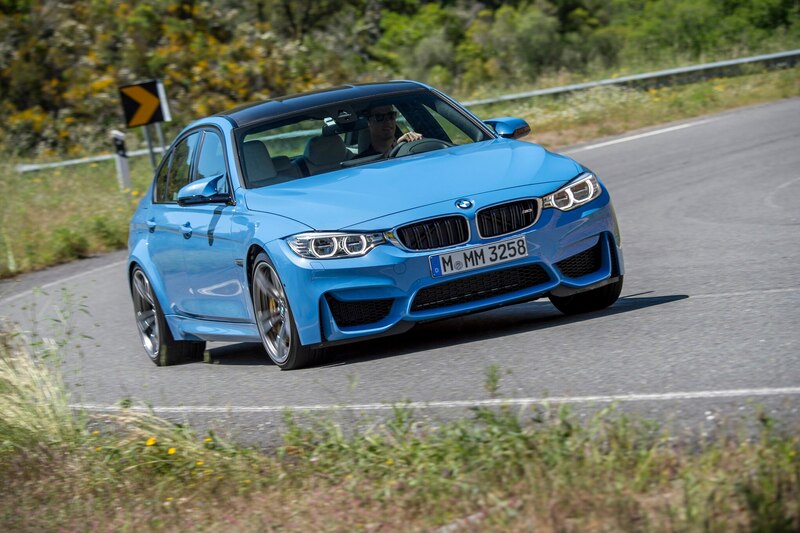 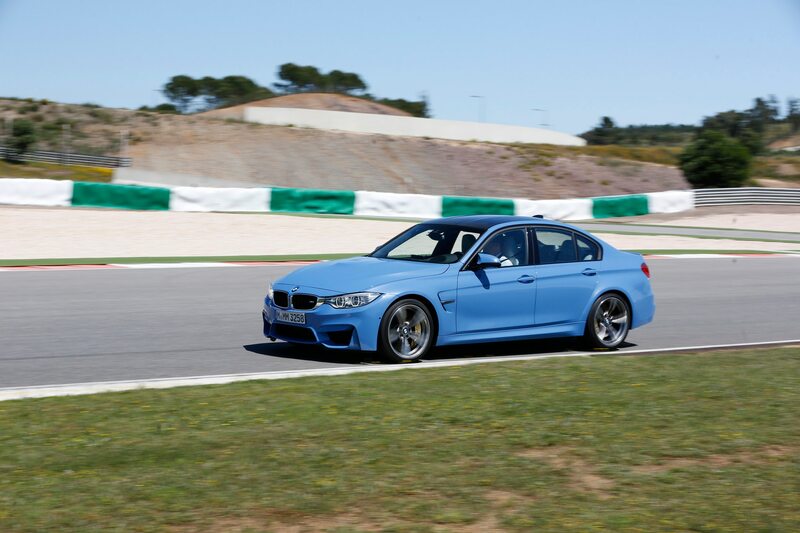 It is tuned for positive and fuss-free changes of direction, and that is totally in line with the car’s more laid-back character if not as spot-on attentive as the M3’s tiller. 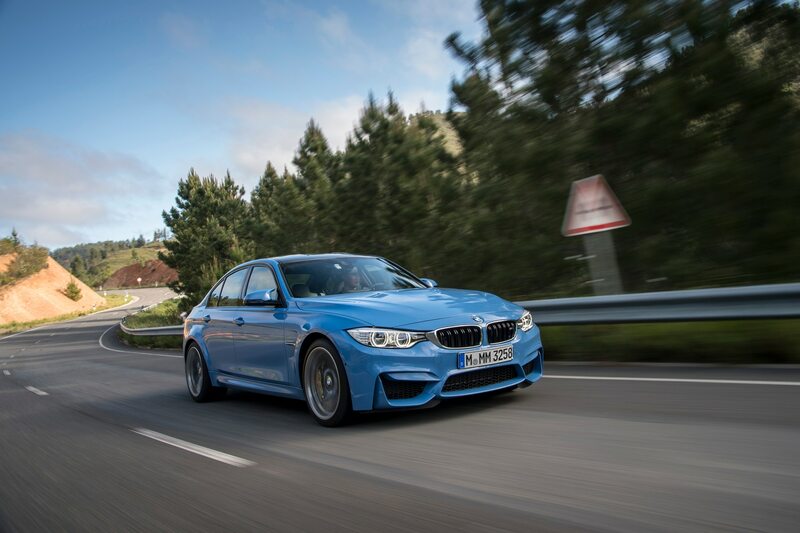 As far as smiles per mile go, it’s a much closer shave. 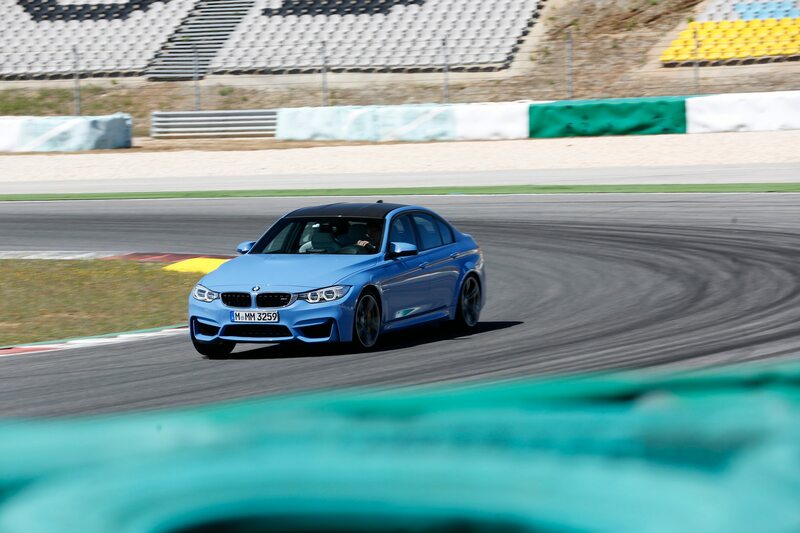 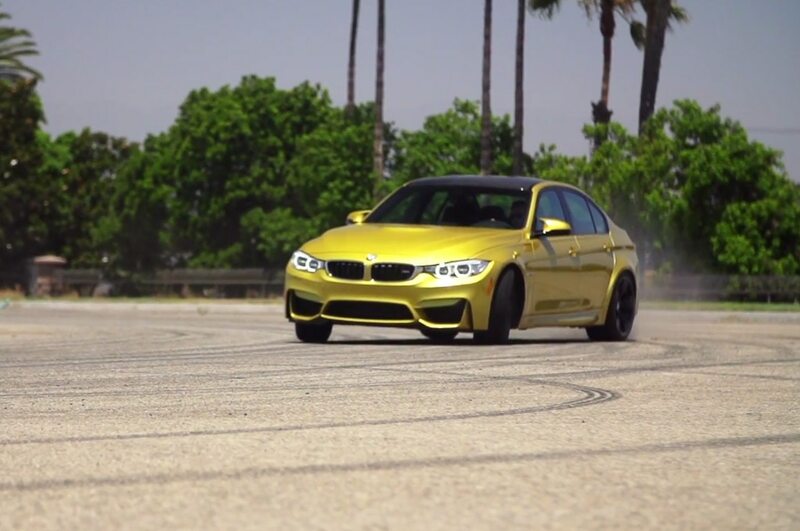 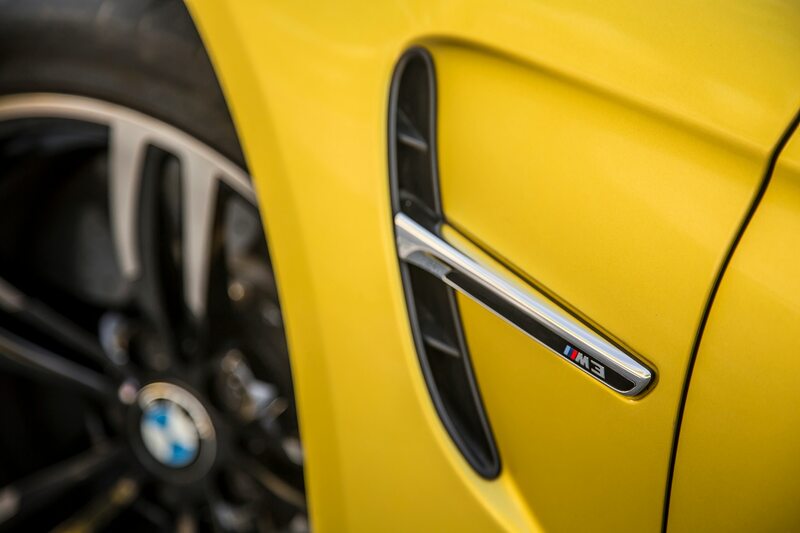 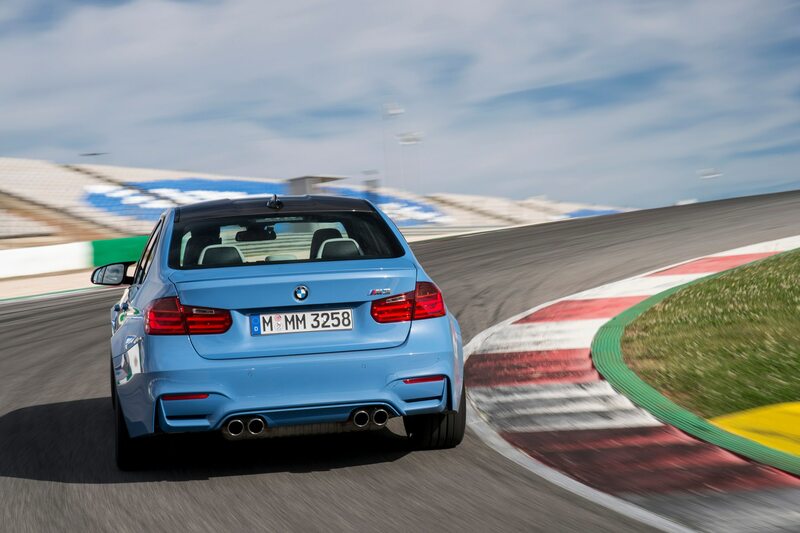 The M3 provides more old-fashioned fun. 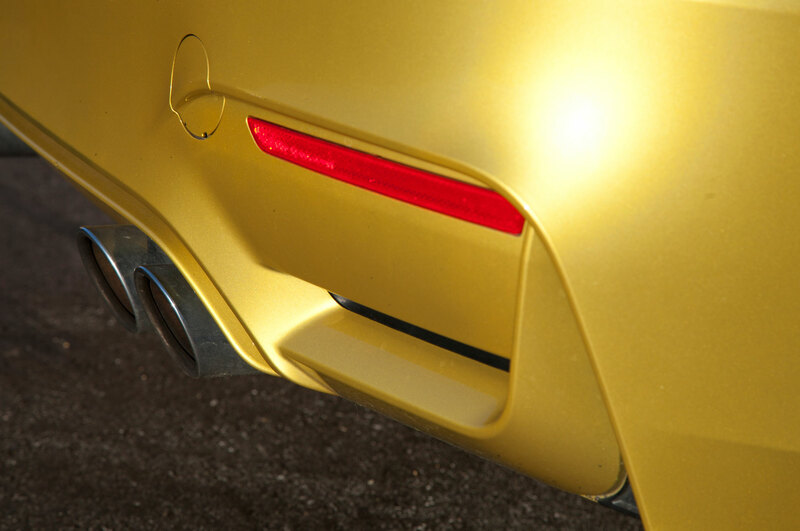 It turns in with the agility of a chameleon’s tongue, and it hangs on like a lizard to a vertical wall—until it eventually whips its tail like an angry croc. 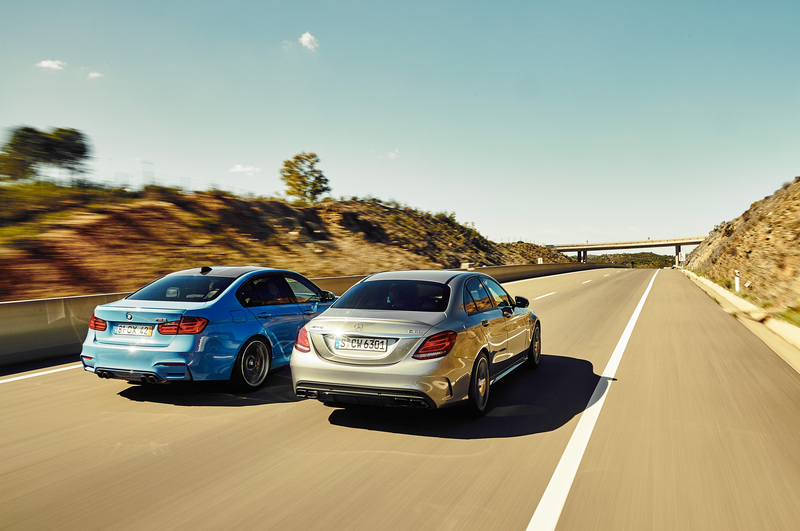 The BMW almost always let go first at the rear; the C63 will in all likelihood not let go at all. 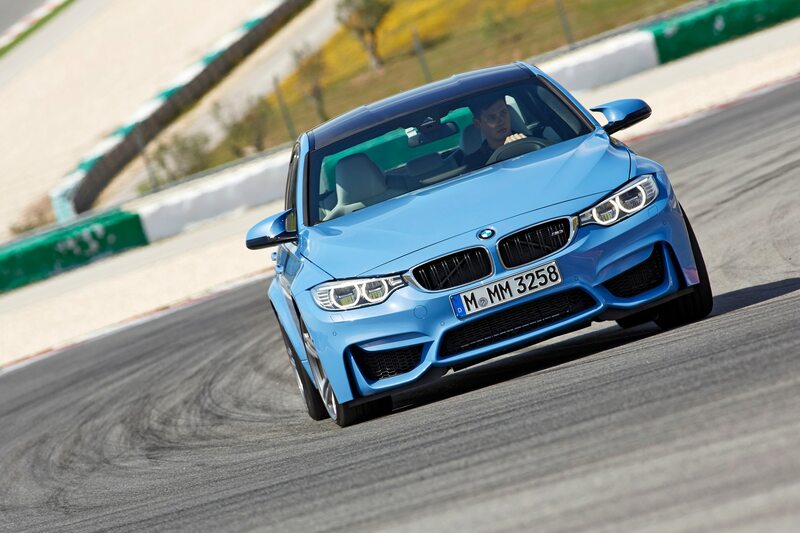 It blends tenacious grip with strong stability, and it handles in a reassuringly neutral fashion. 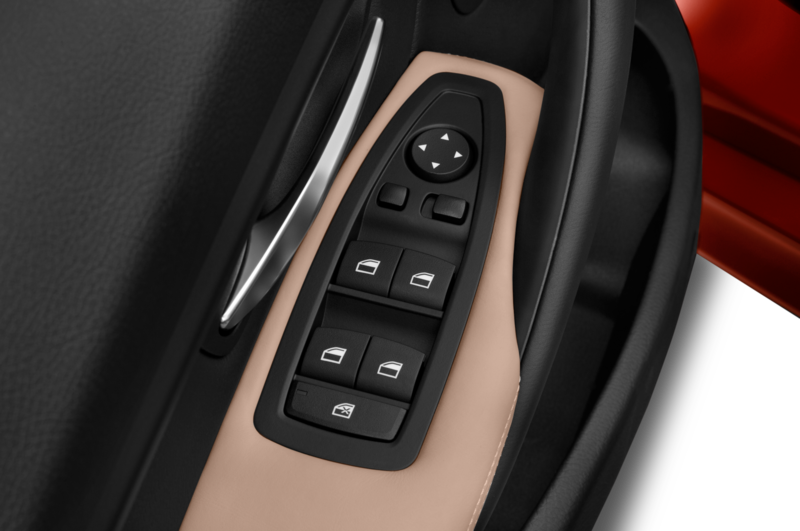 When we say neutral, we don’t mean boring. 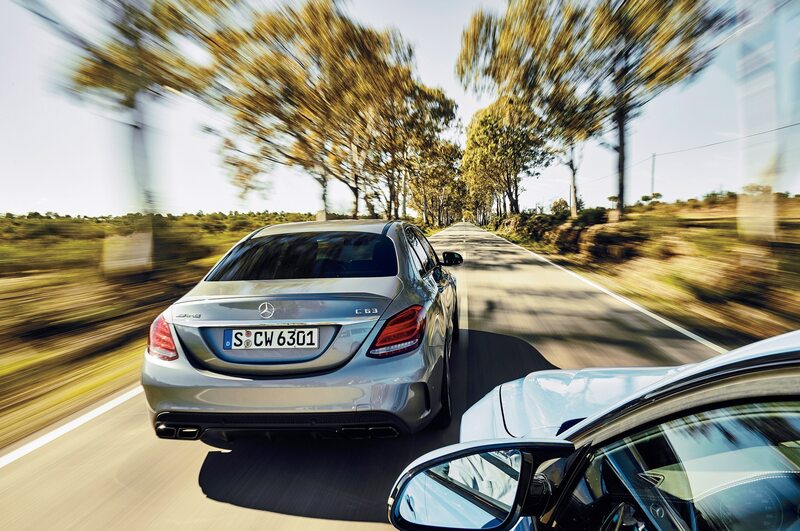 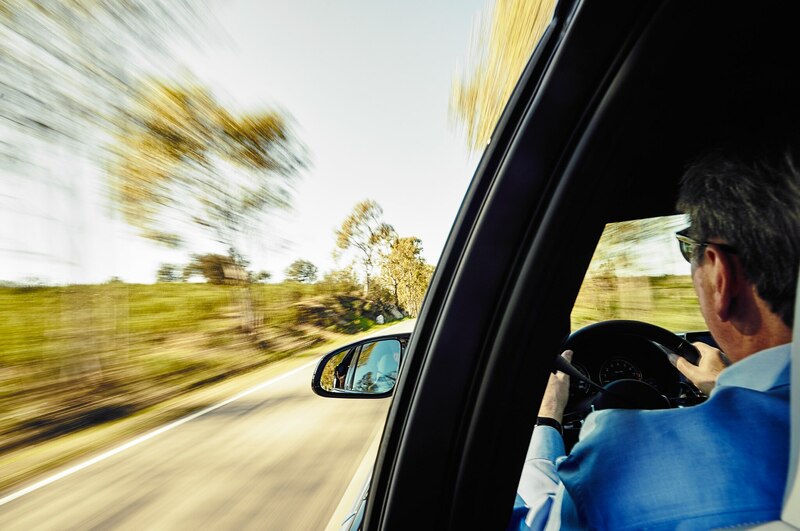 Just as you can induce a trace of understeer, you can coax the Benz into a mild drift—or a loud and long one with stability control deactivated. 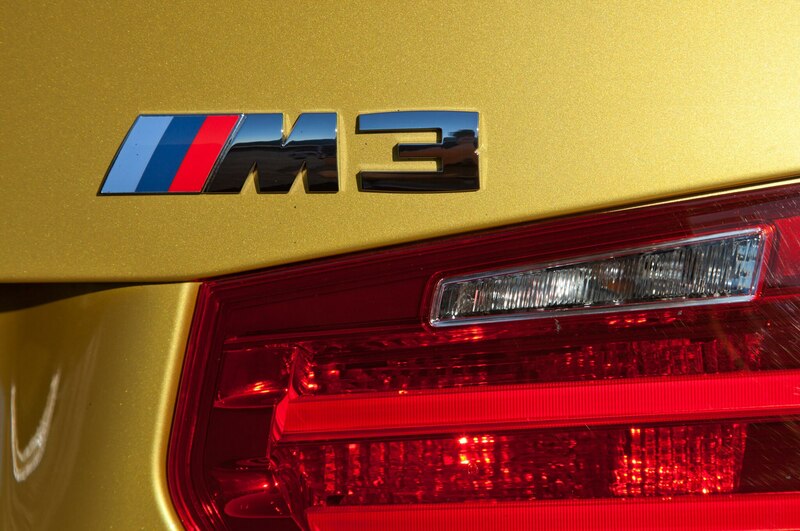 Seldom has it been more difficult to crown a winner. 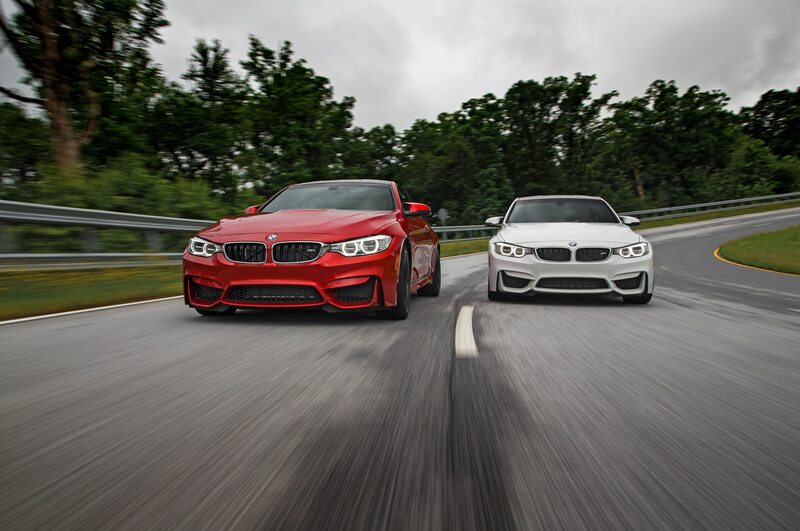 Although the two contenders were born on different planets, and despite the fact that they field diverse talents, they both reach similar heights, and both are pretty damn fun. 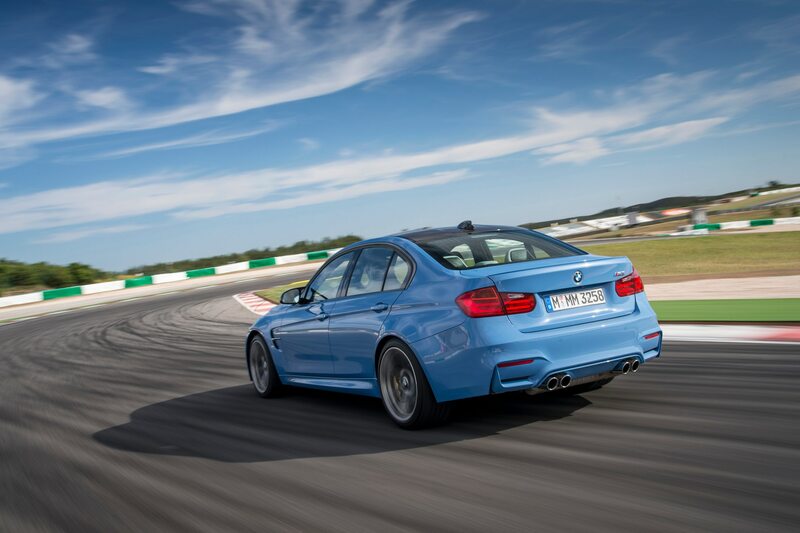 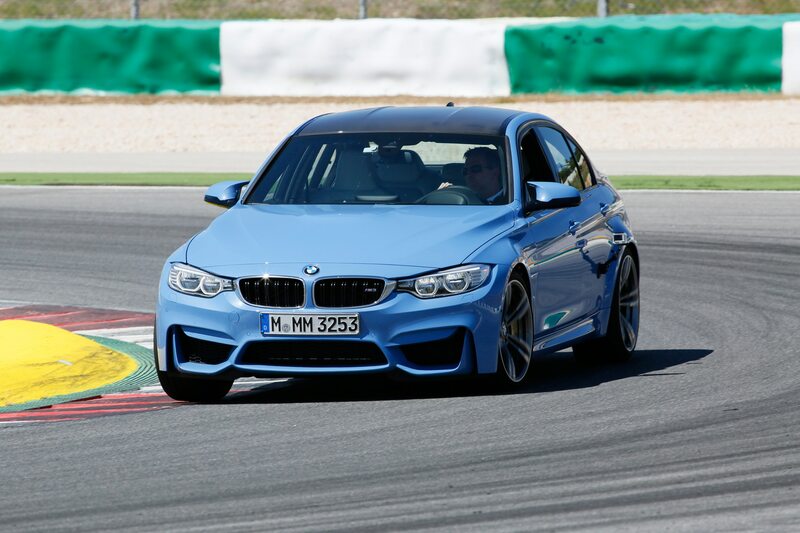 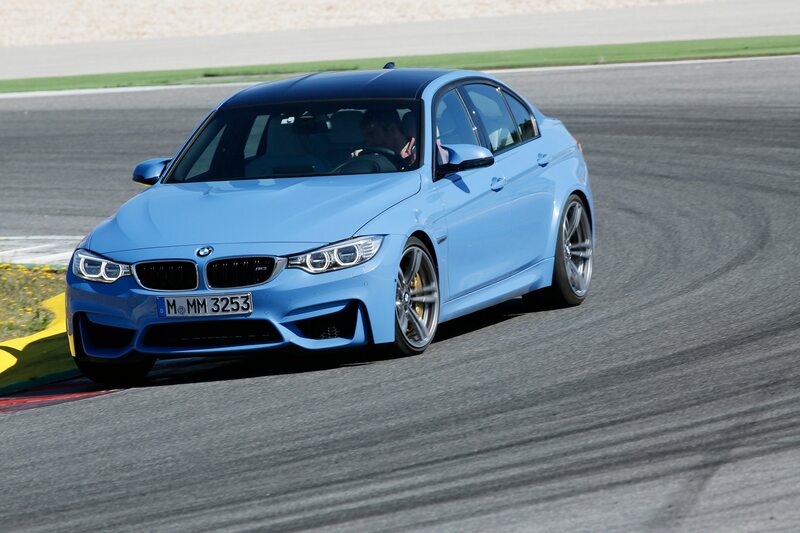 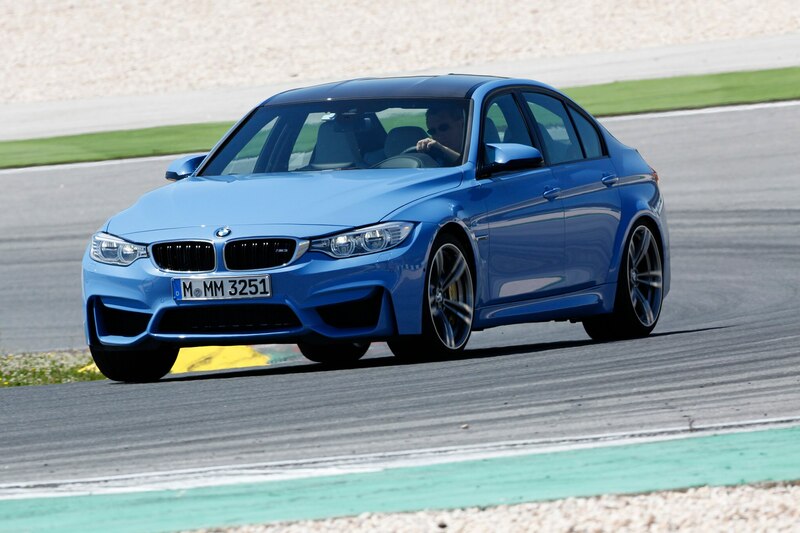 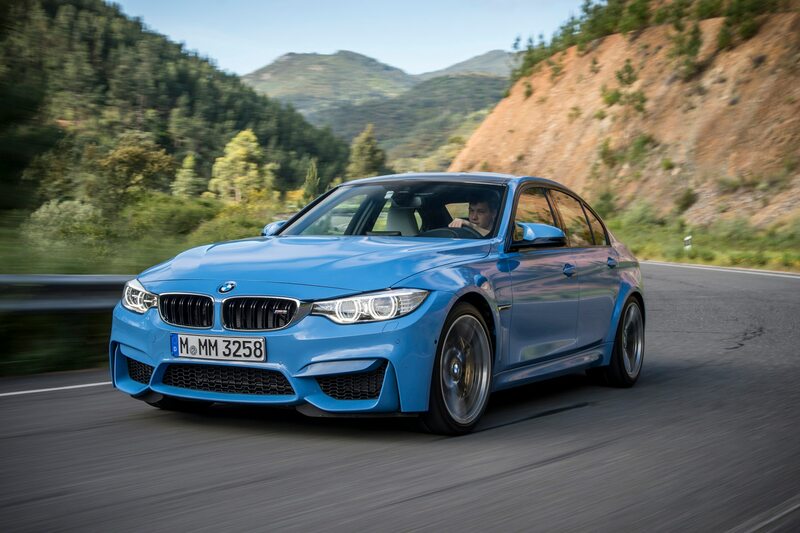 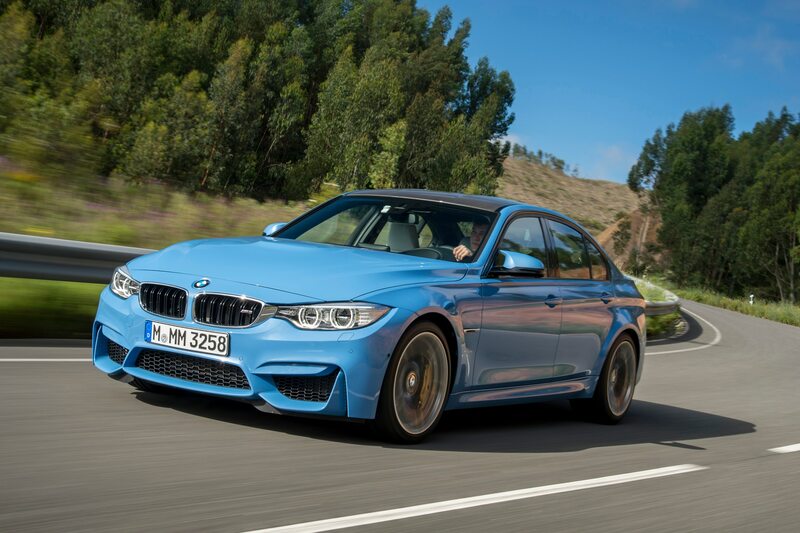 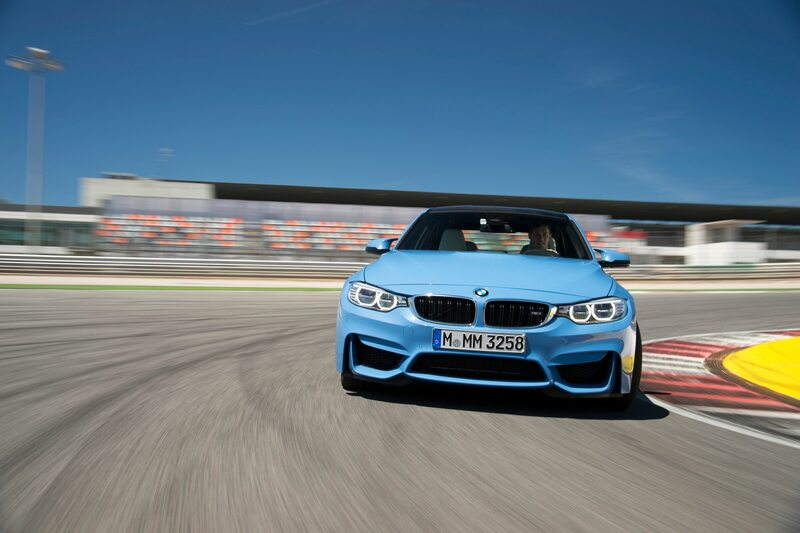 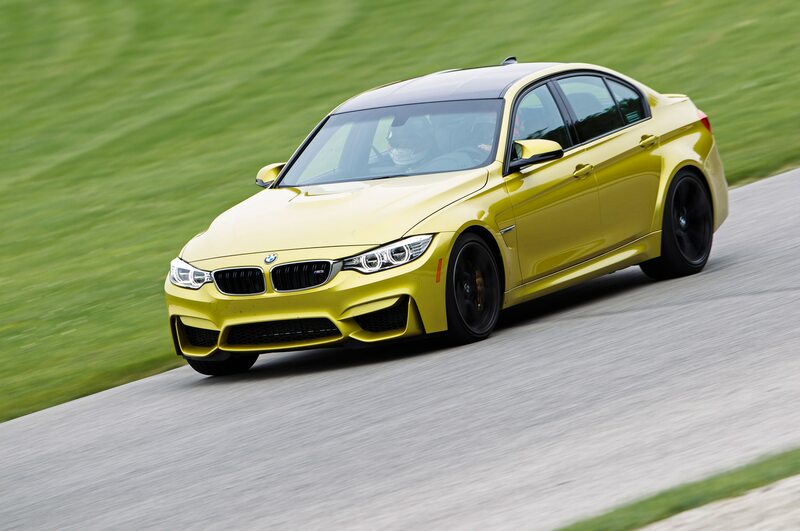 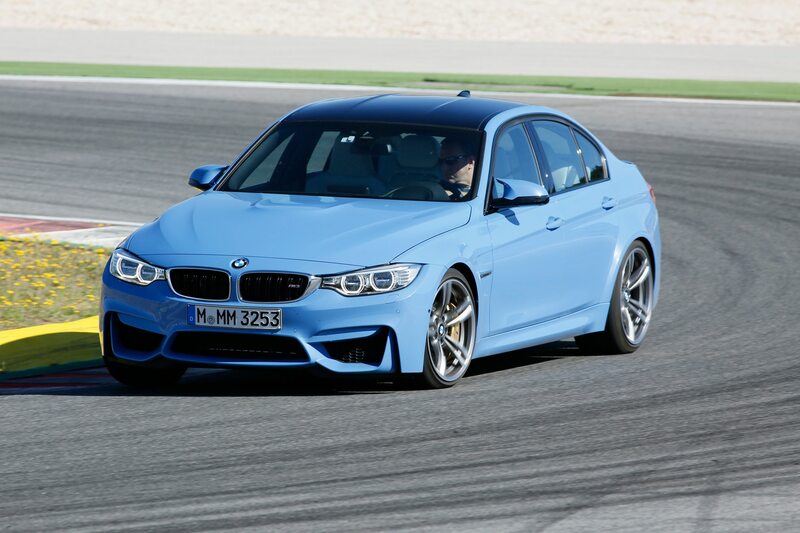 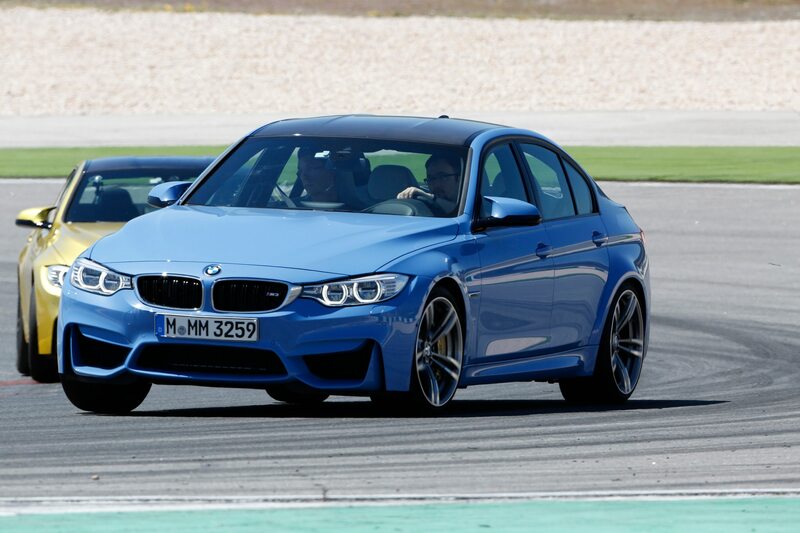 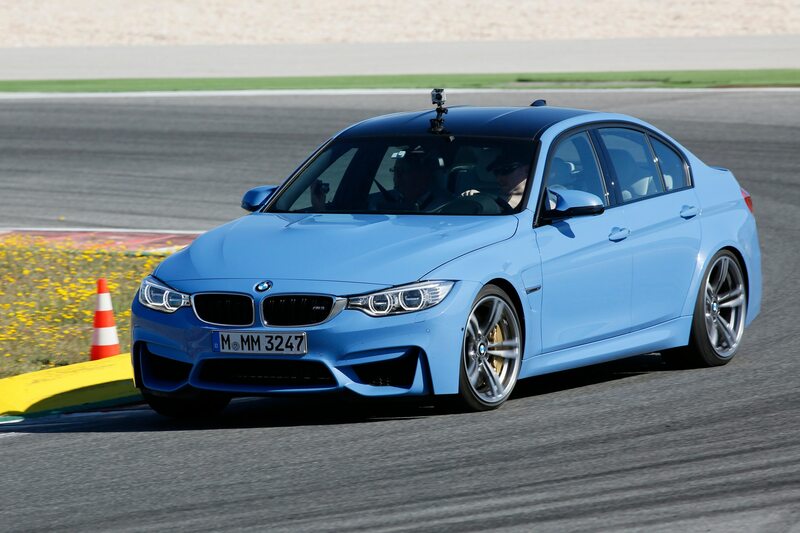 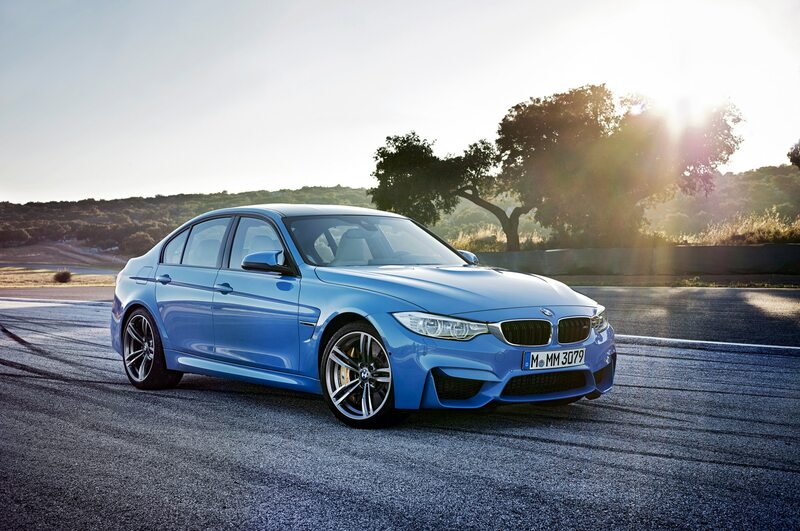 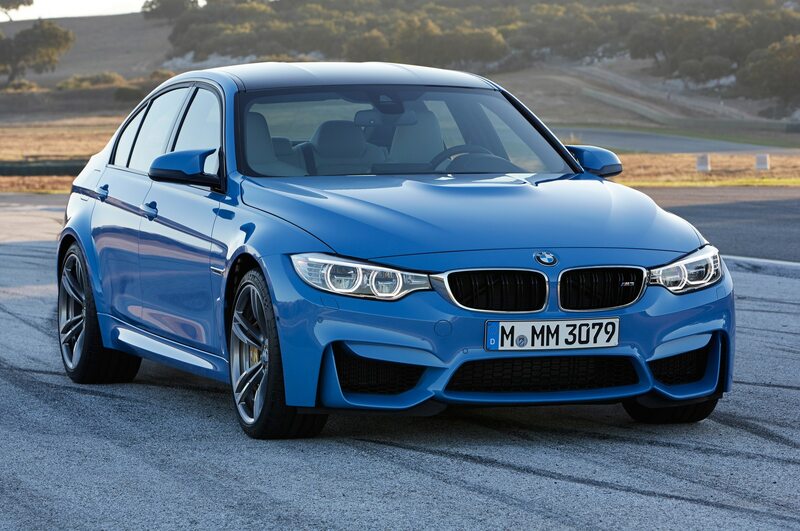 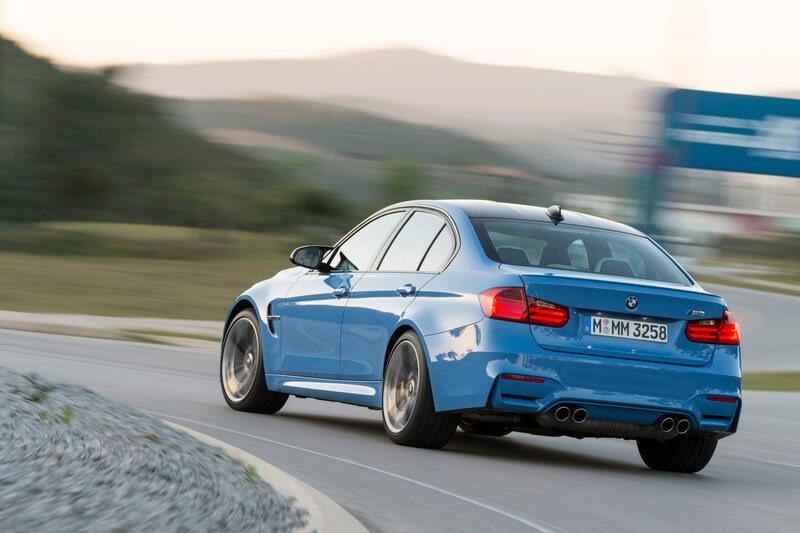 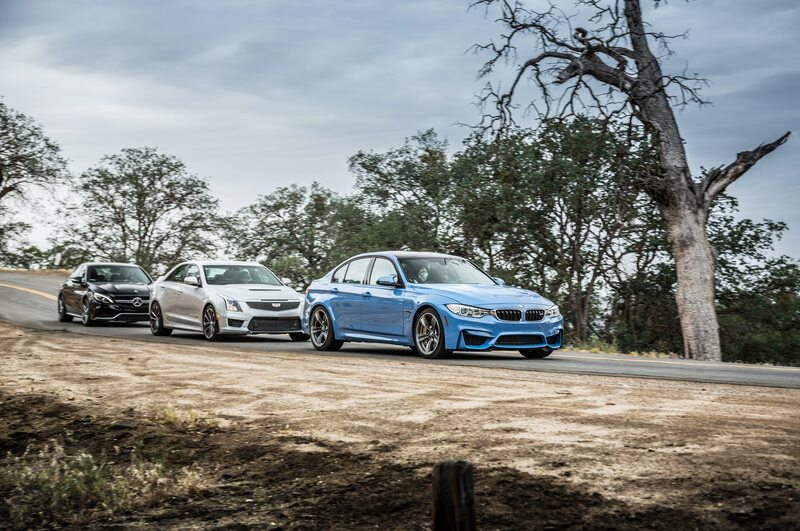 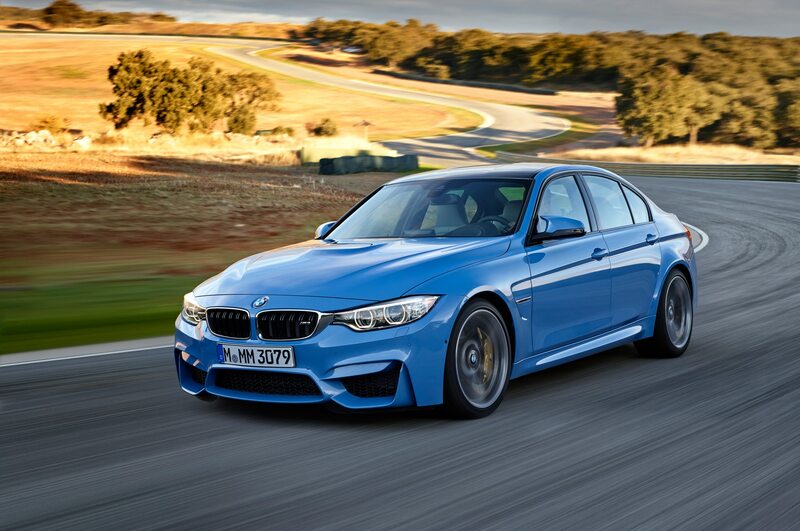 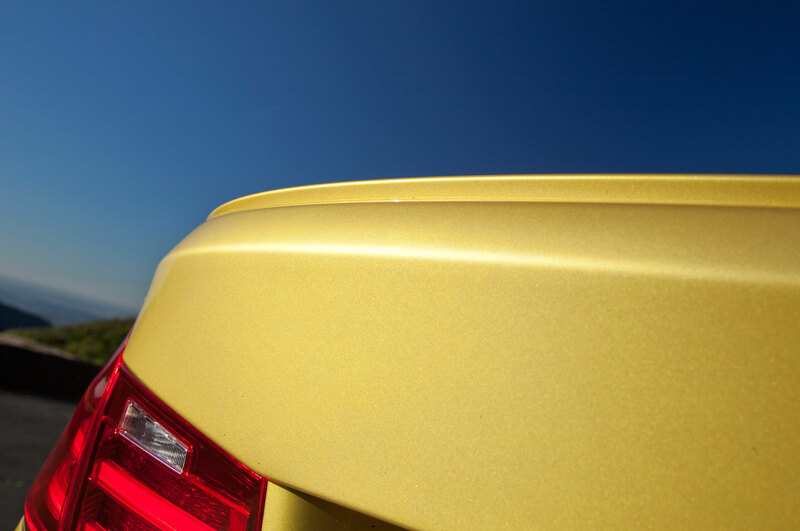 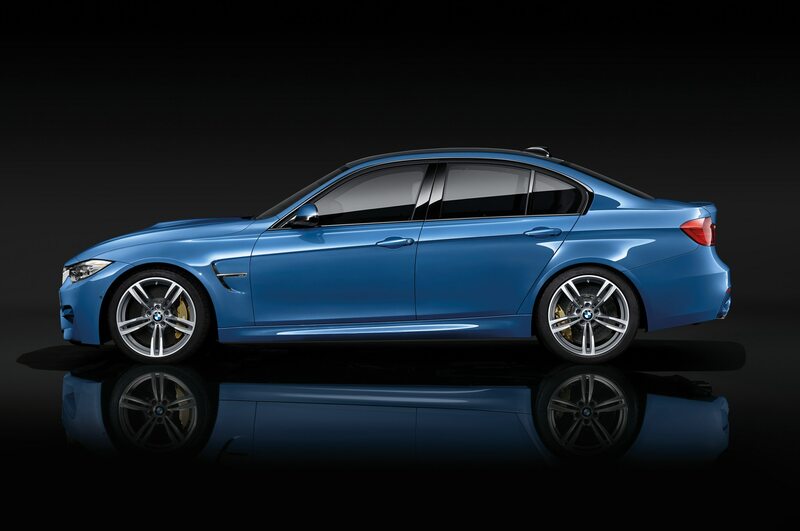 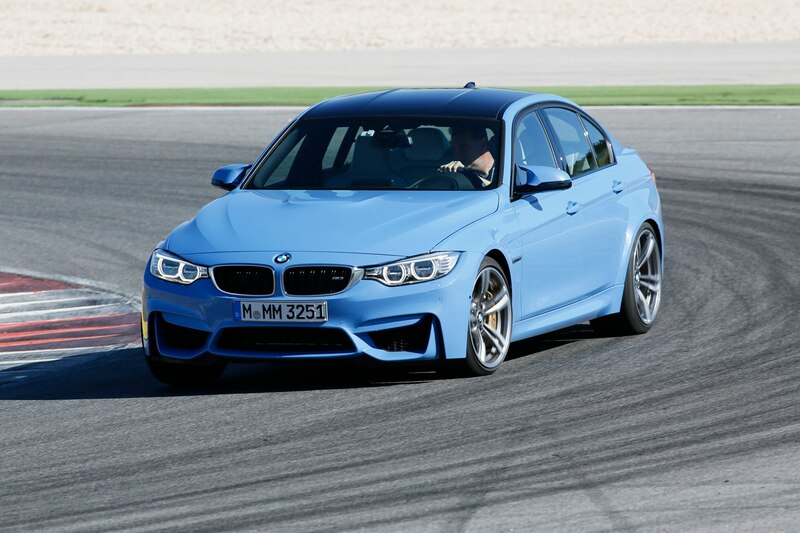 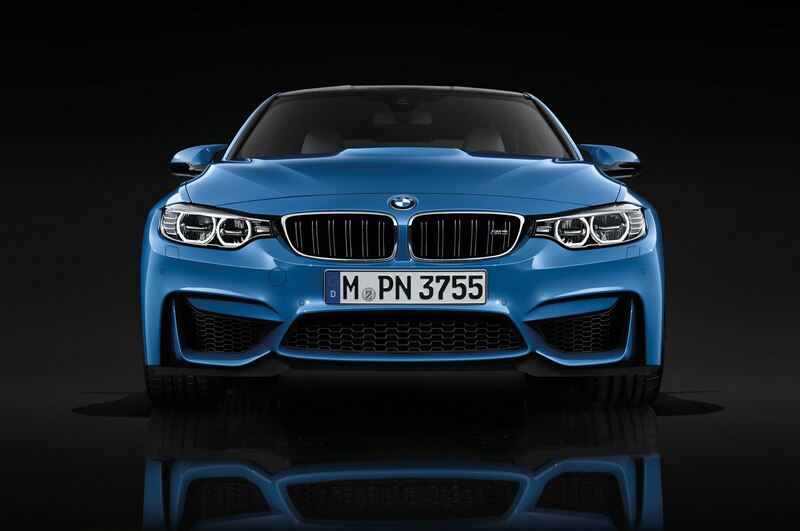 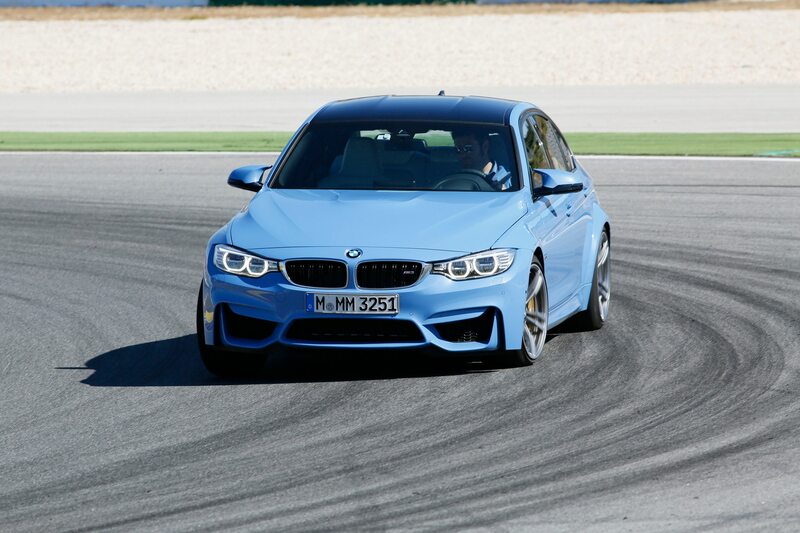 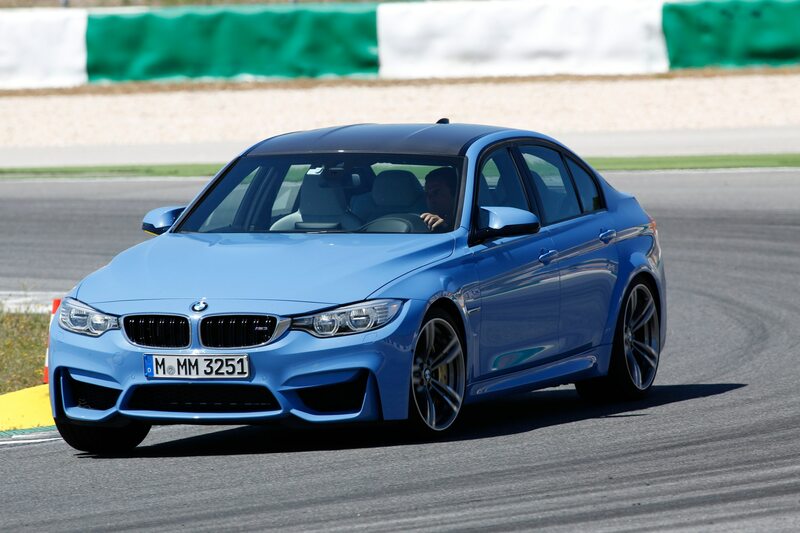 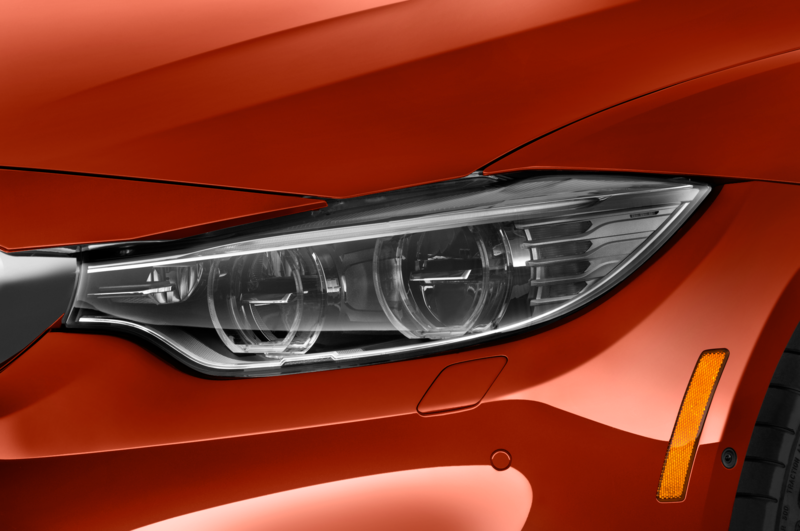 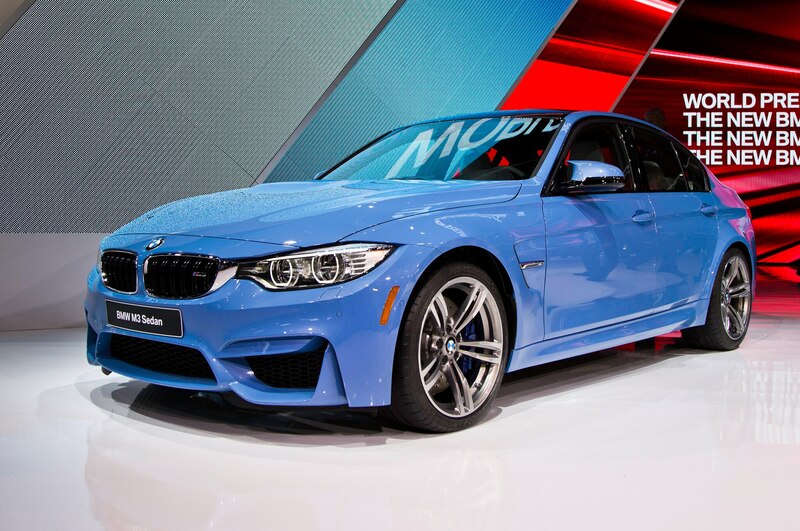 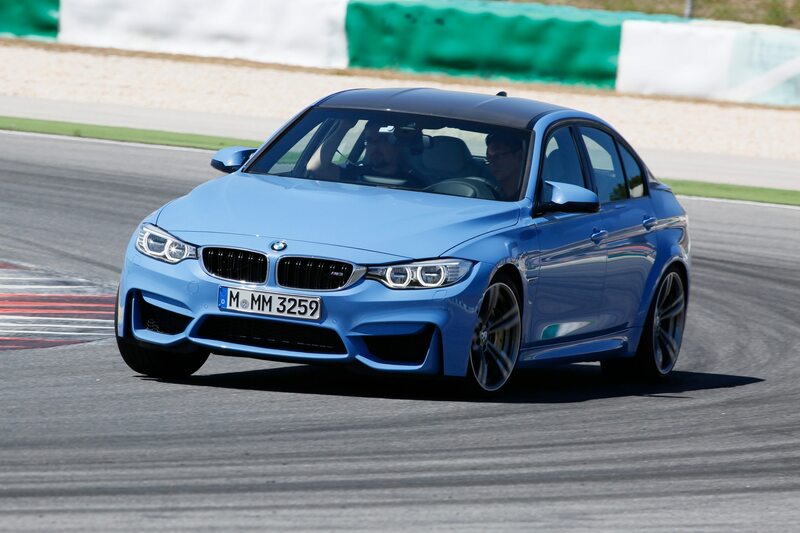 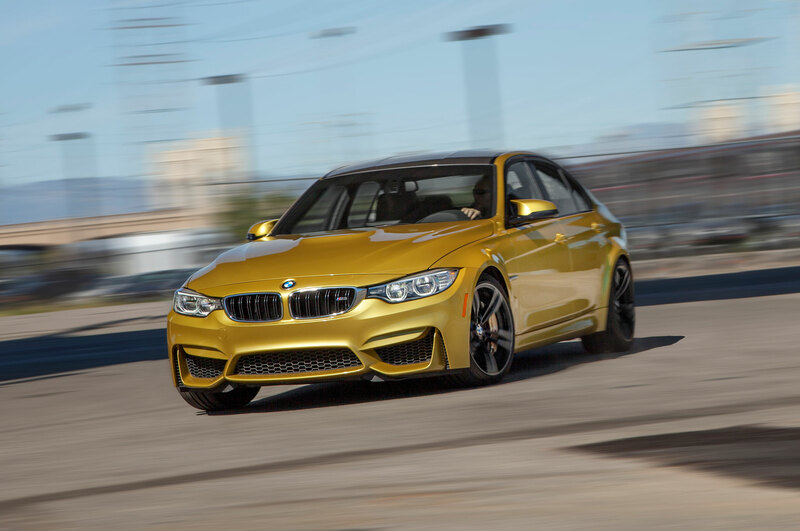 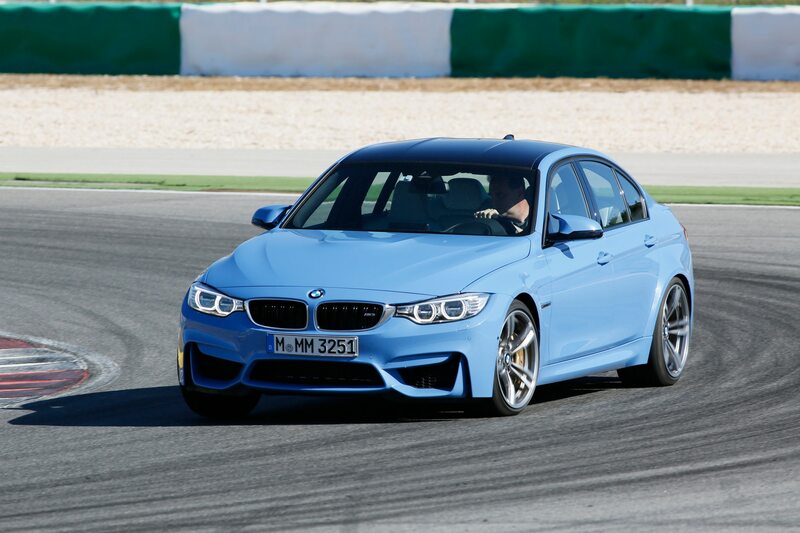 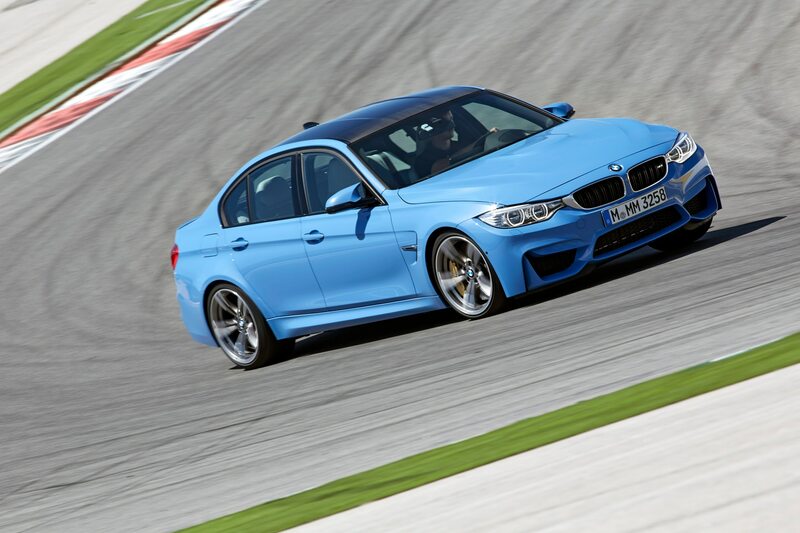 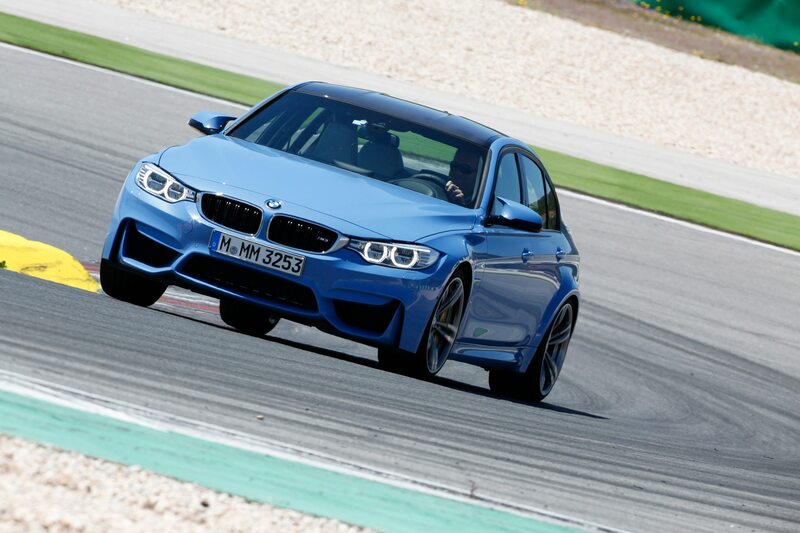 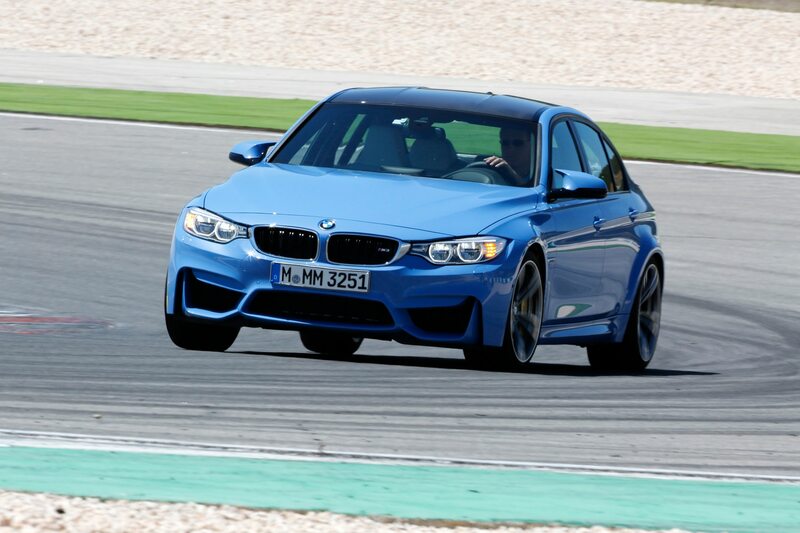 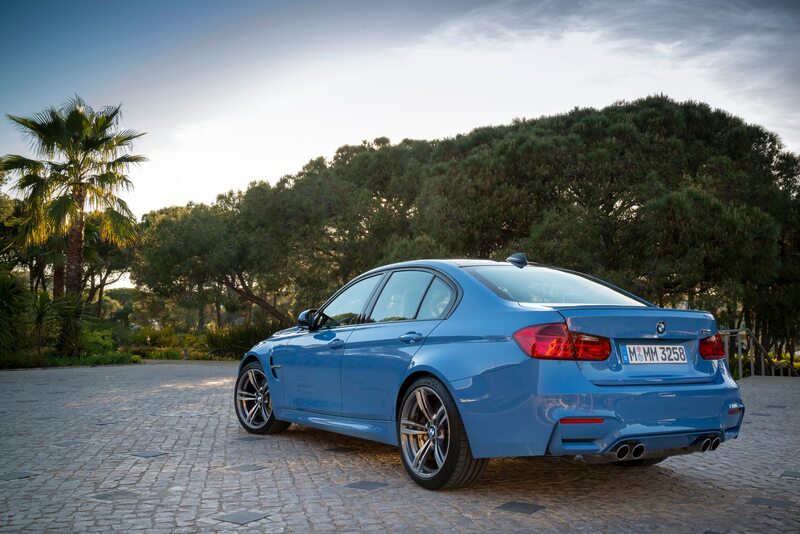 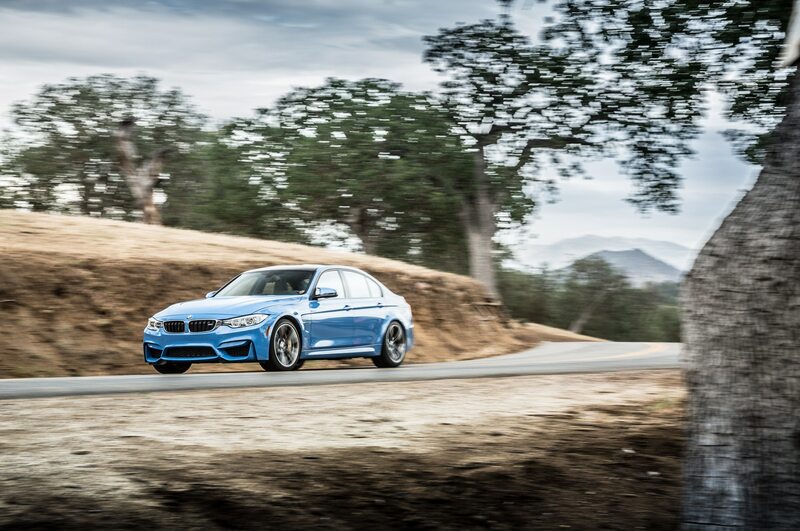 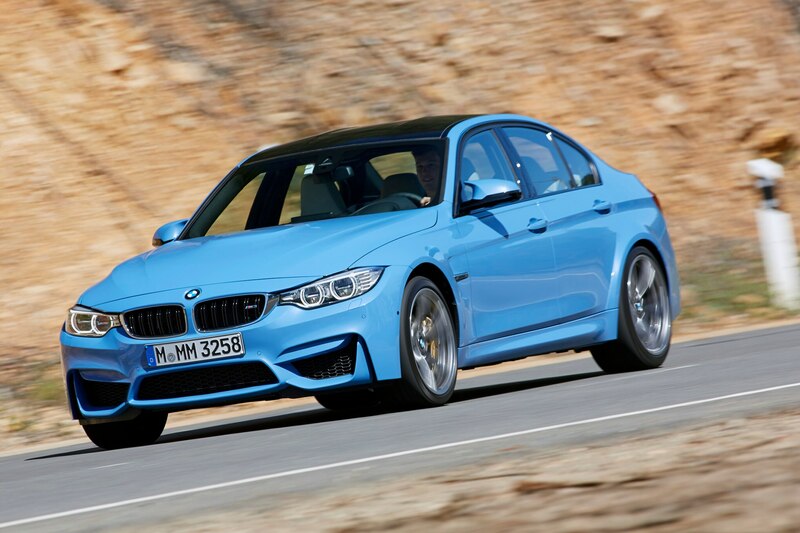 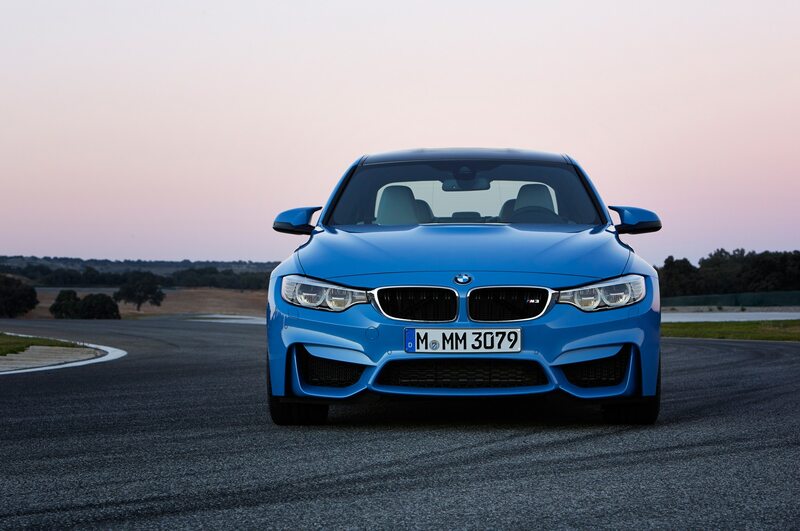 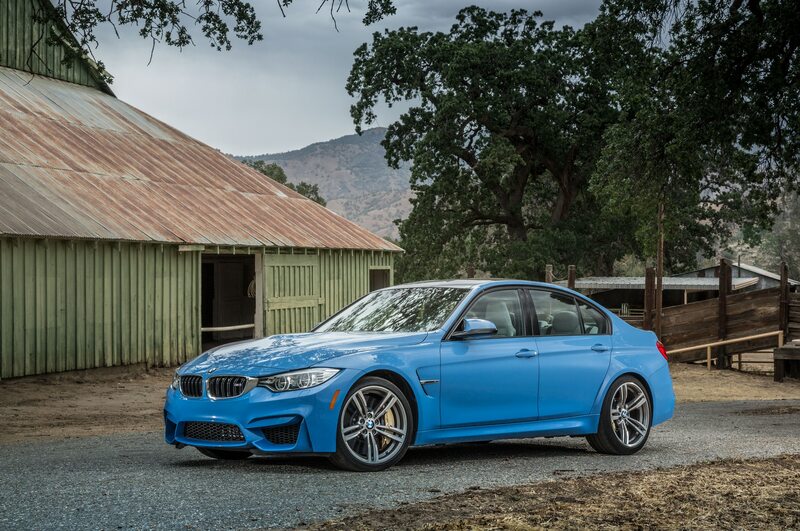 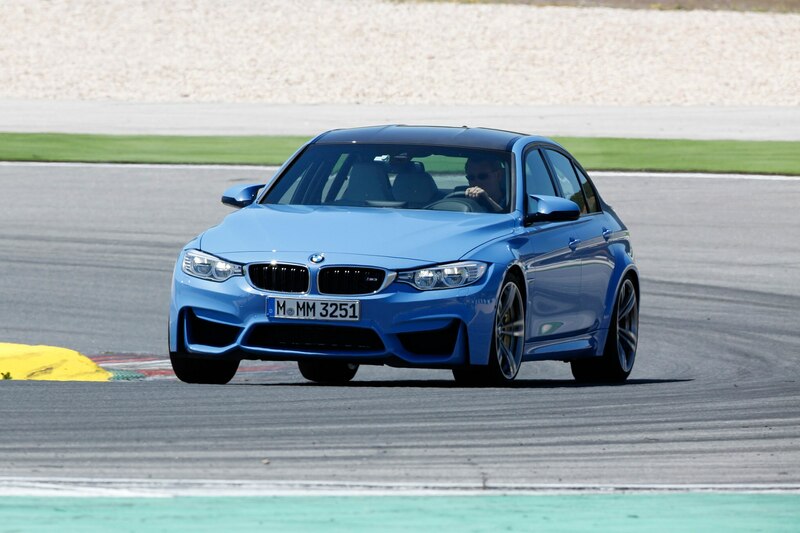 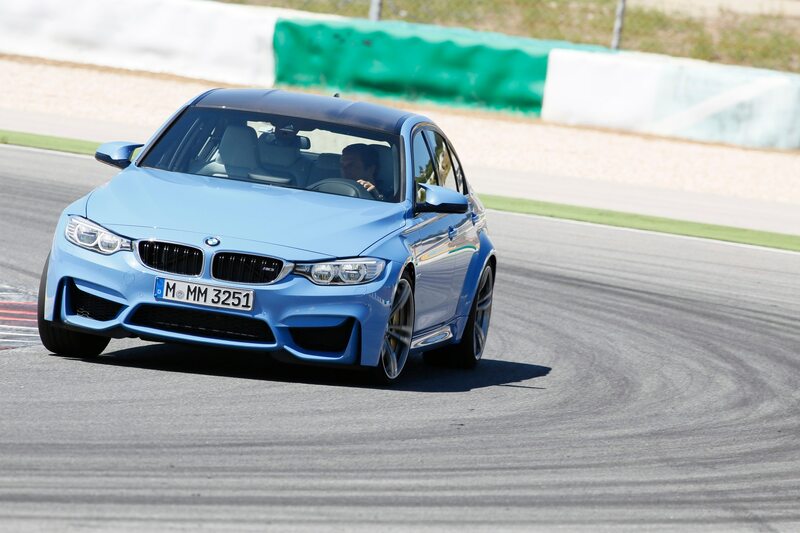 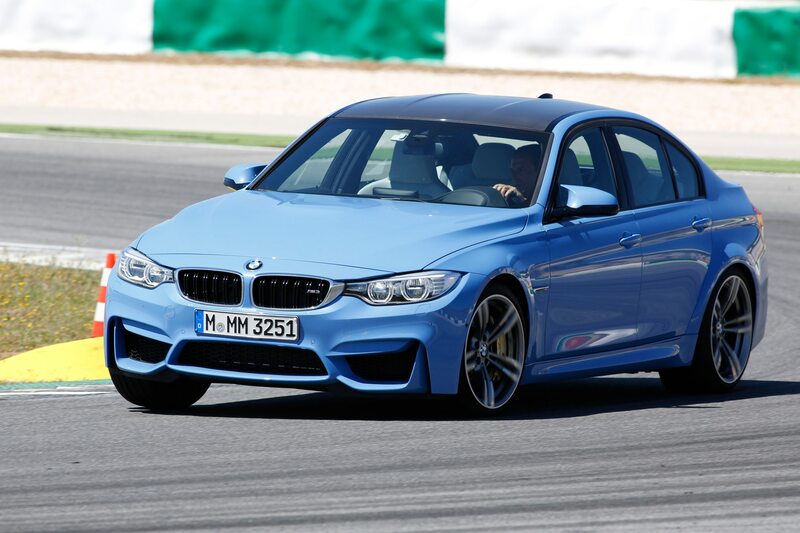 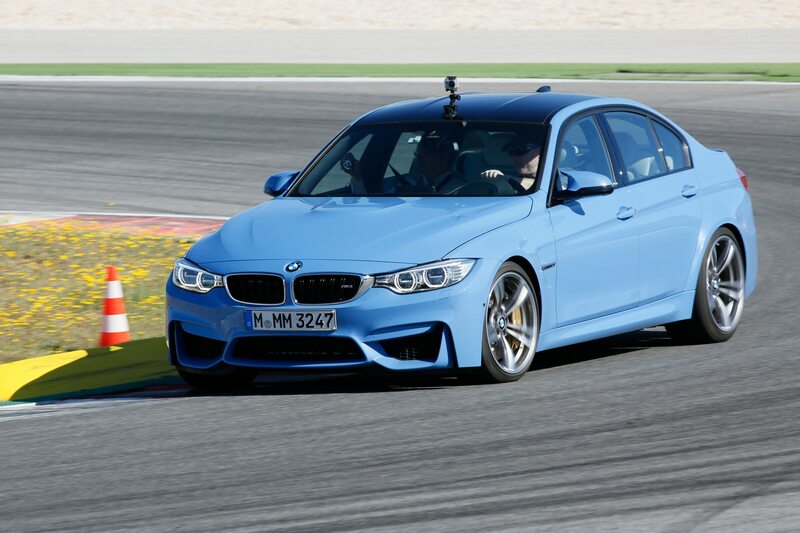 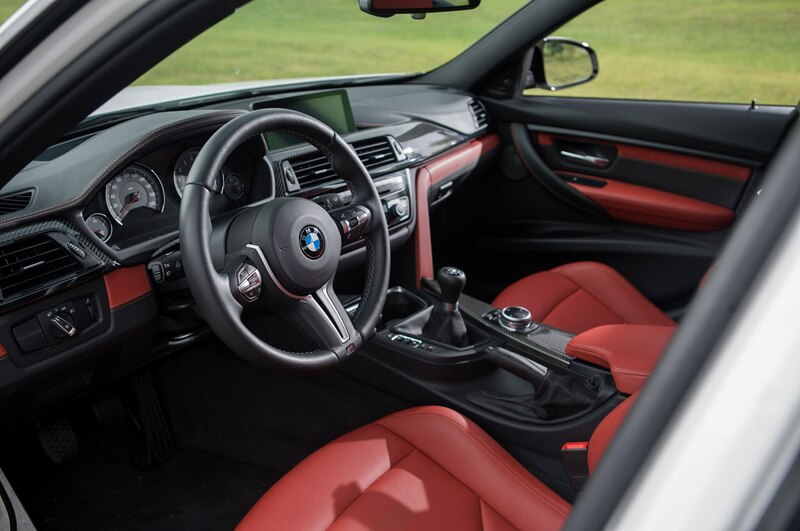 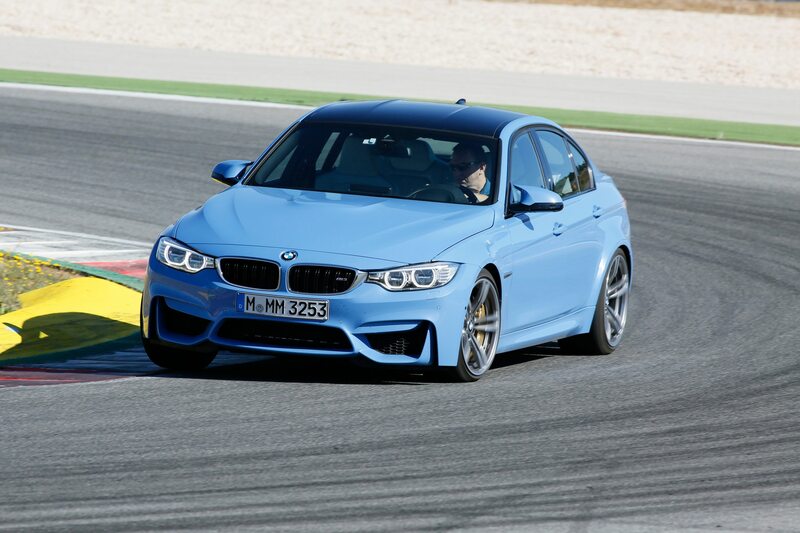 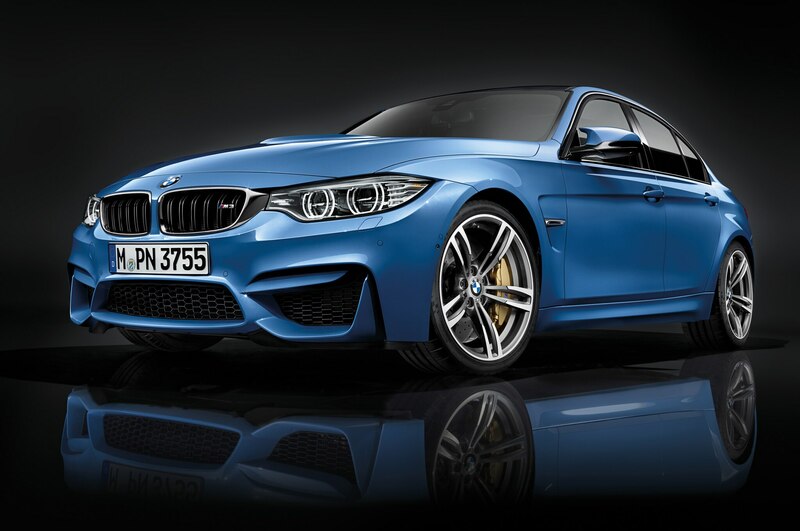 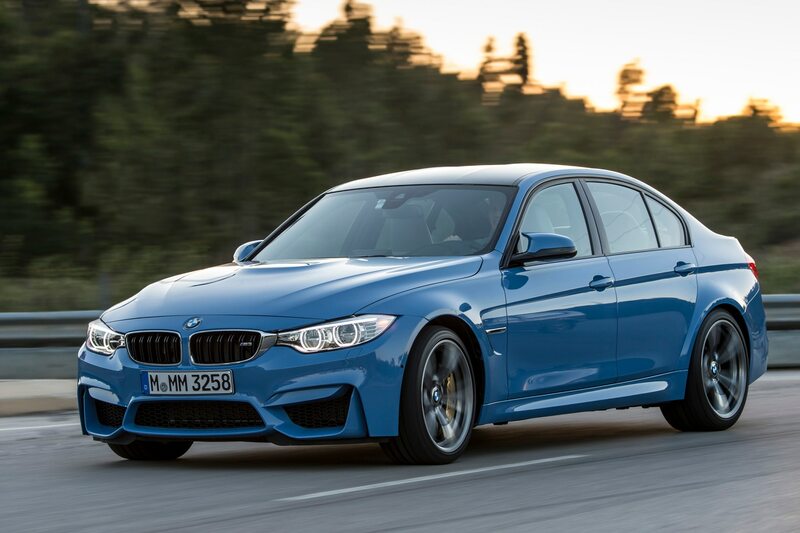 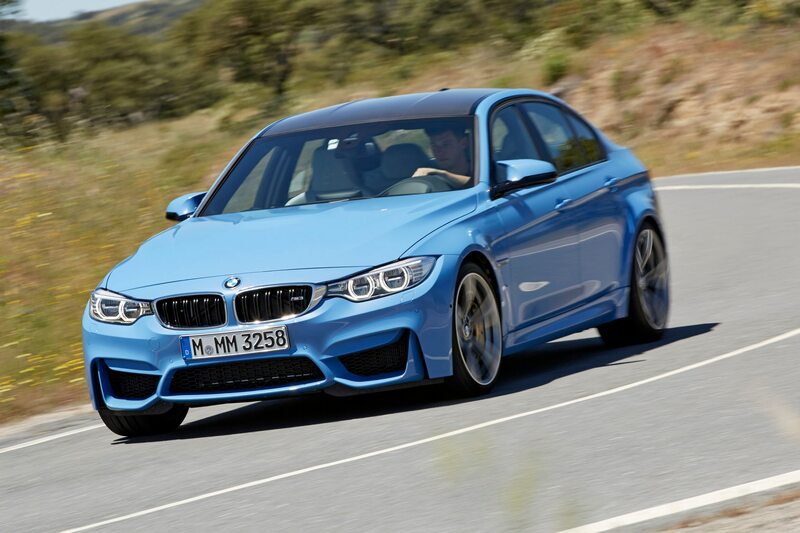 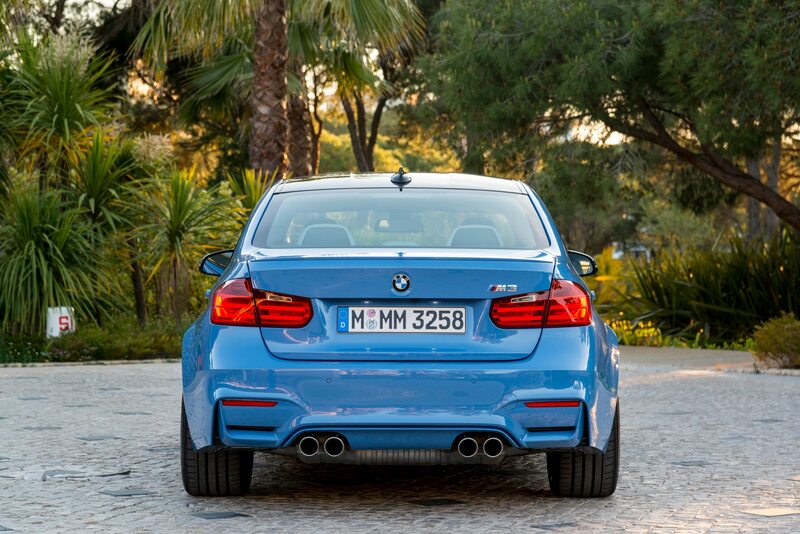 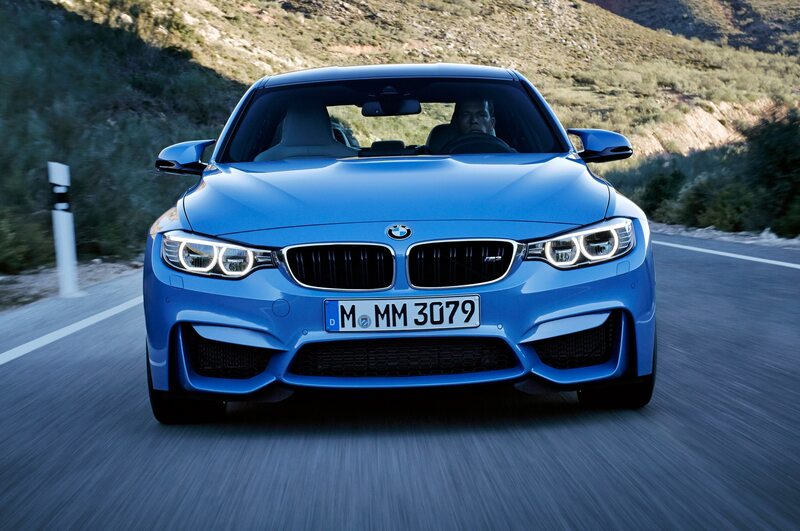 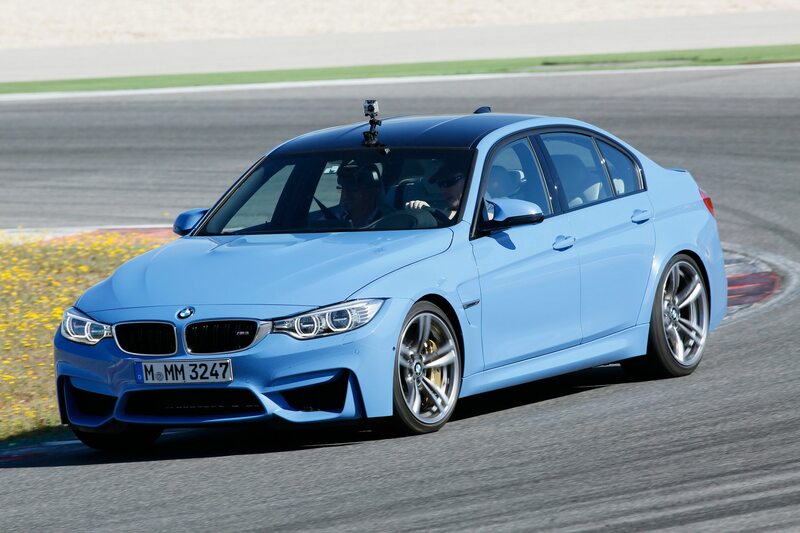 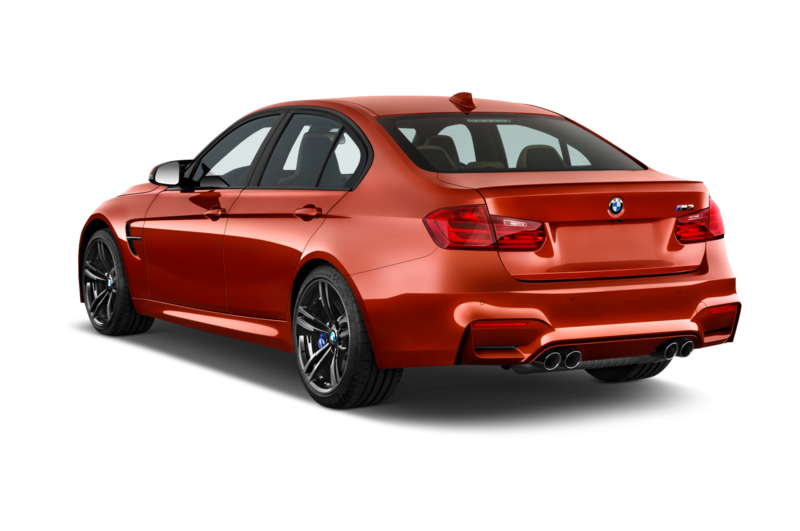 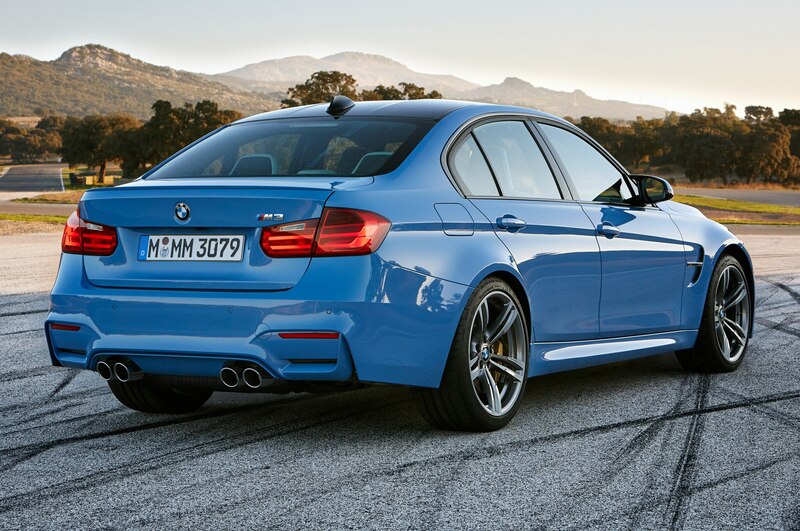 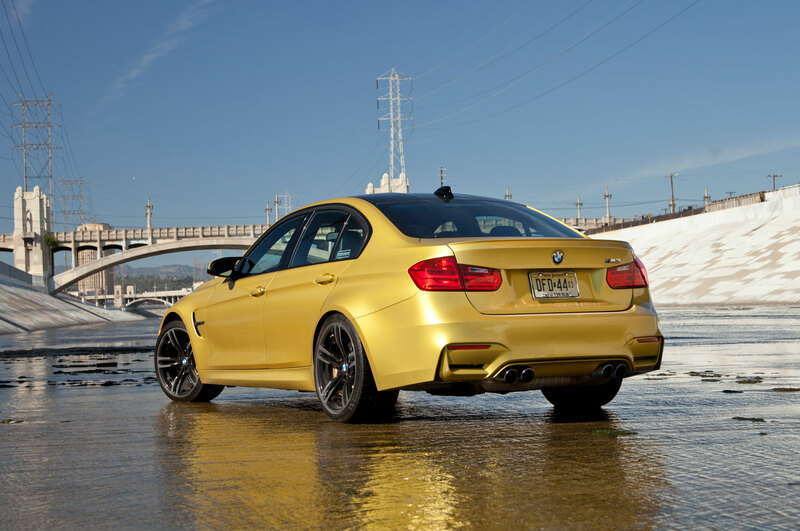 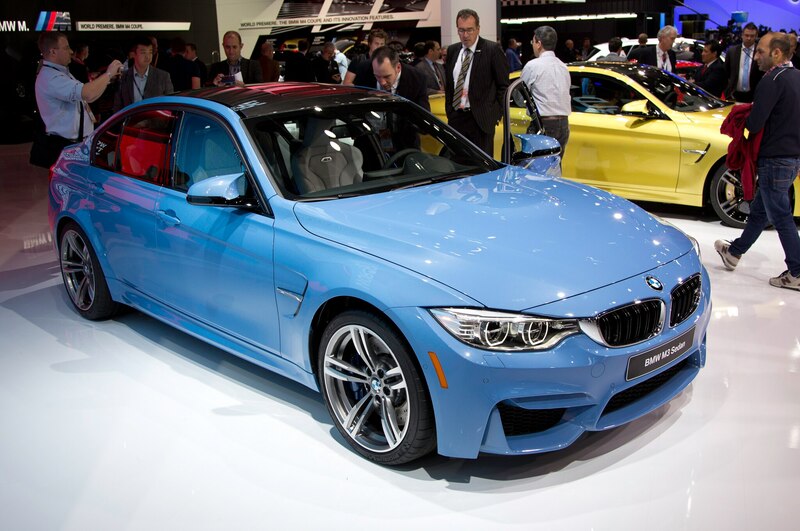 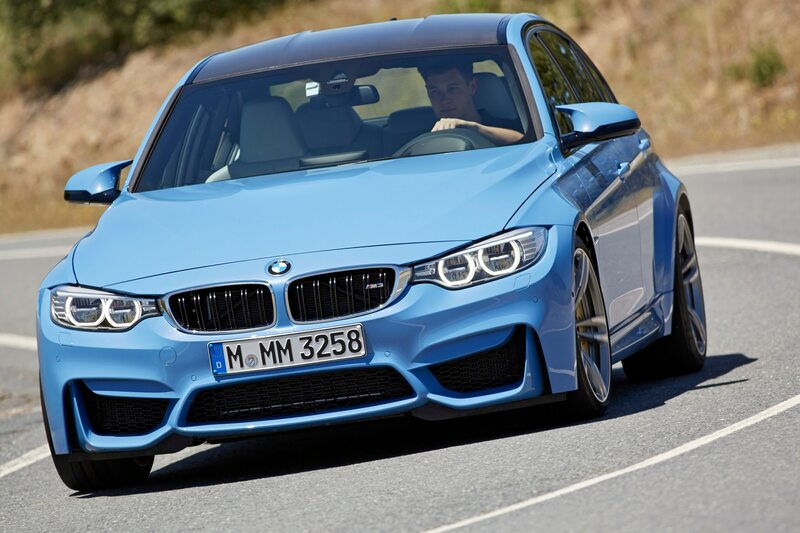 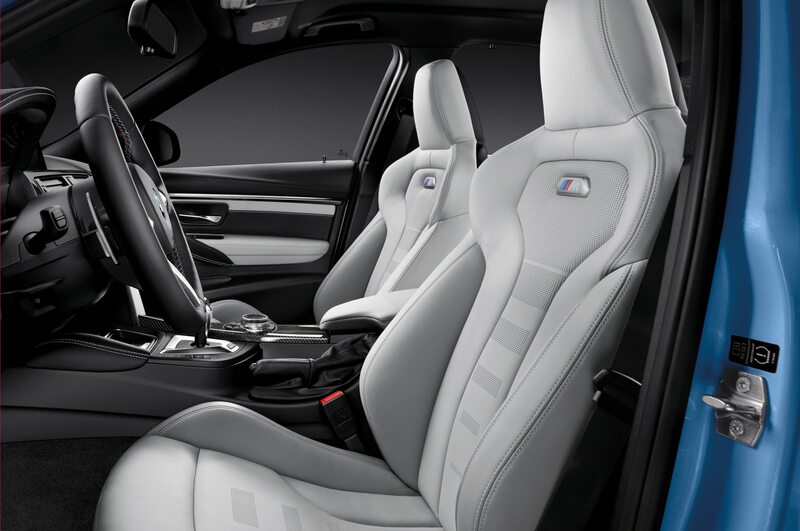 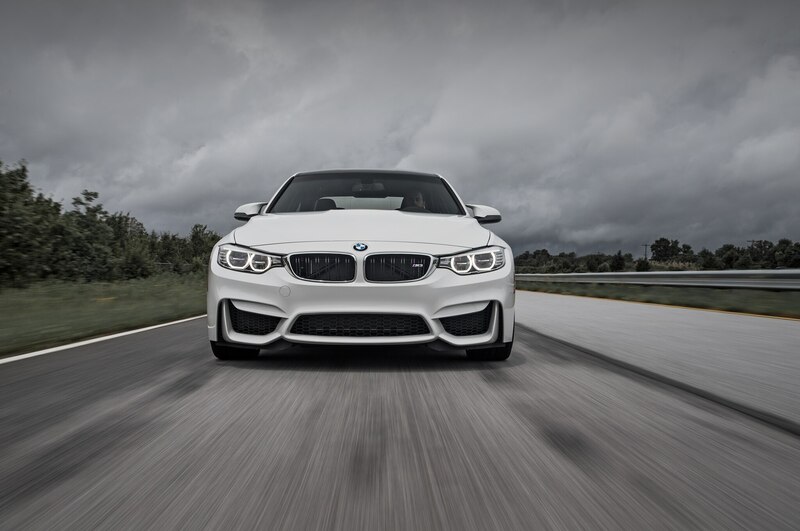 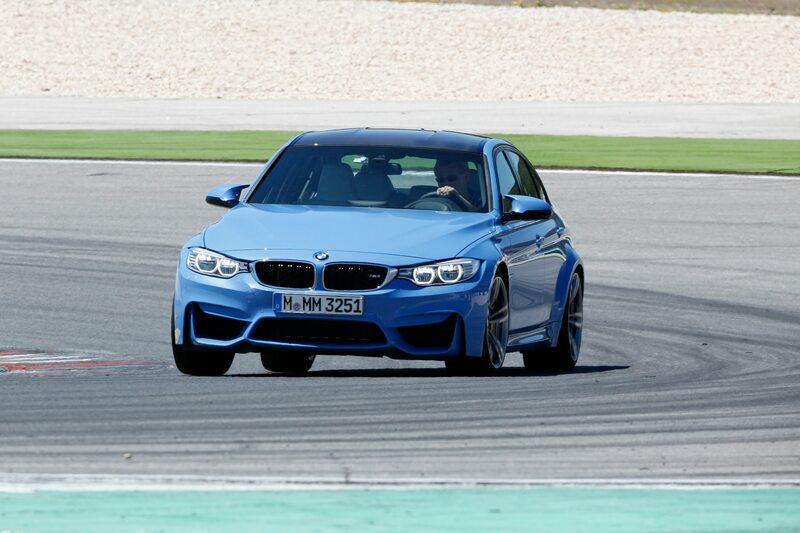 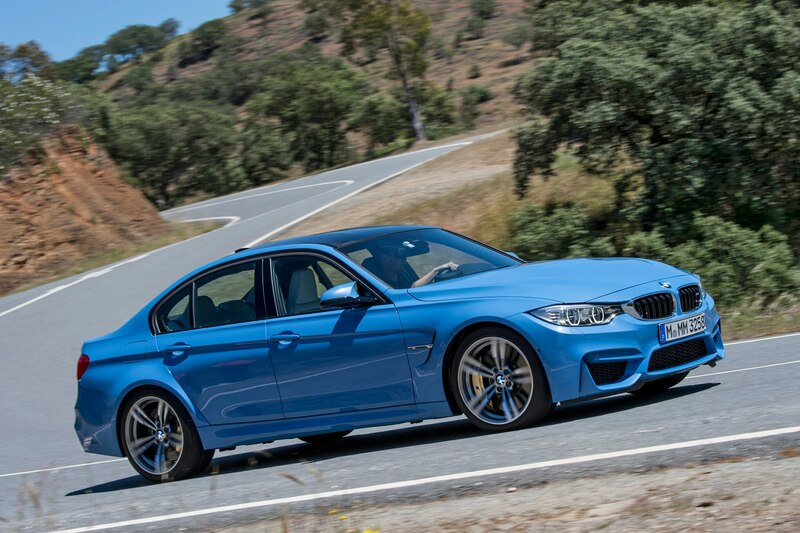 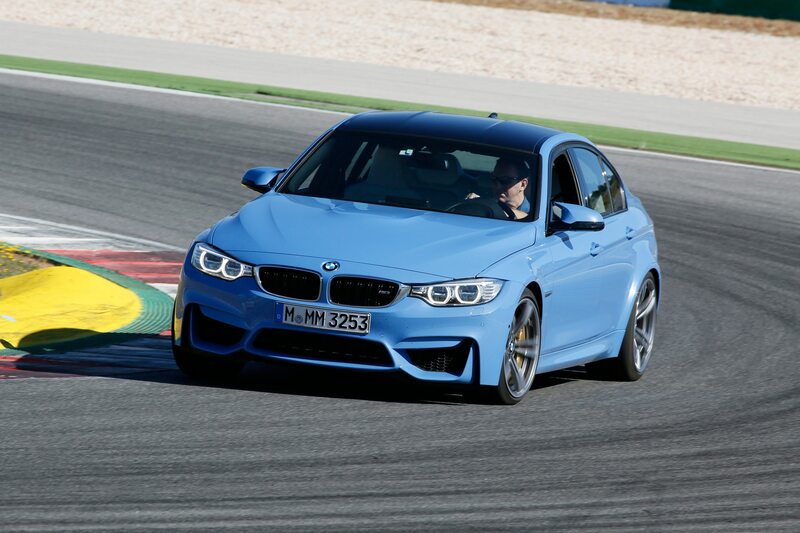 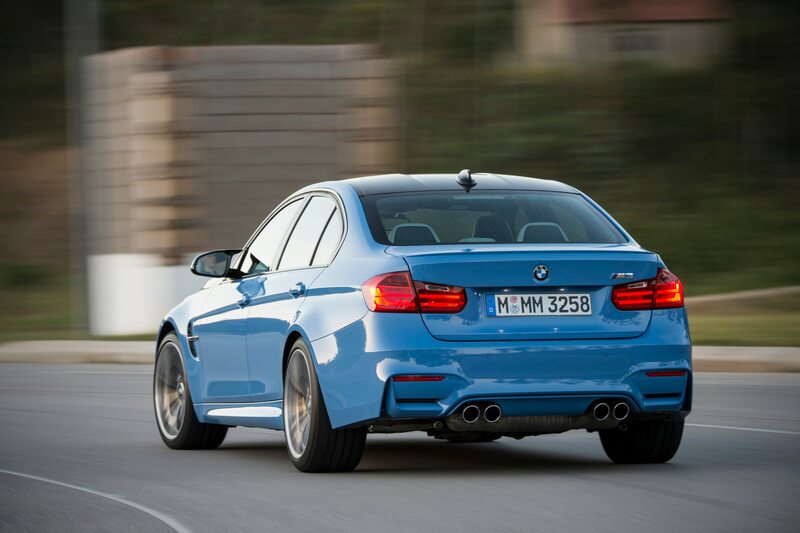 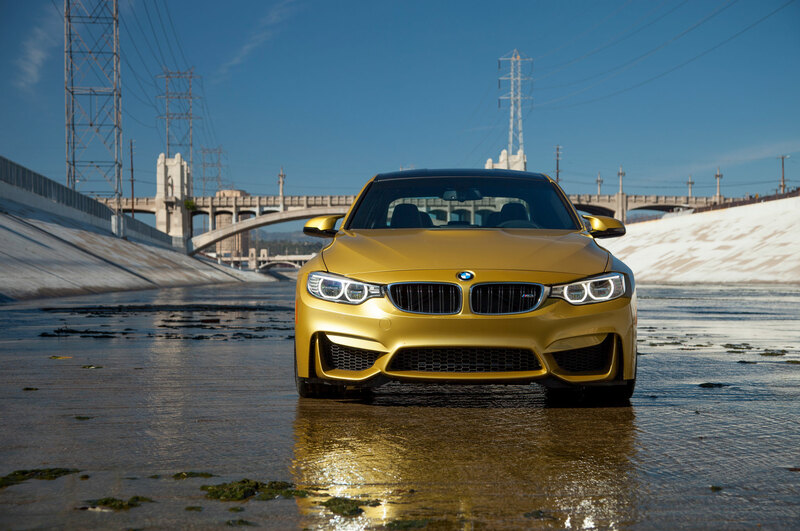 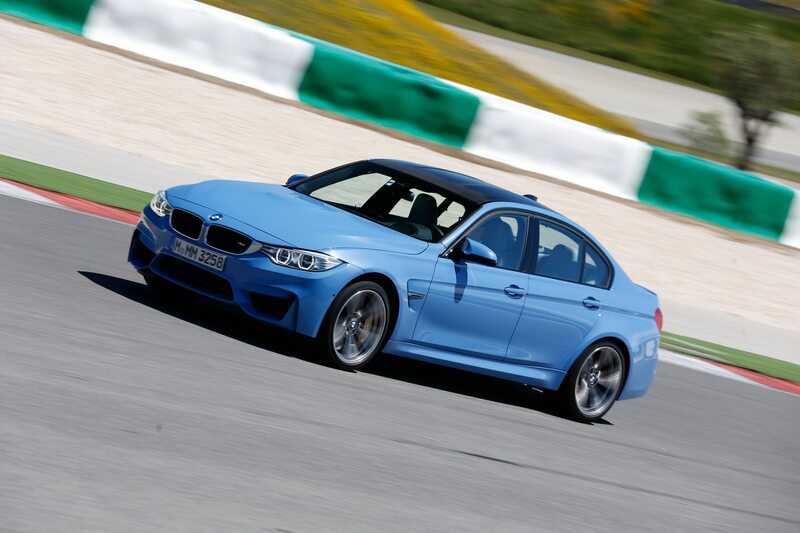 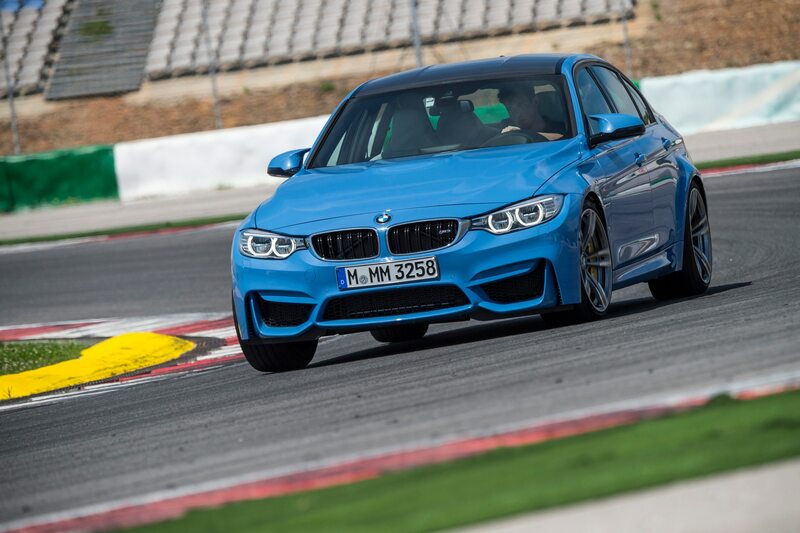 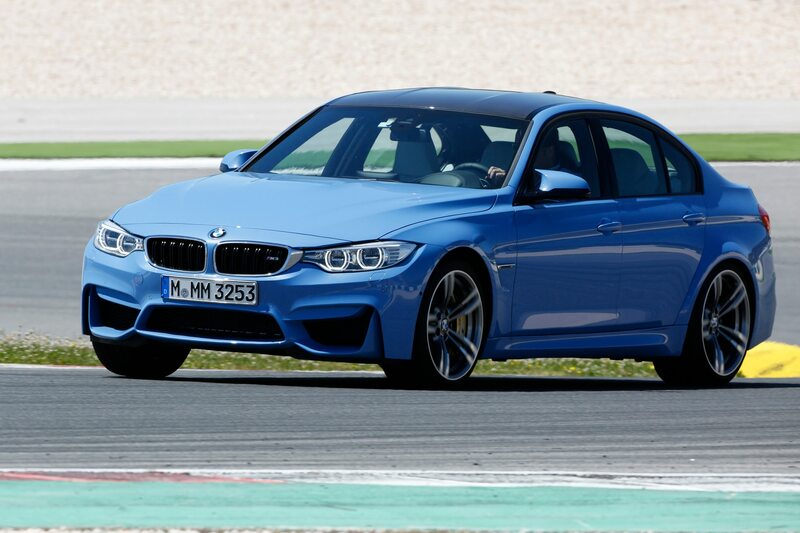 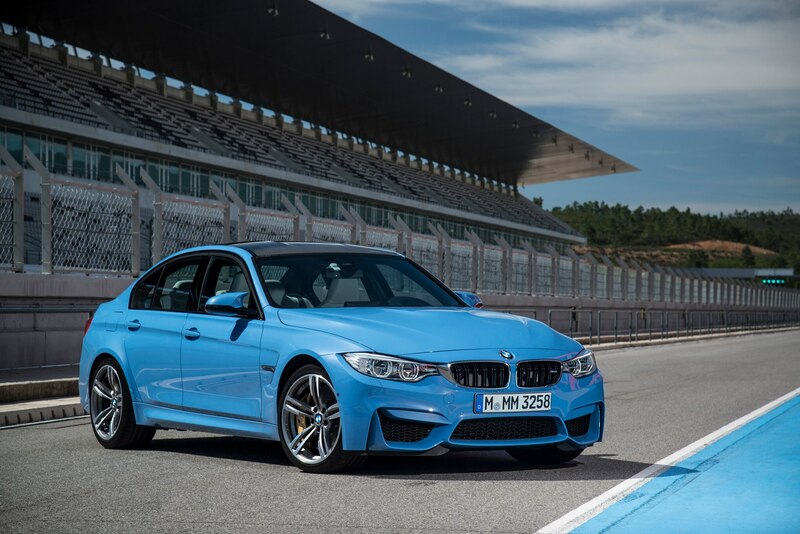 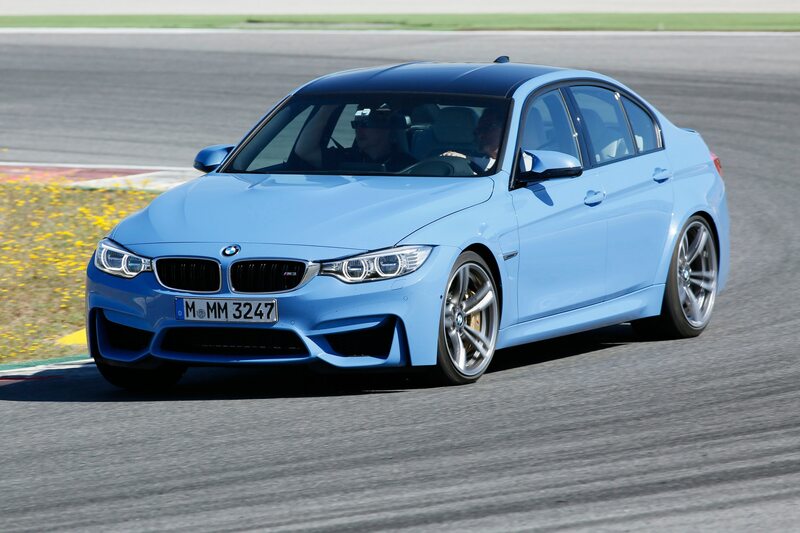 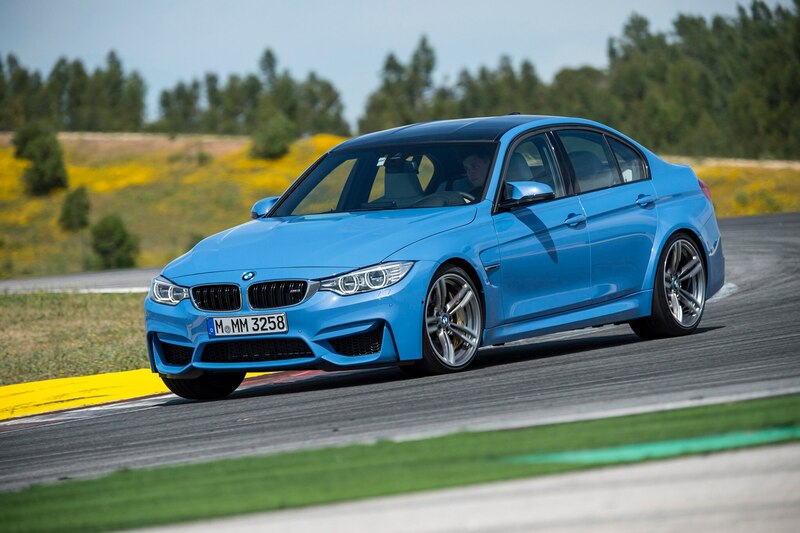 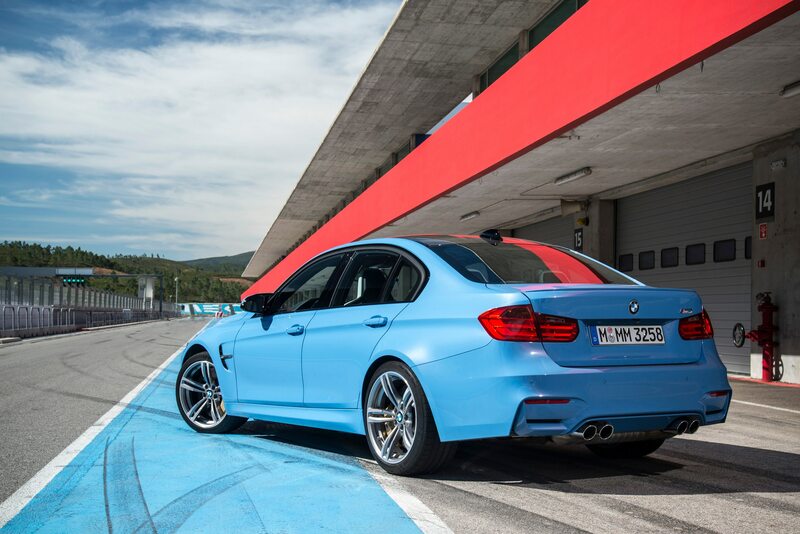 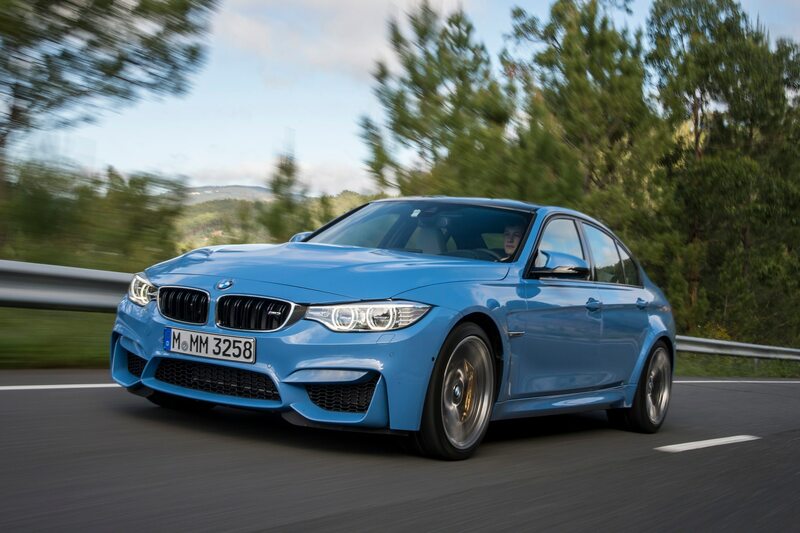 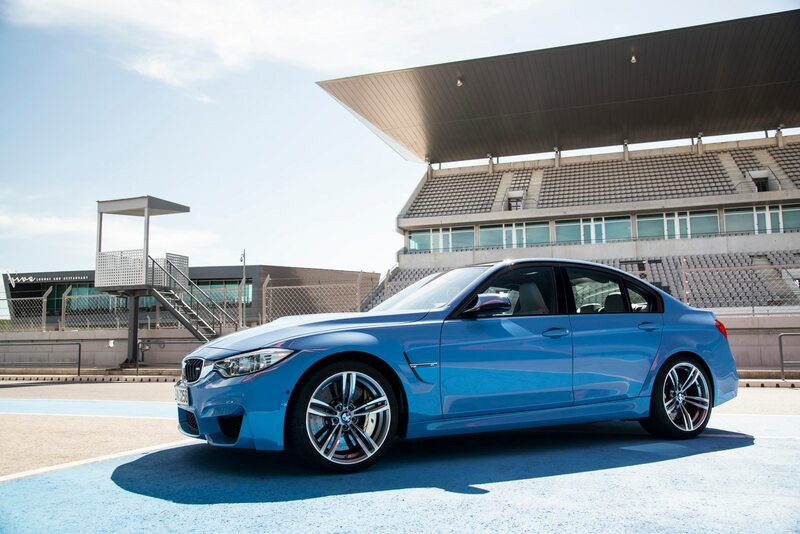 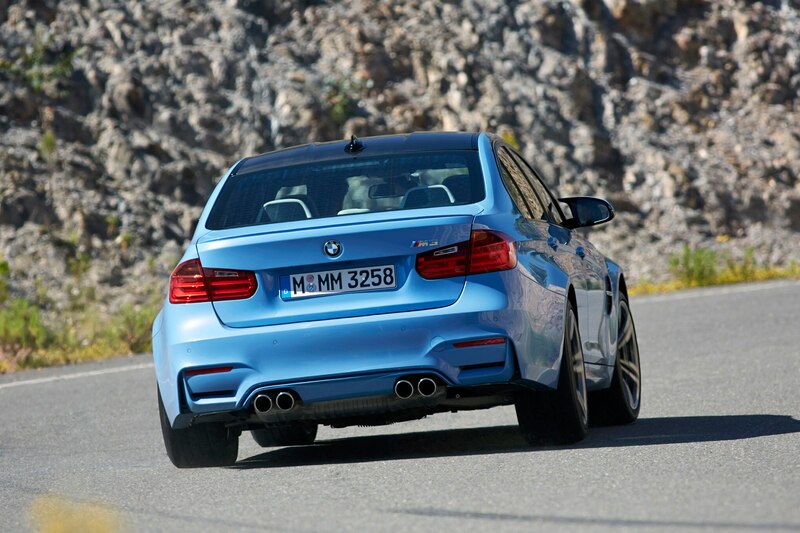 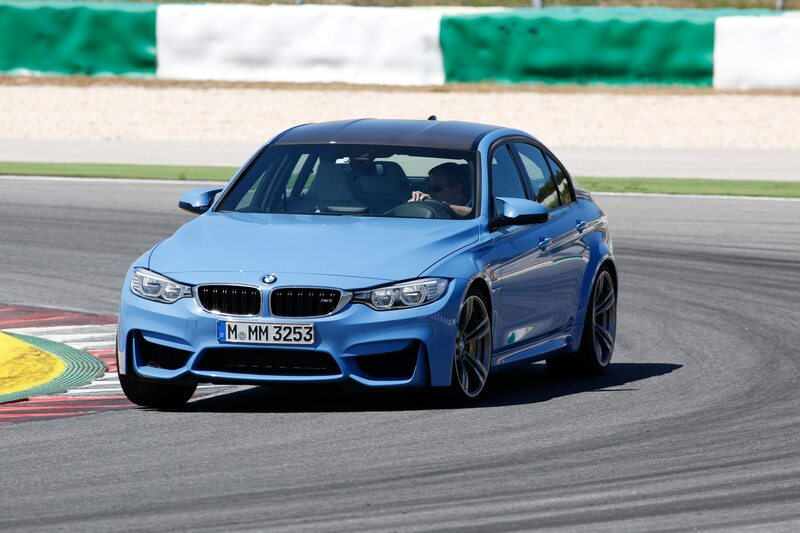 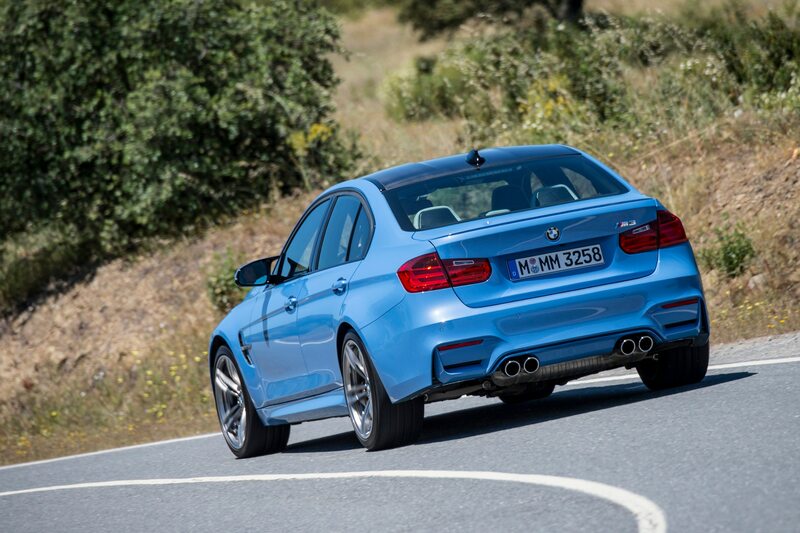 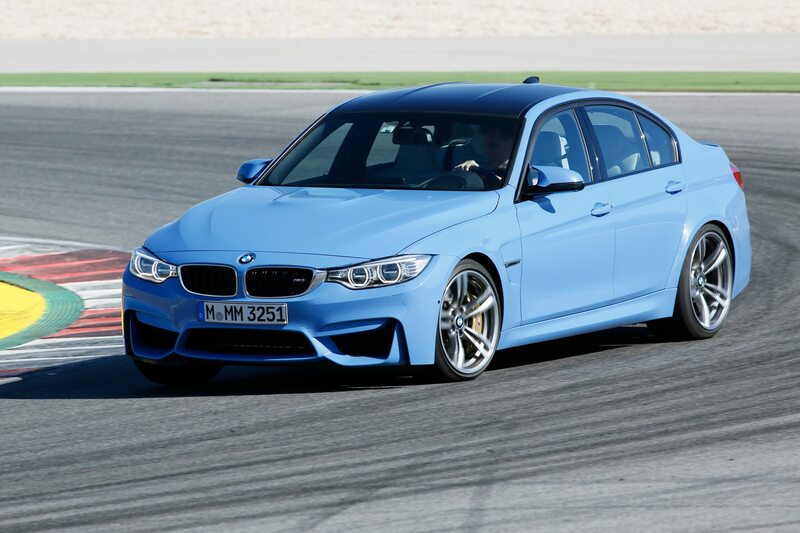 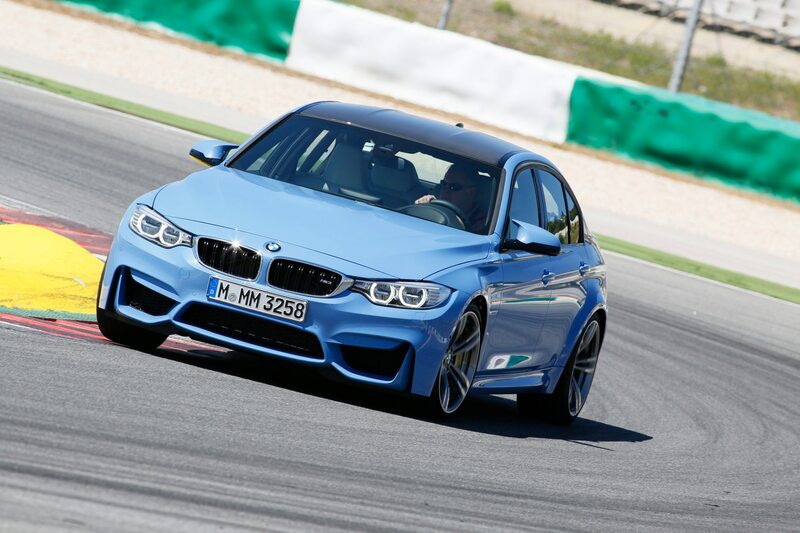 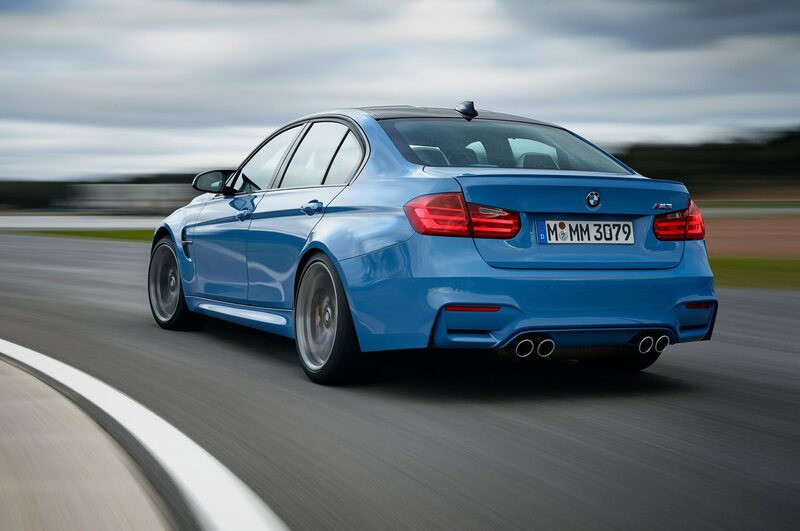 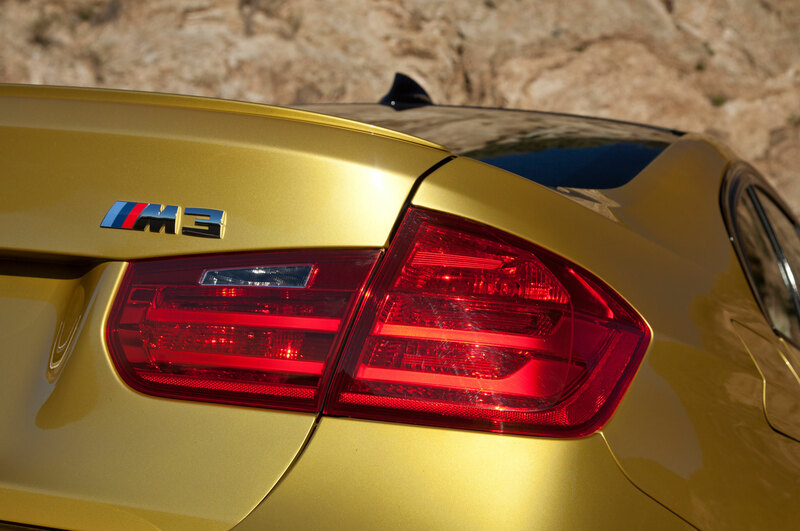 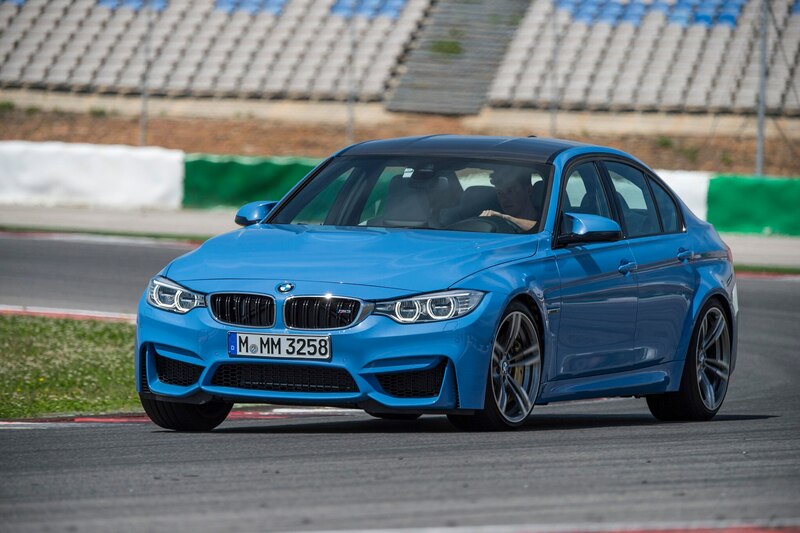 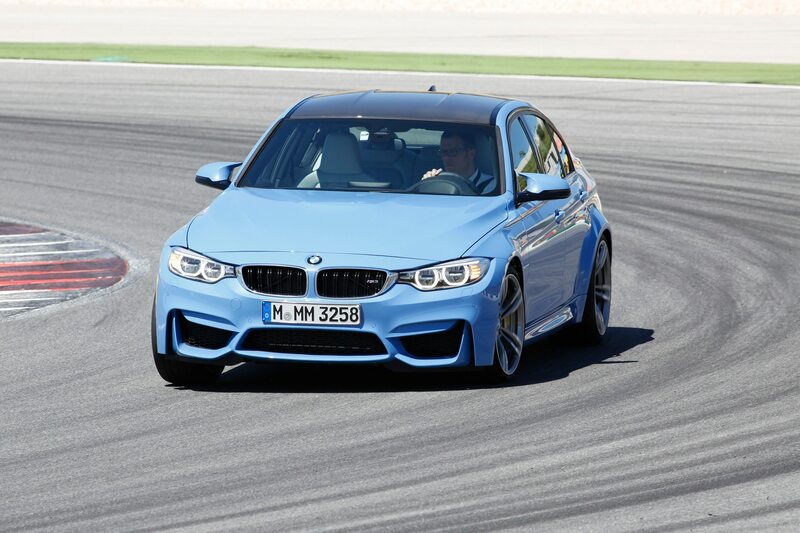 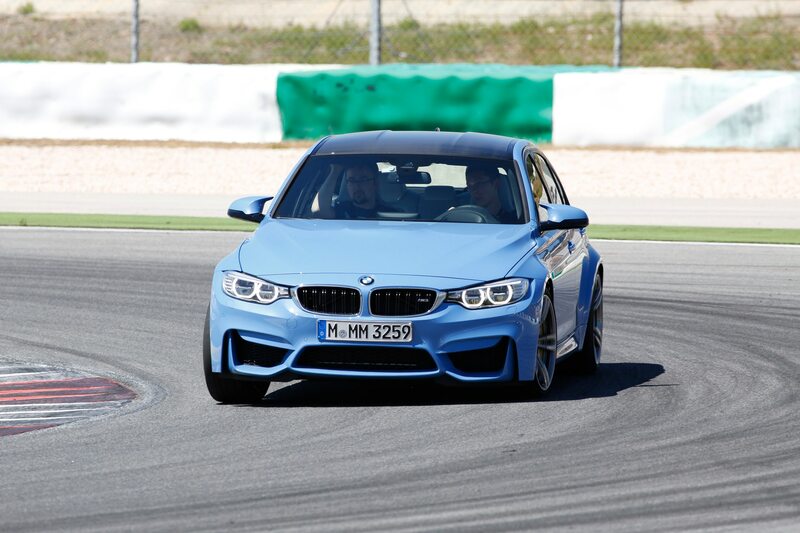 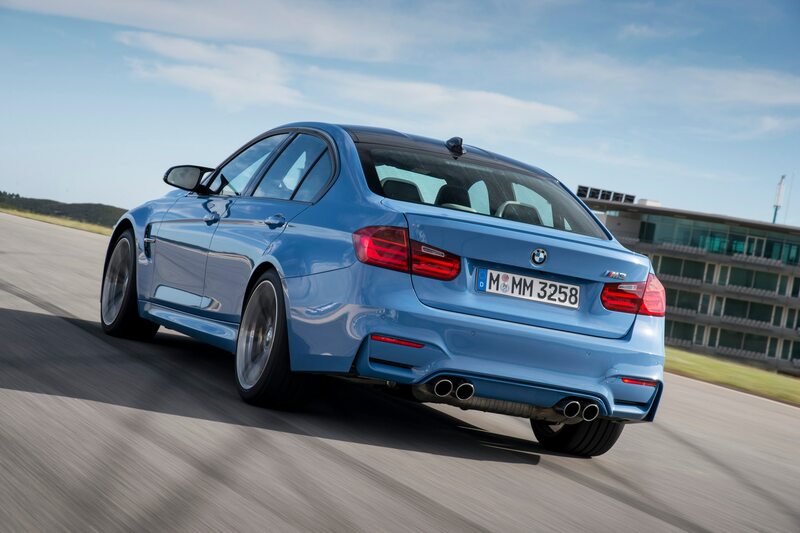 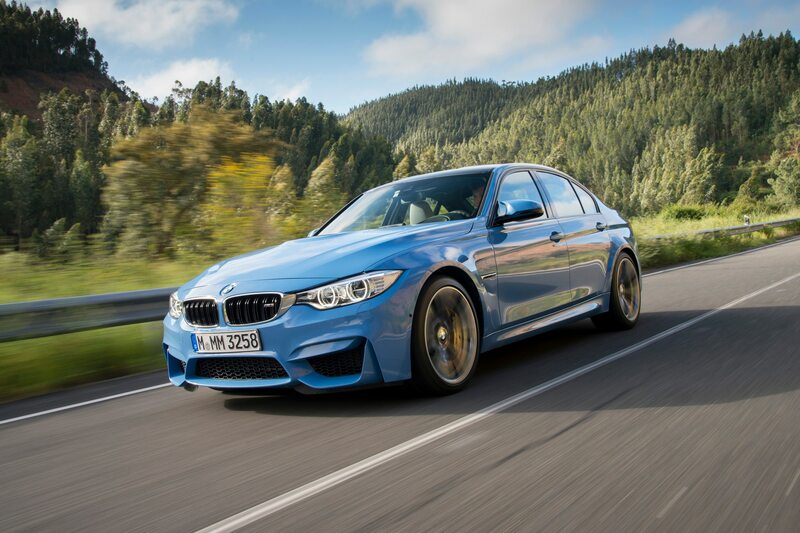 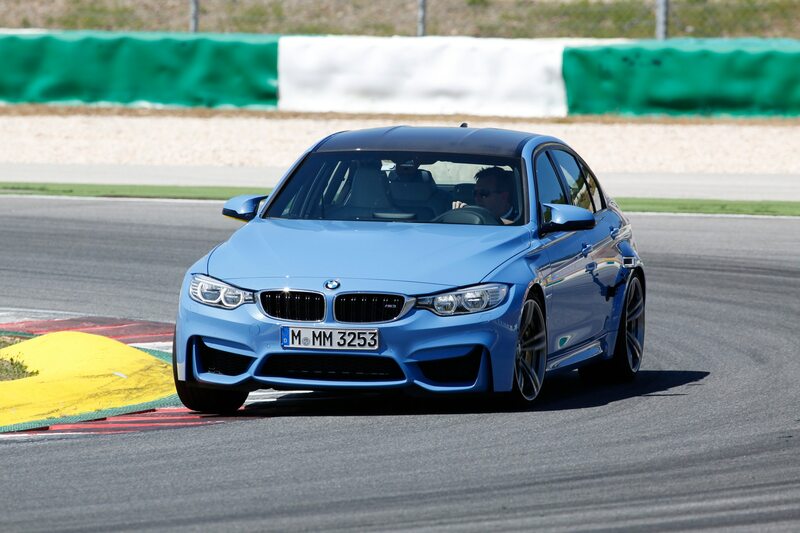 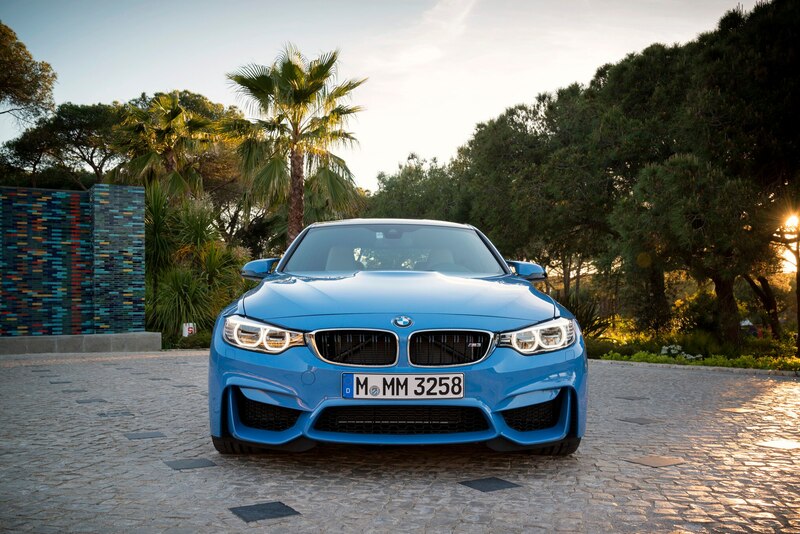 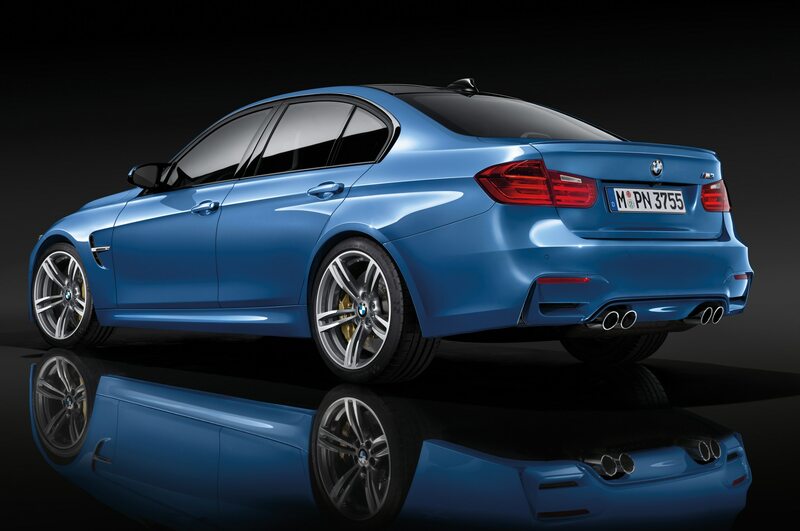 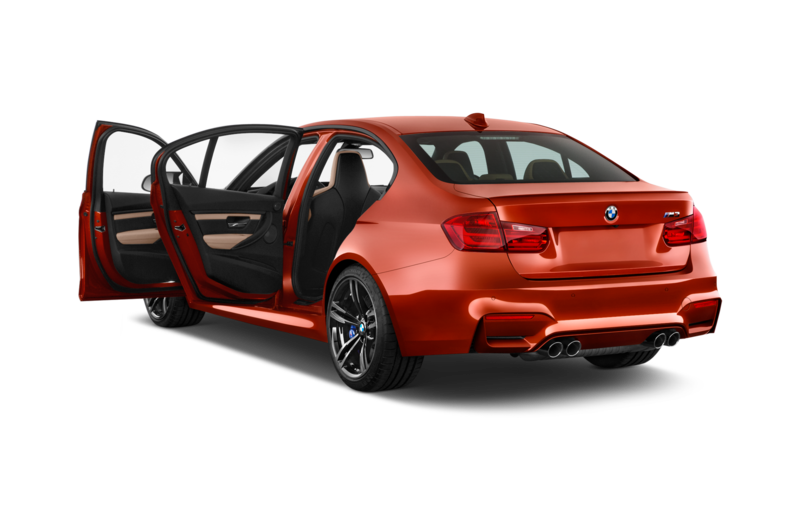 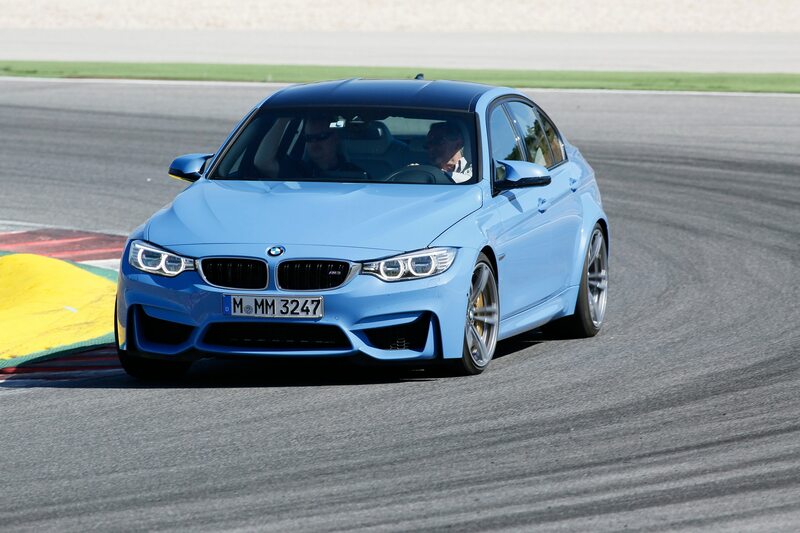 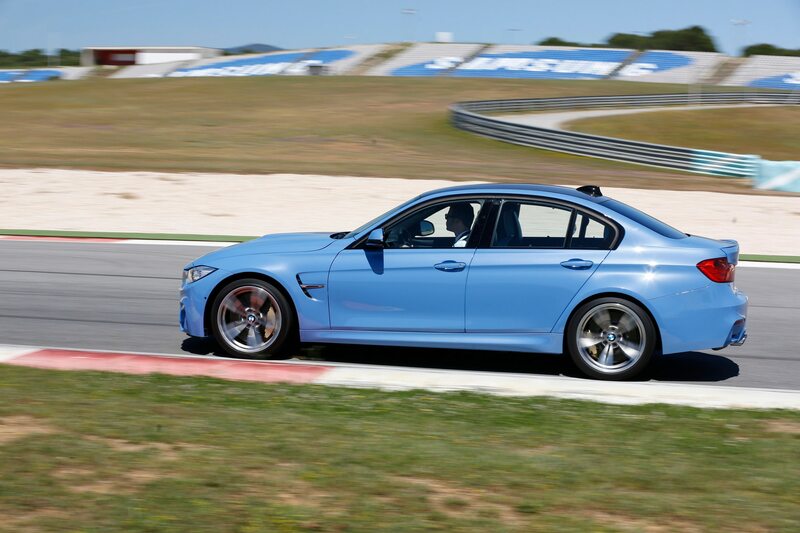 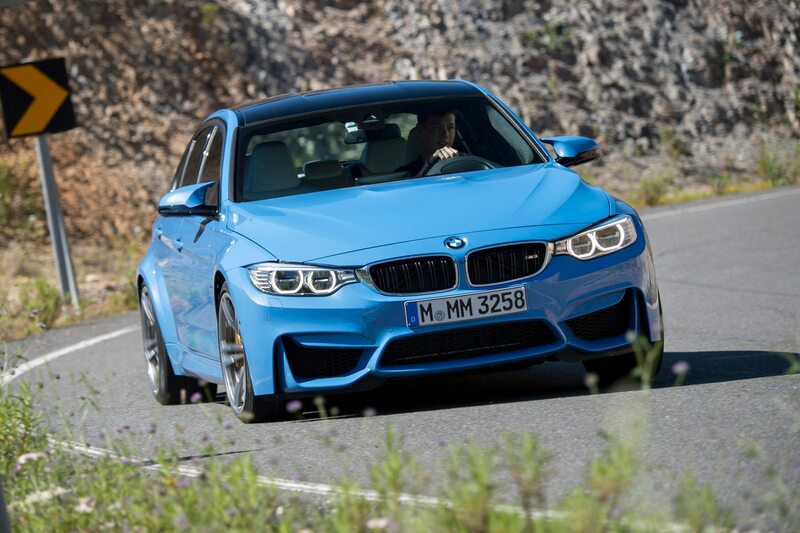 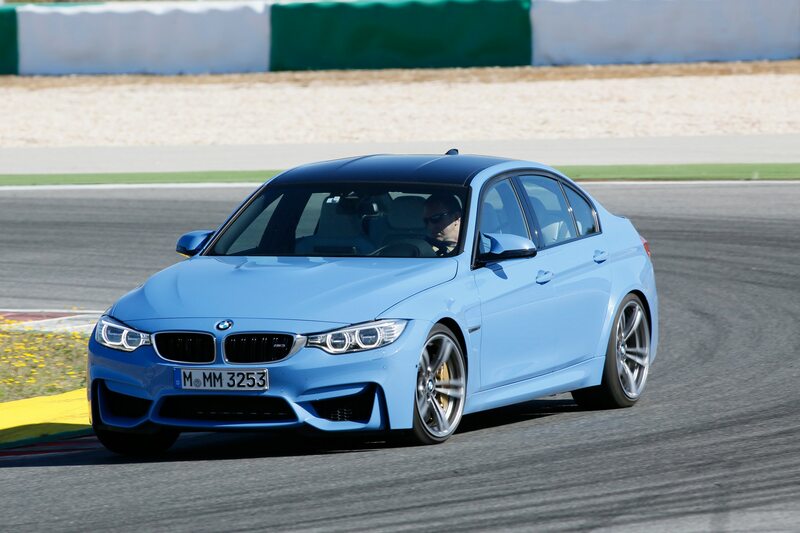 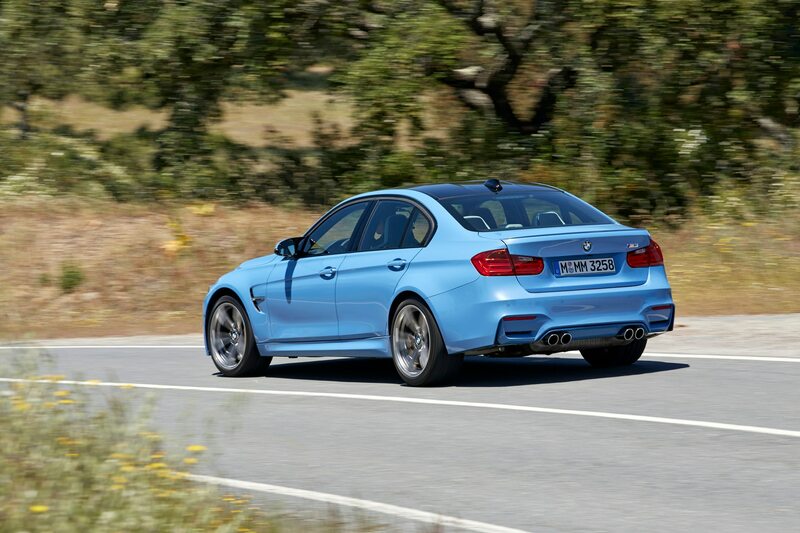 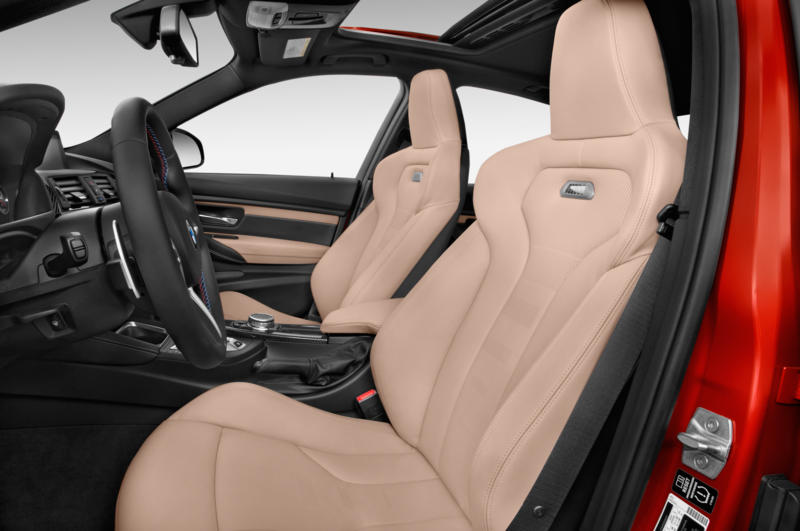 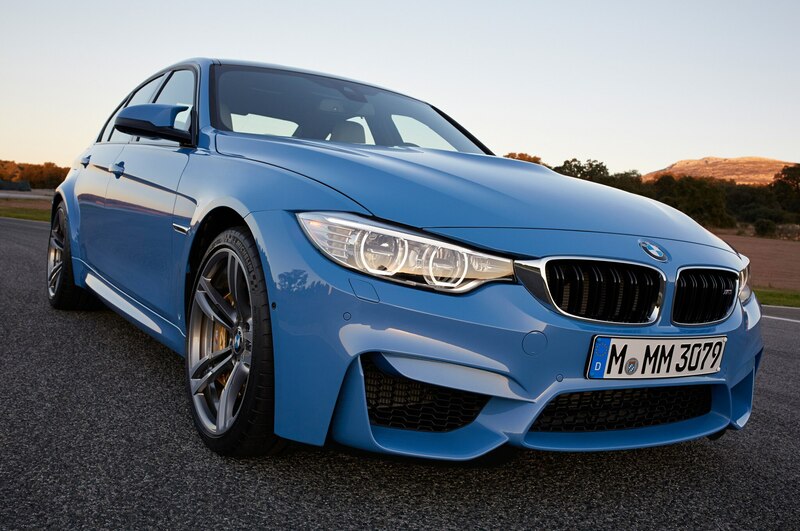 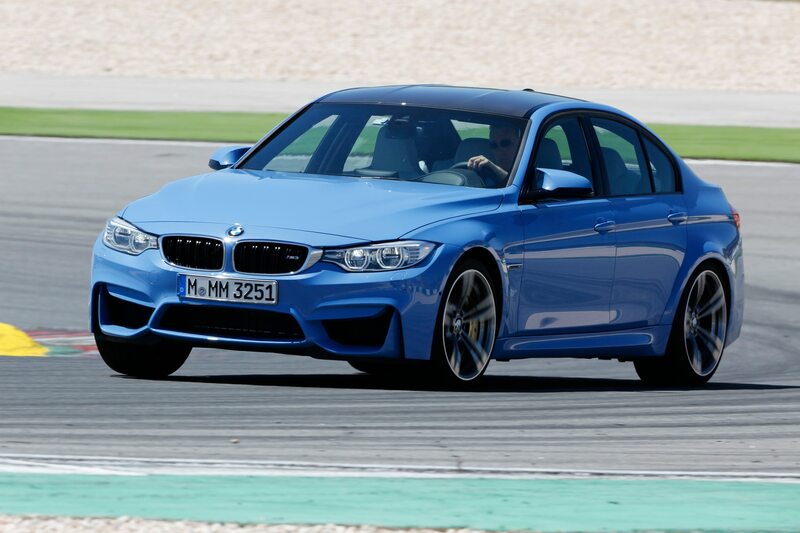 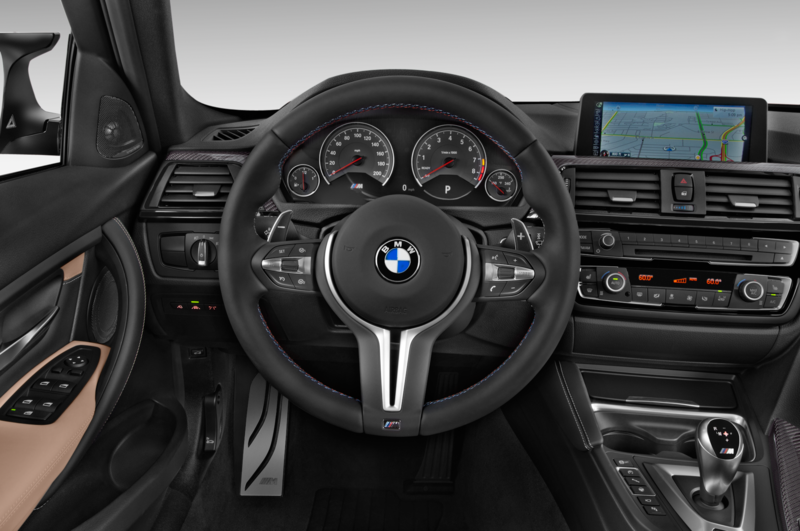 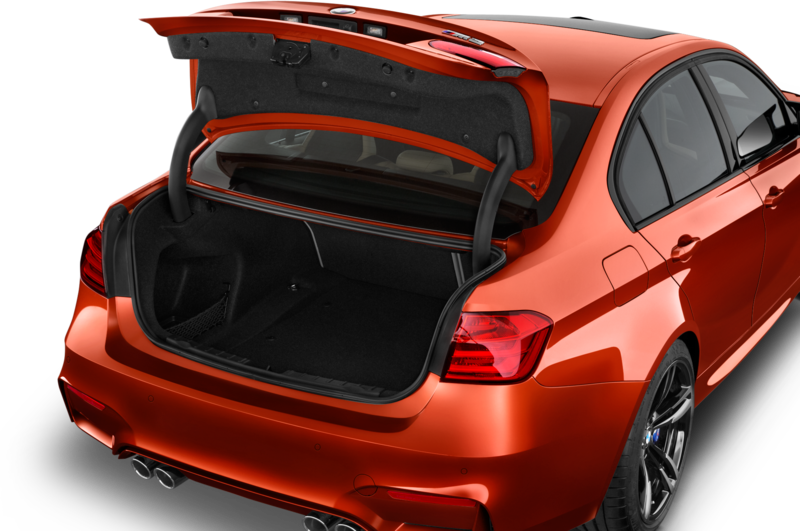 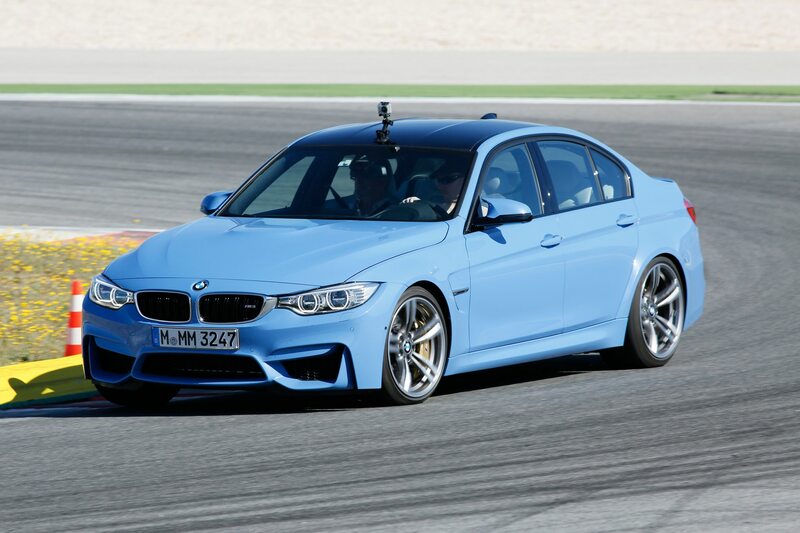 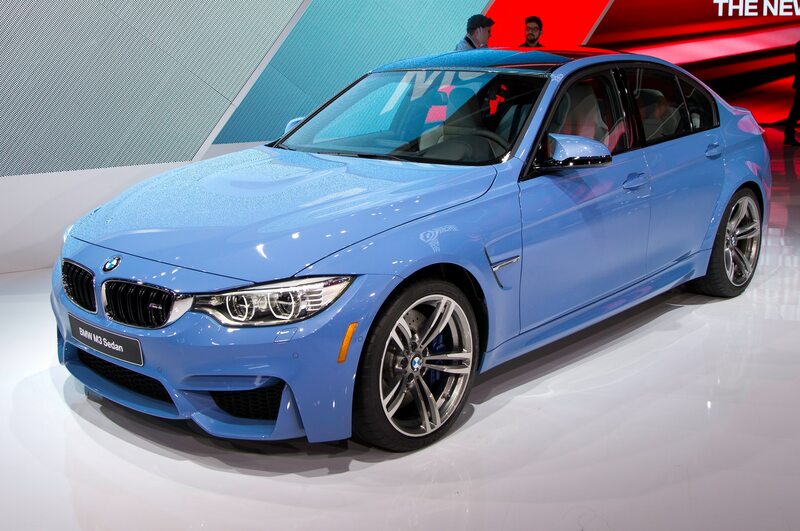 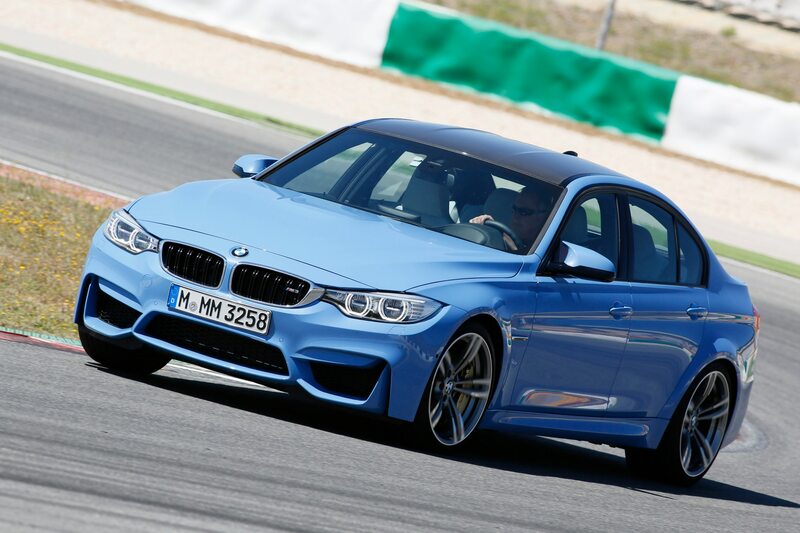 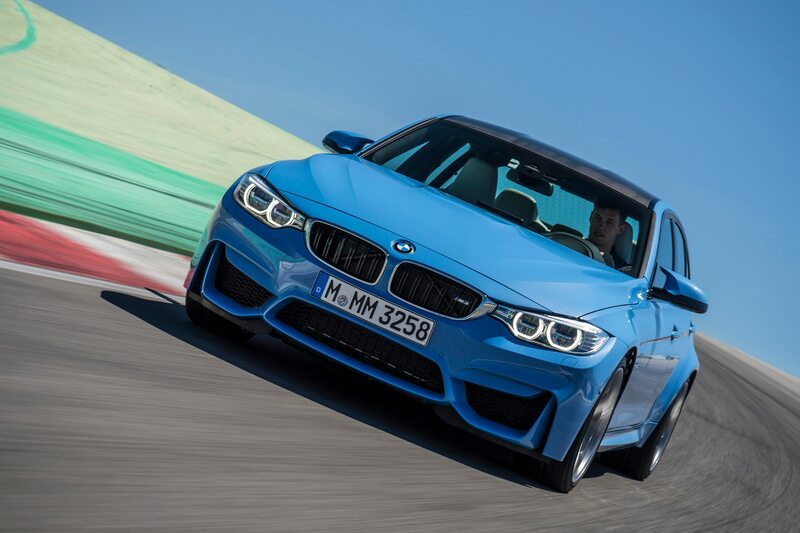 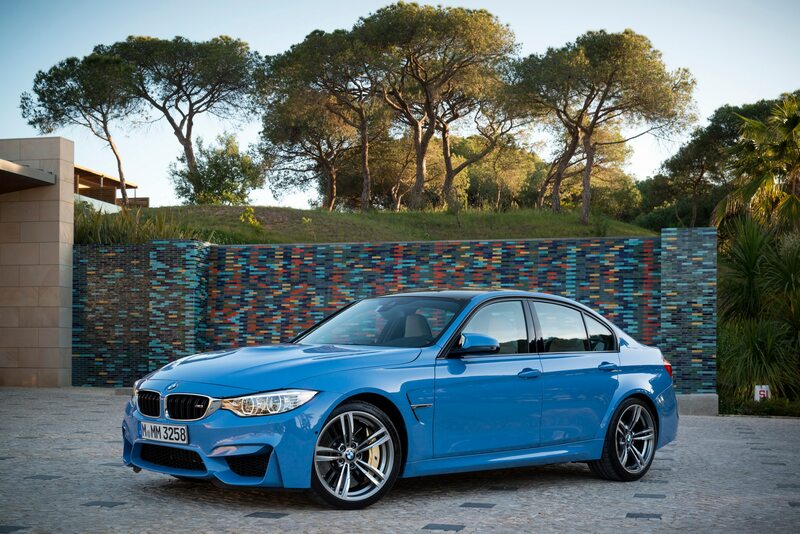 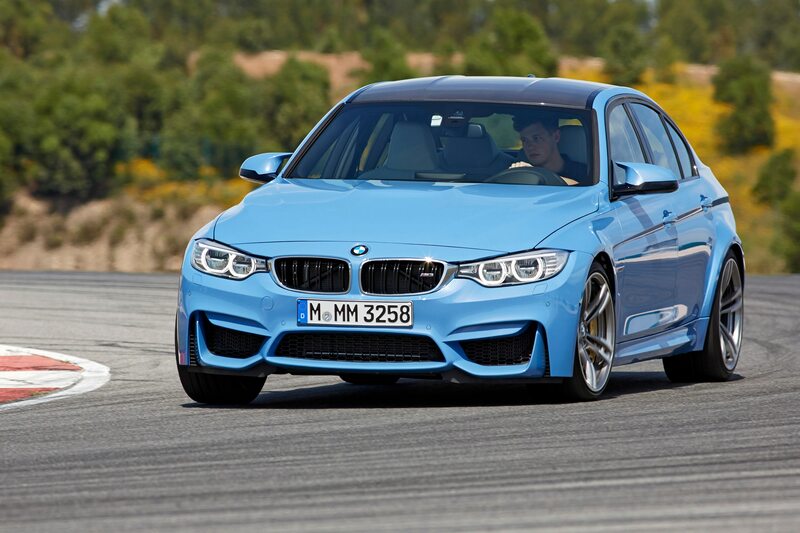 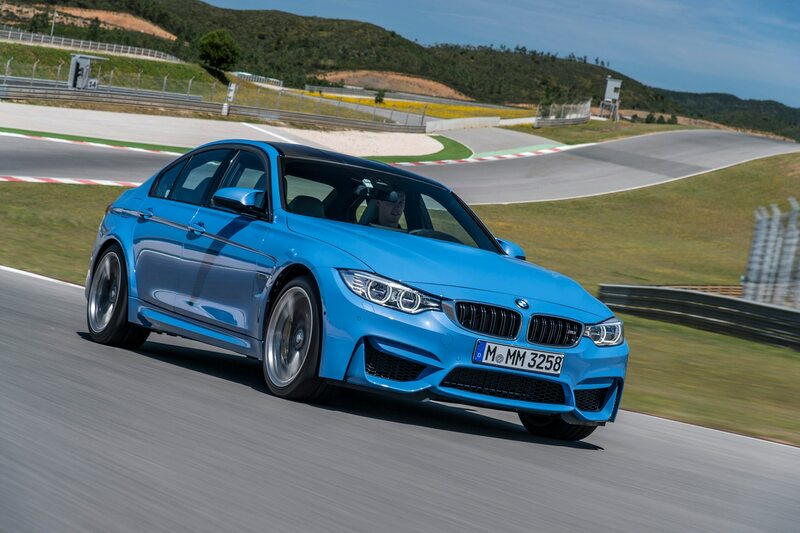 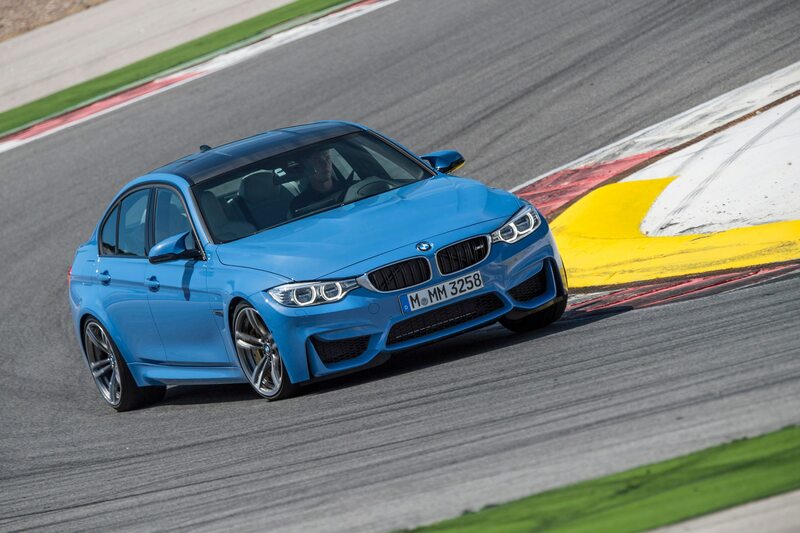 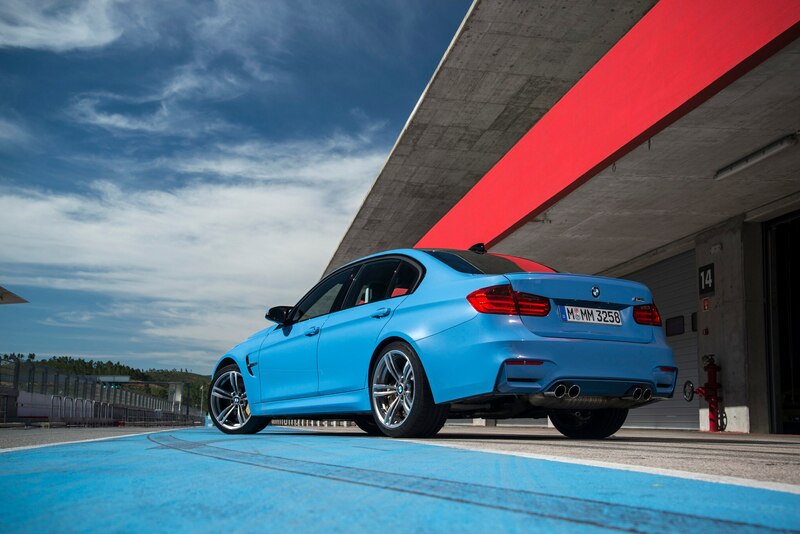 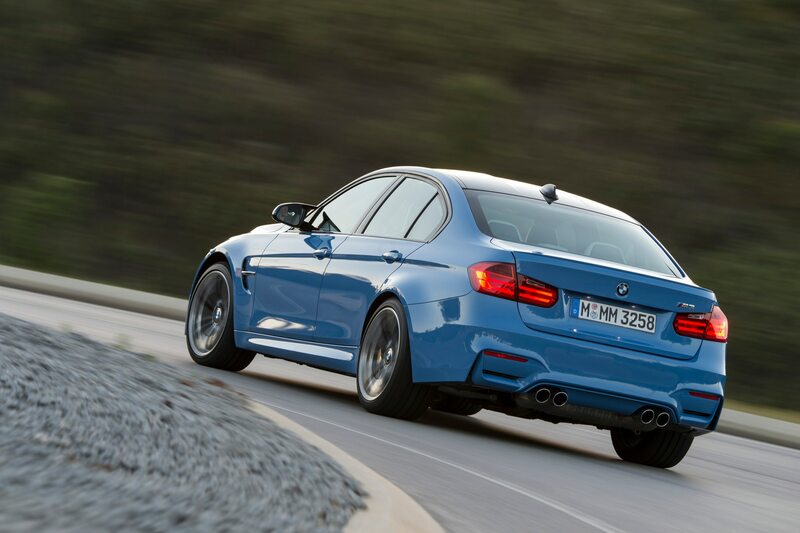 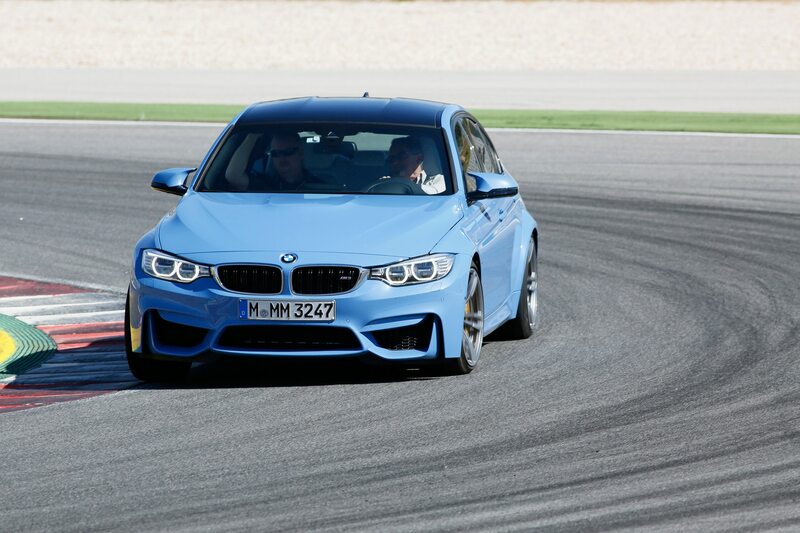 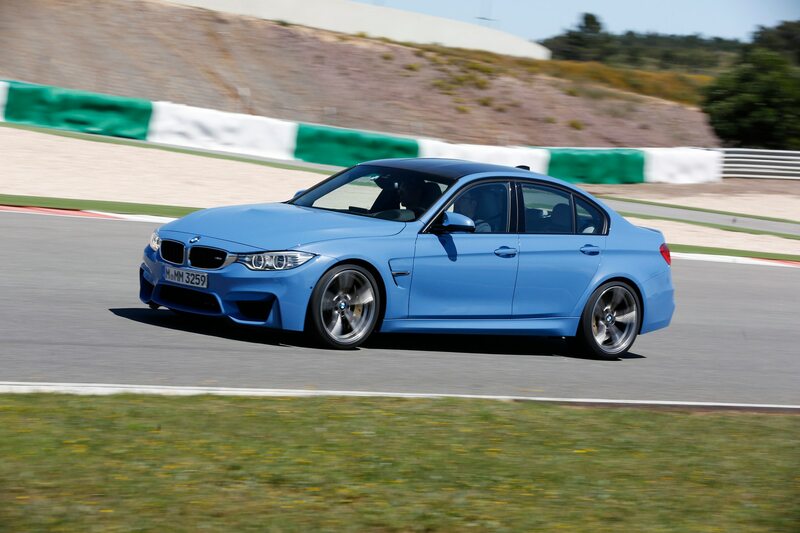 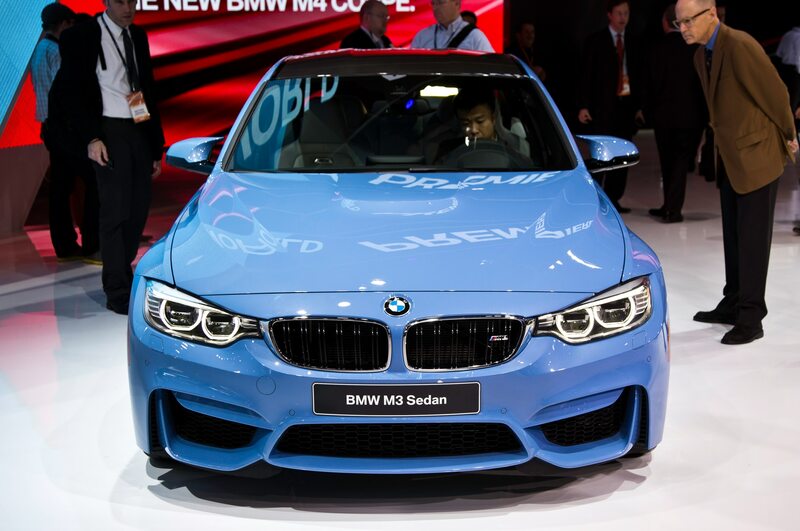 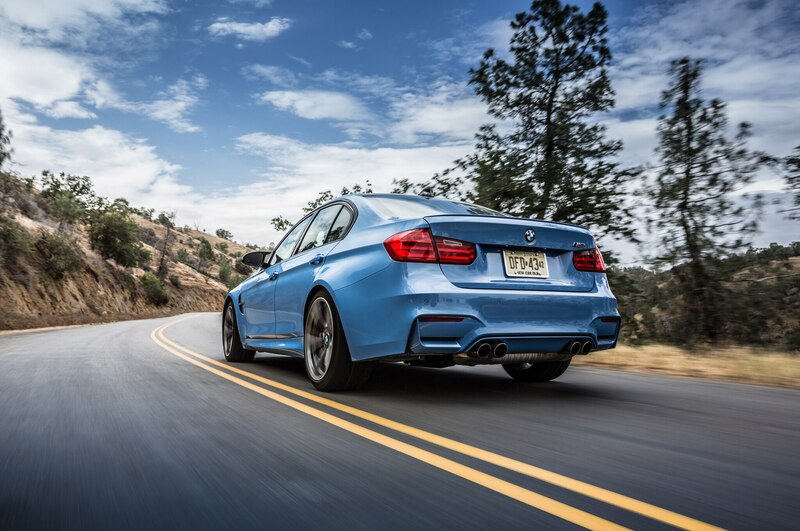 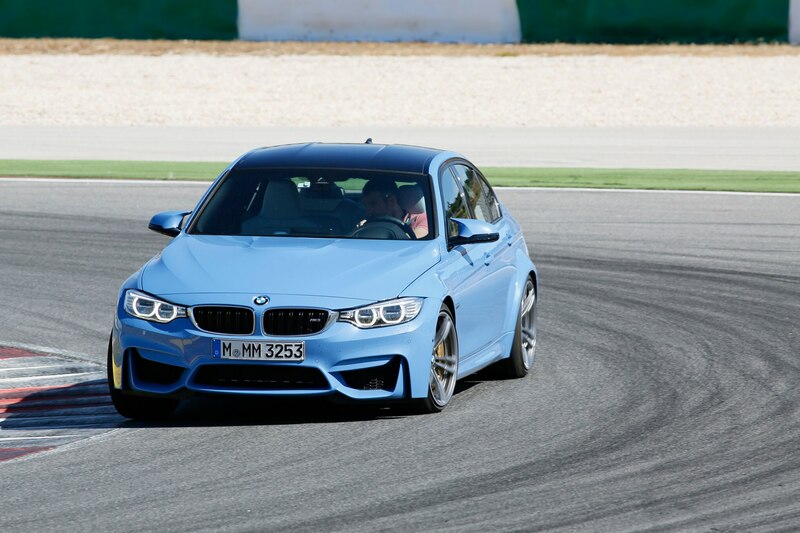 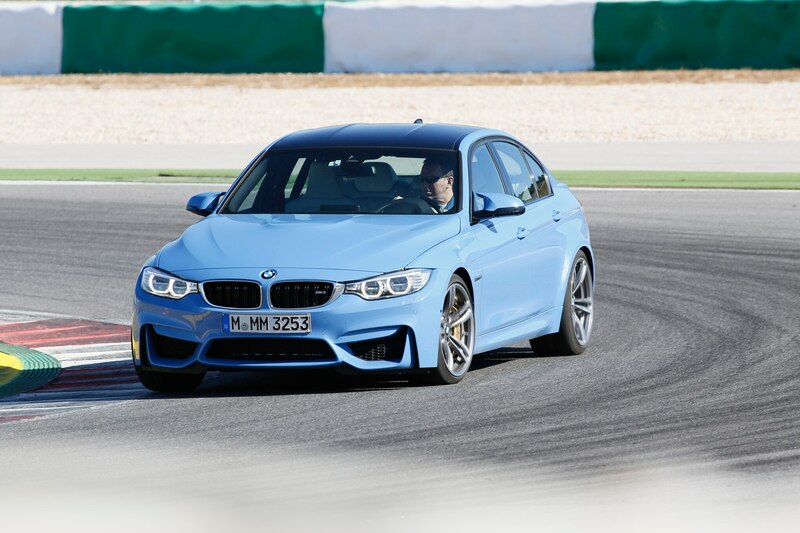 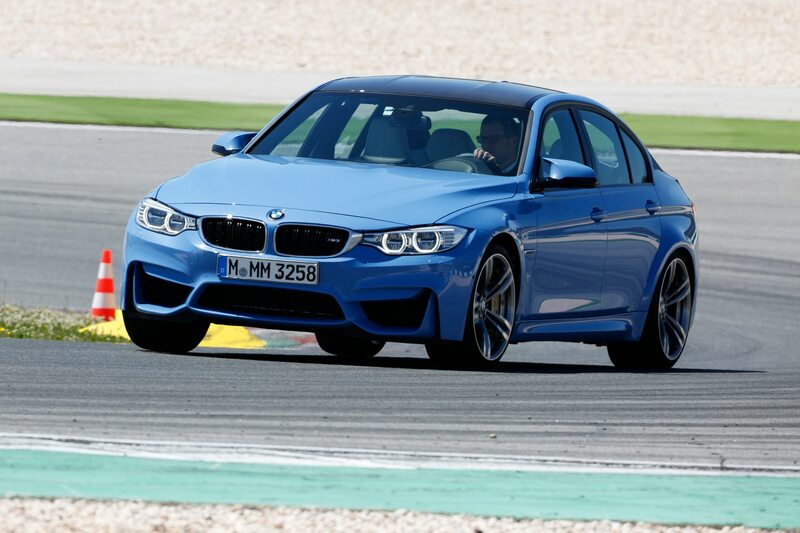 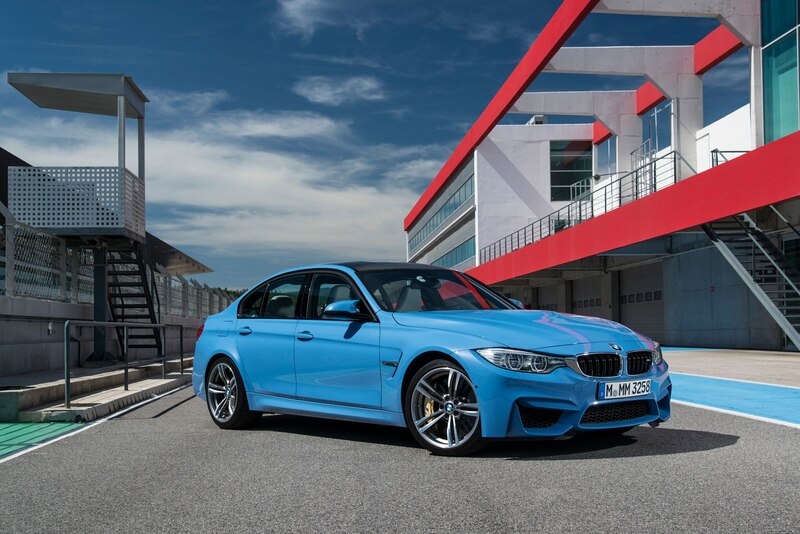 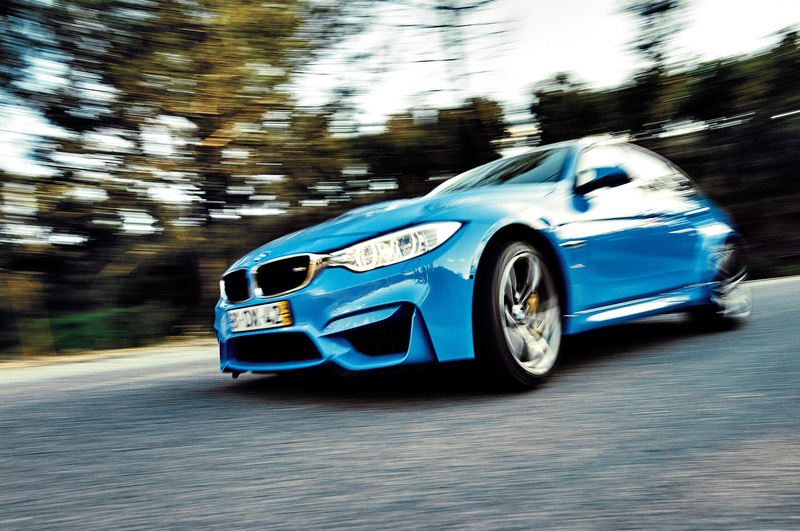 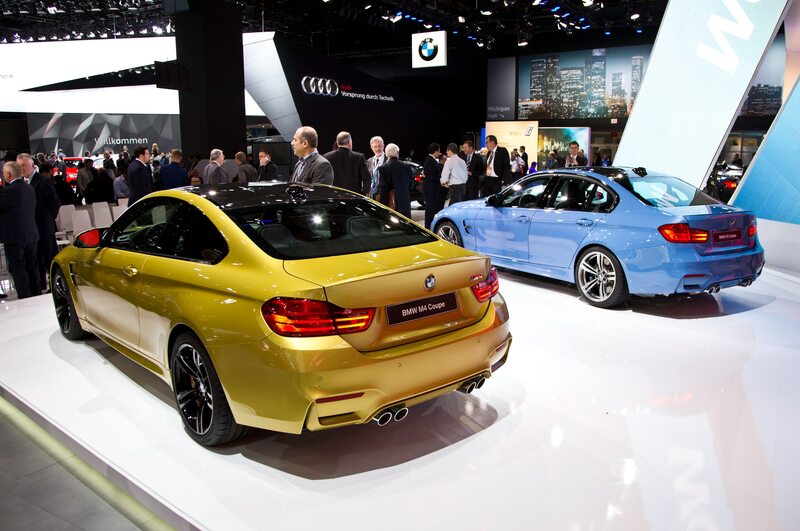 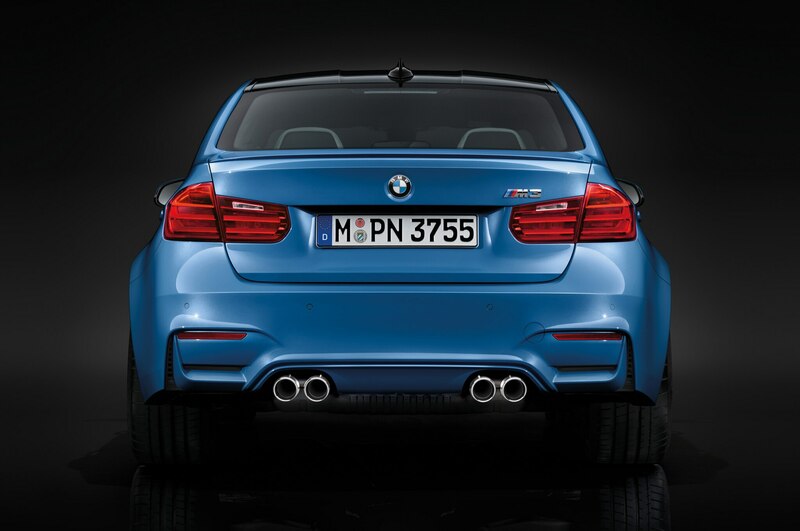 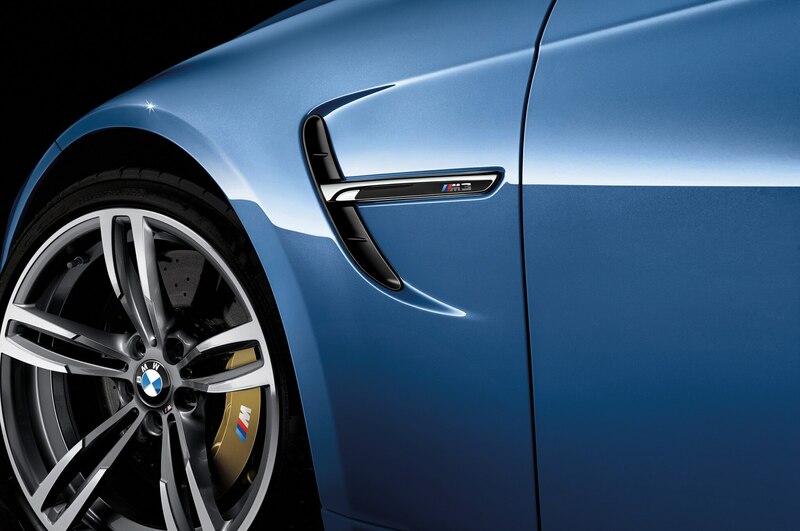 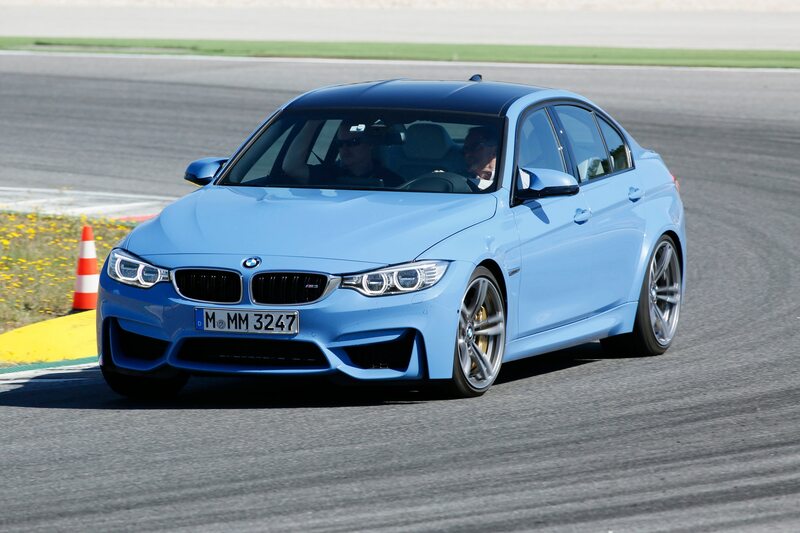 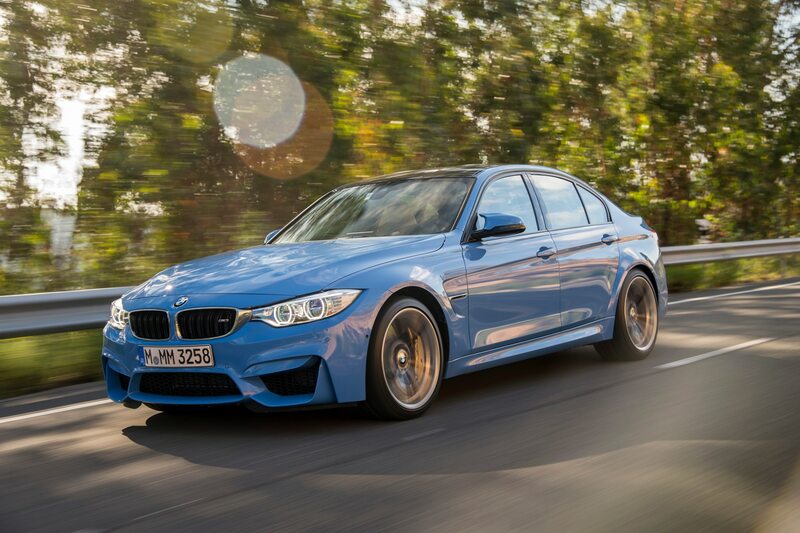 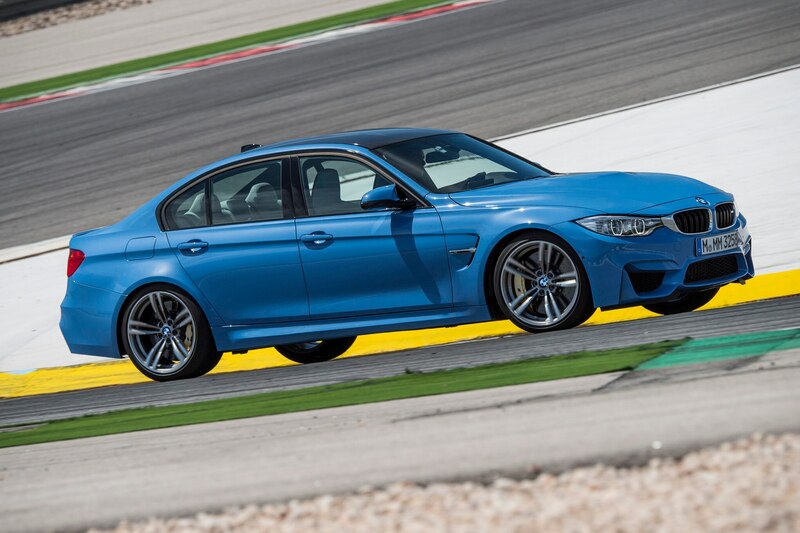 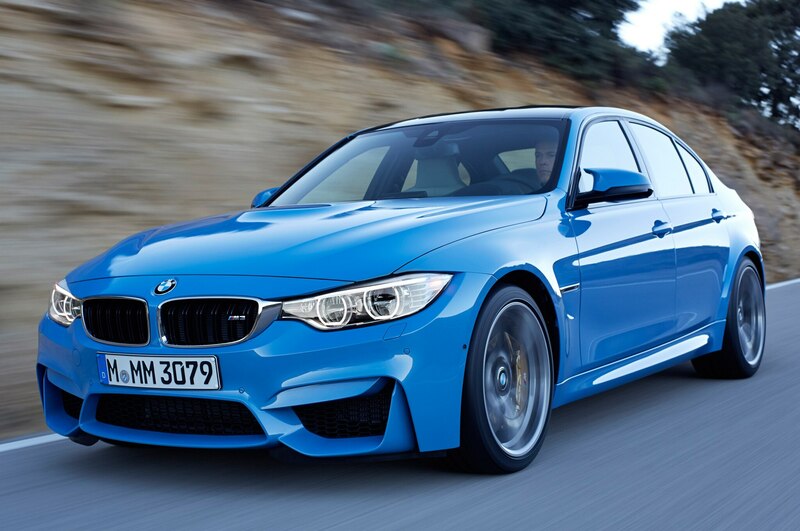 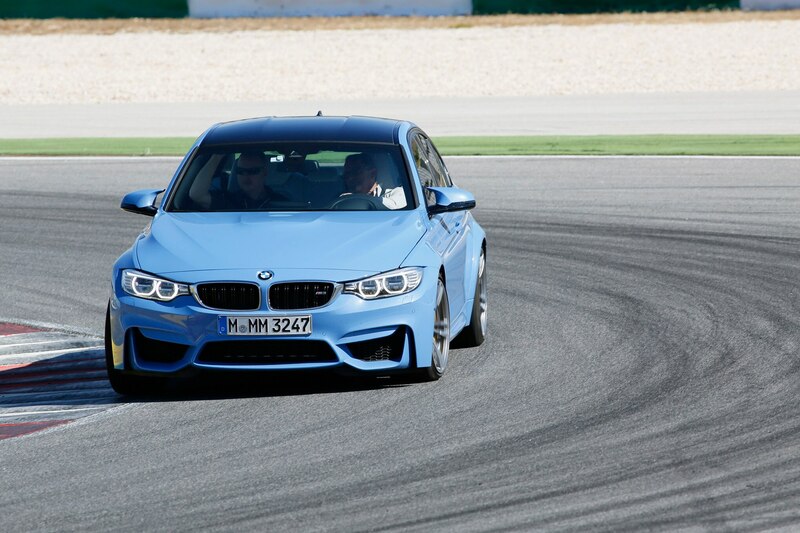 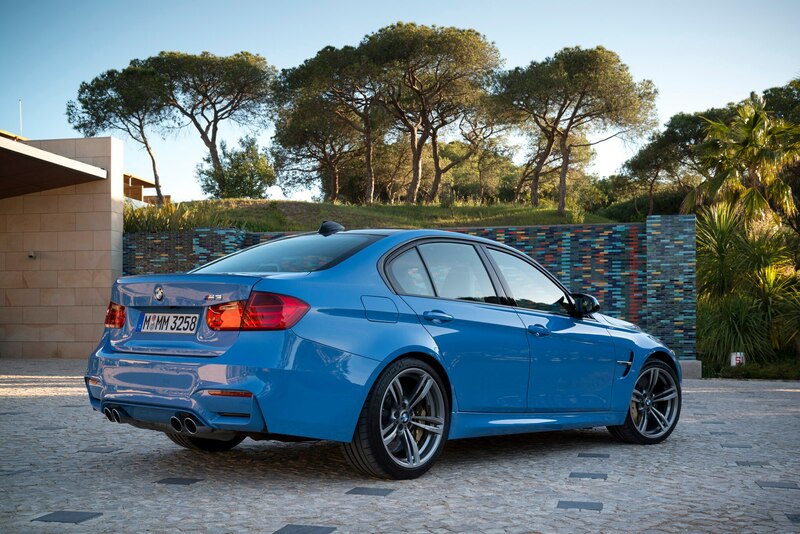 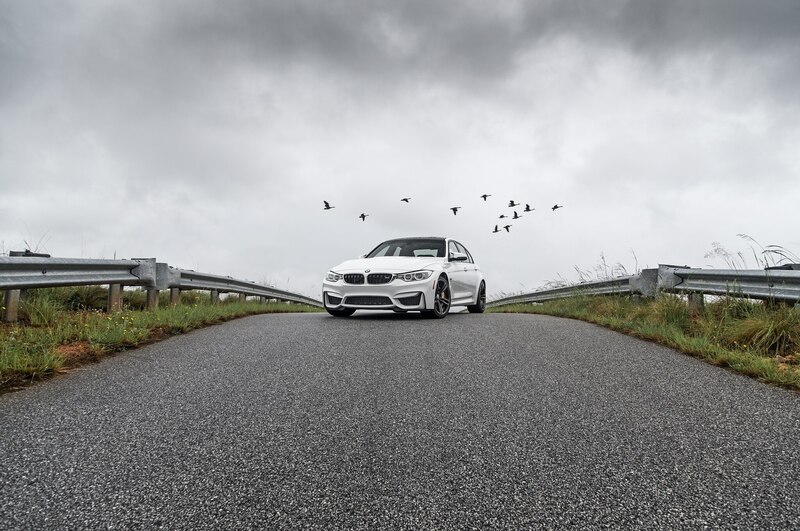 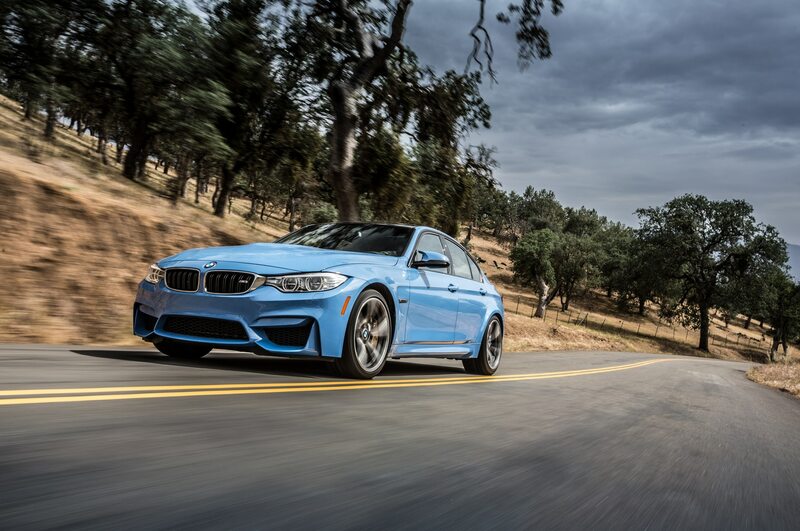 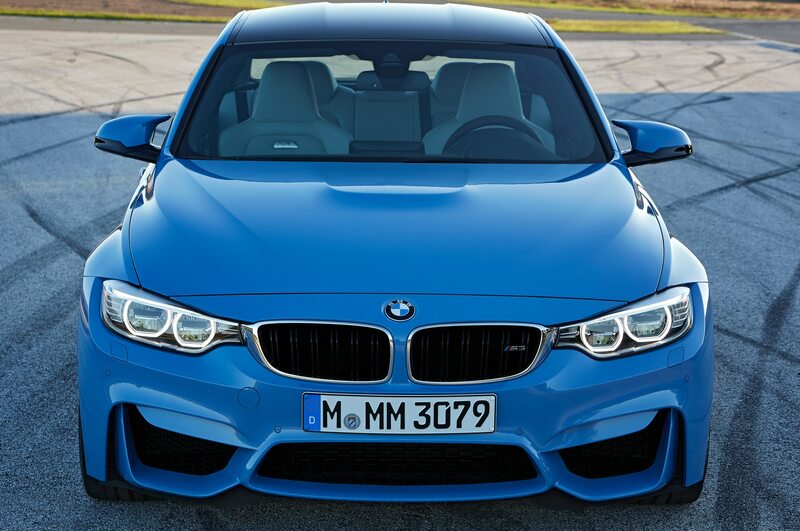 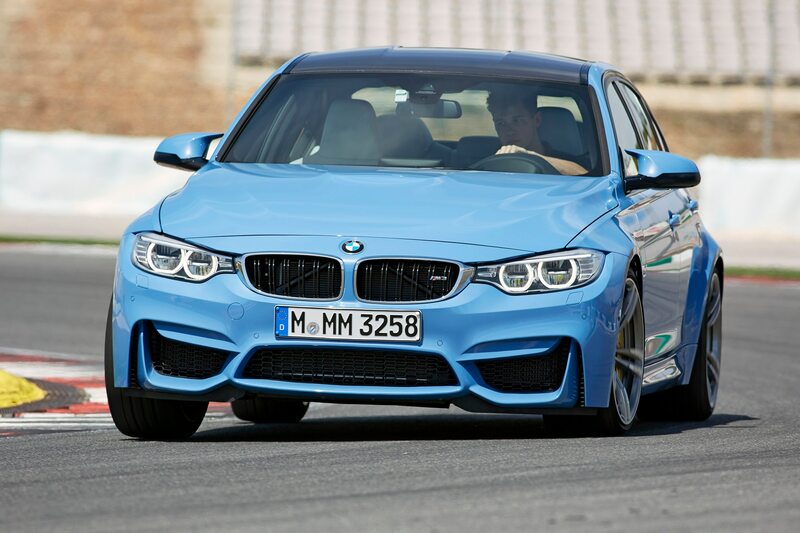 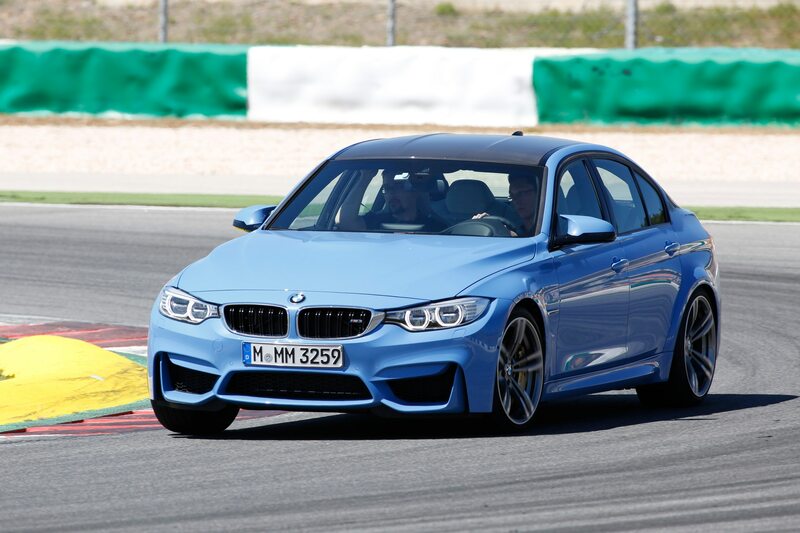 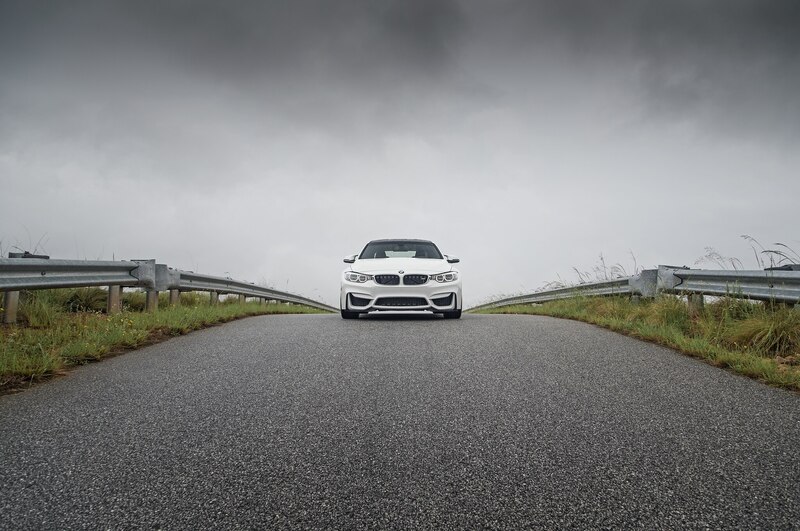 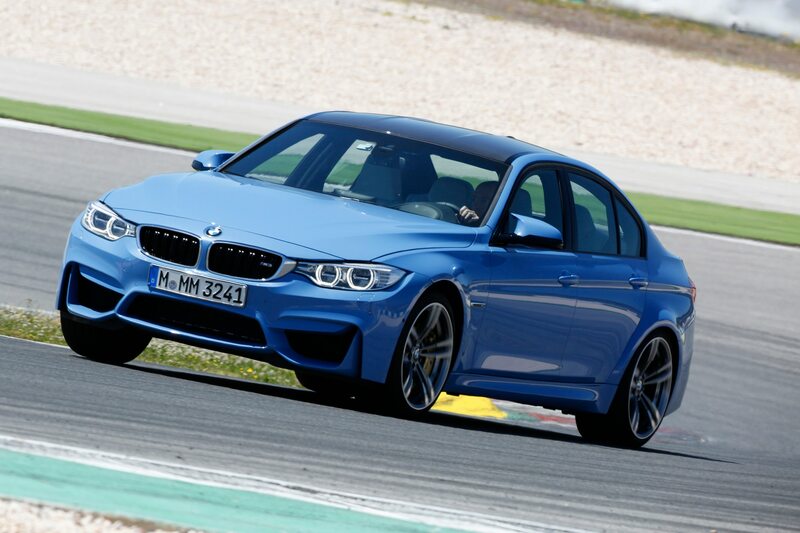 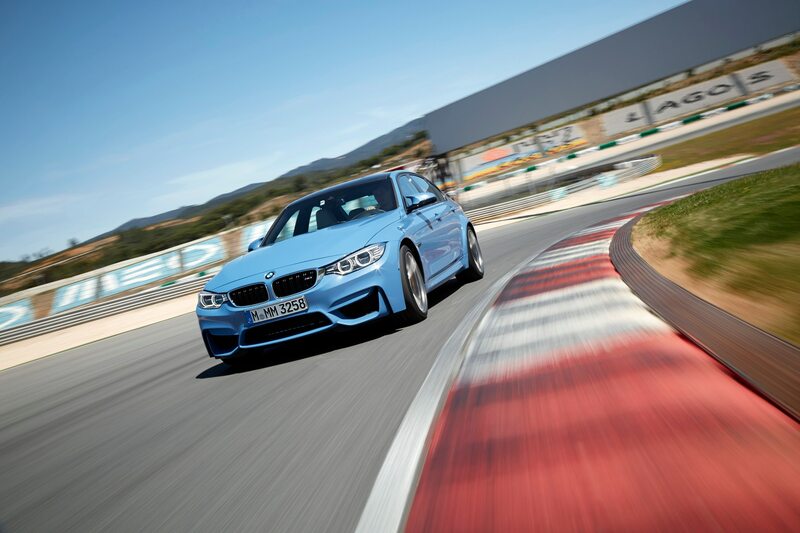 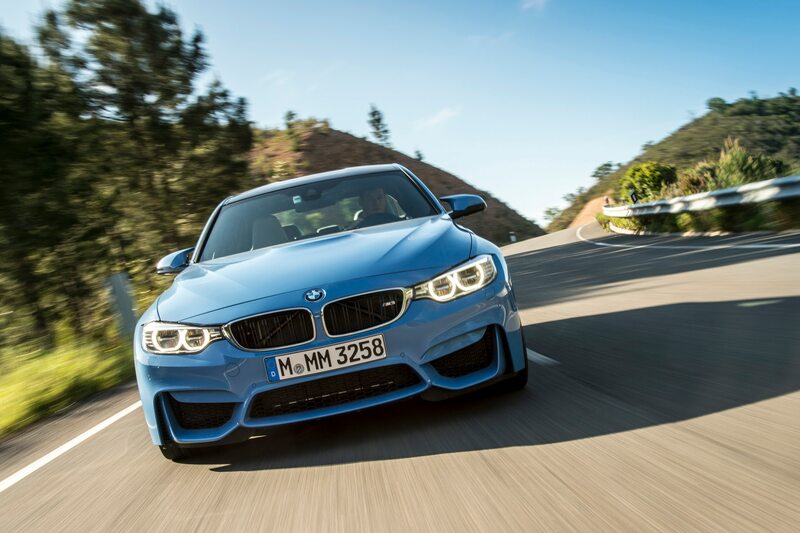 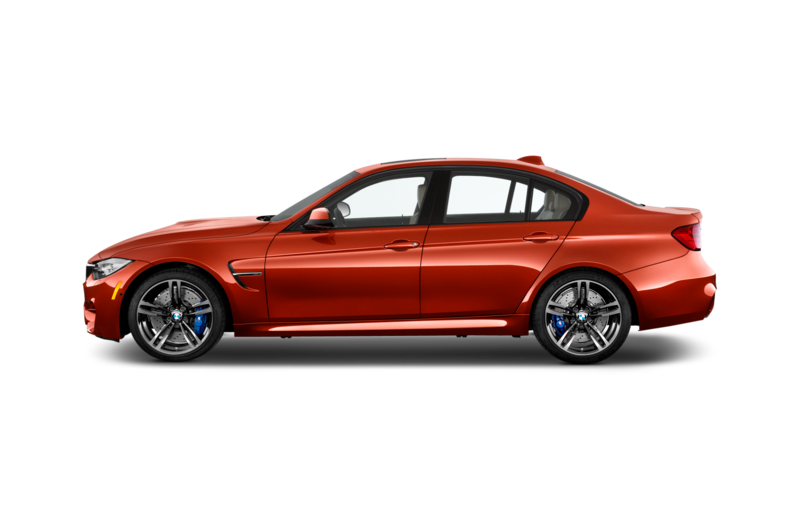 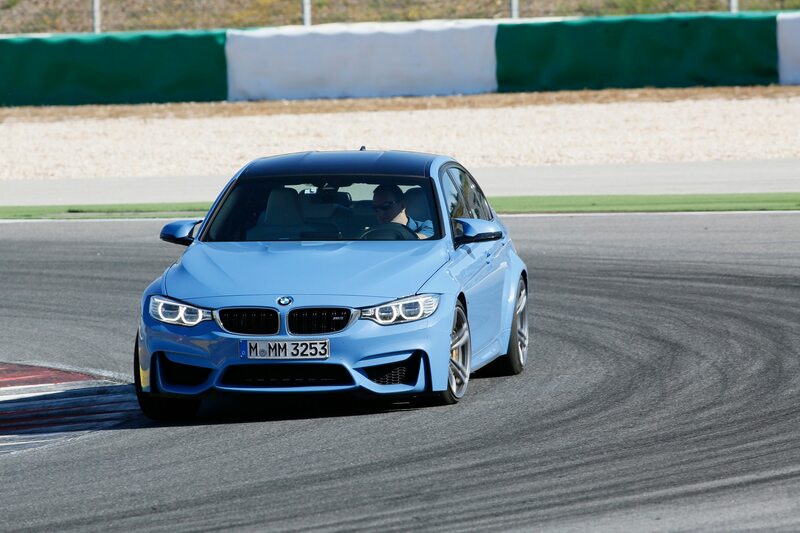 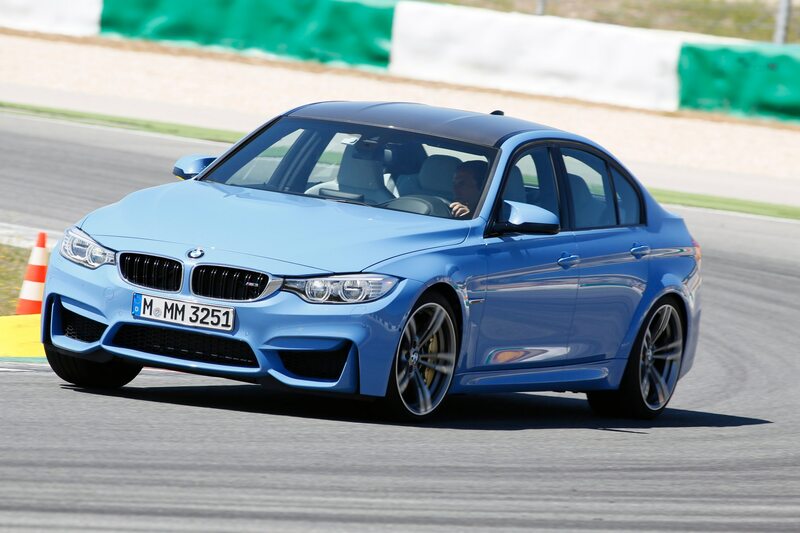 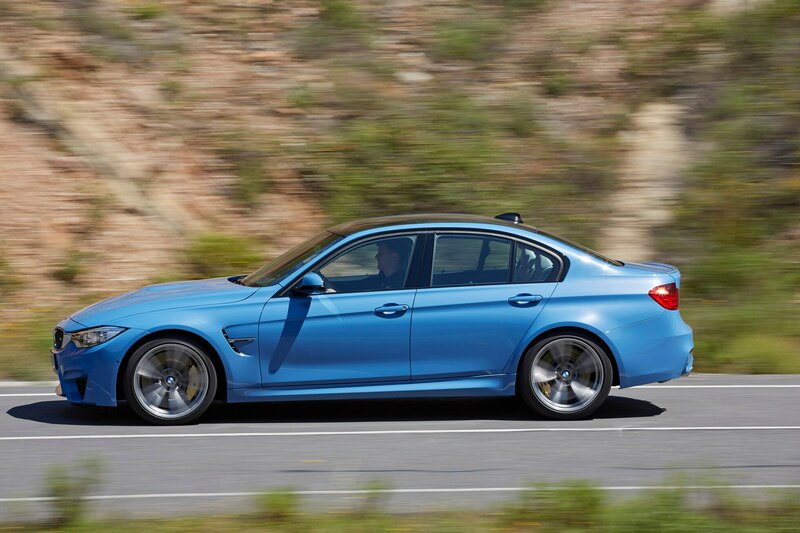 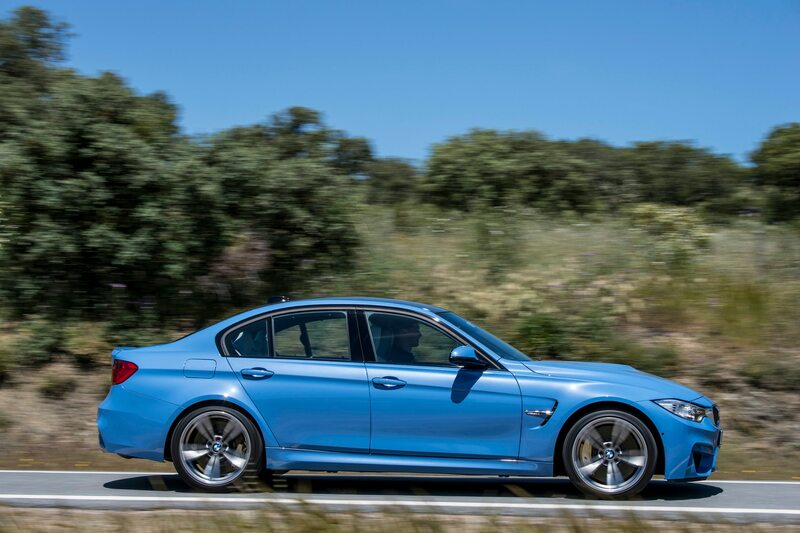 The 2015 BMW M3 is more sporty, more raw, more challenging, and more extroverted in character. 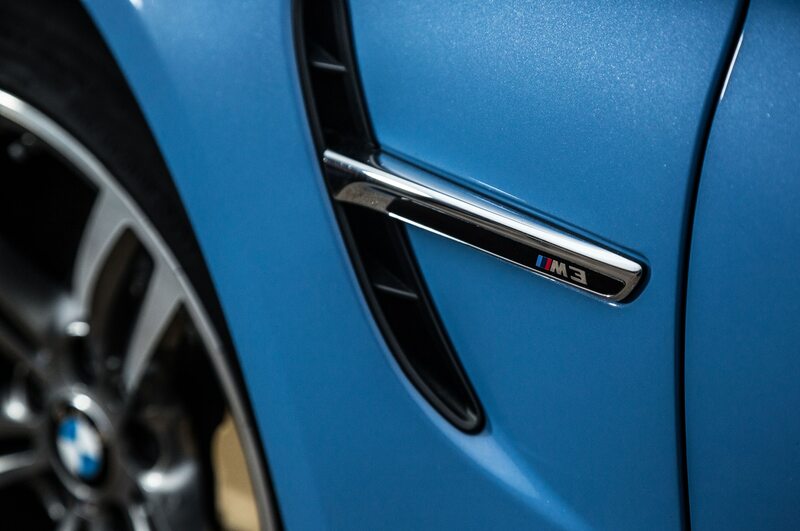 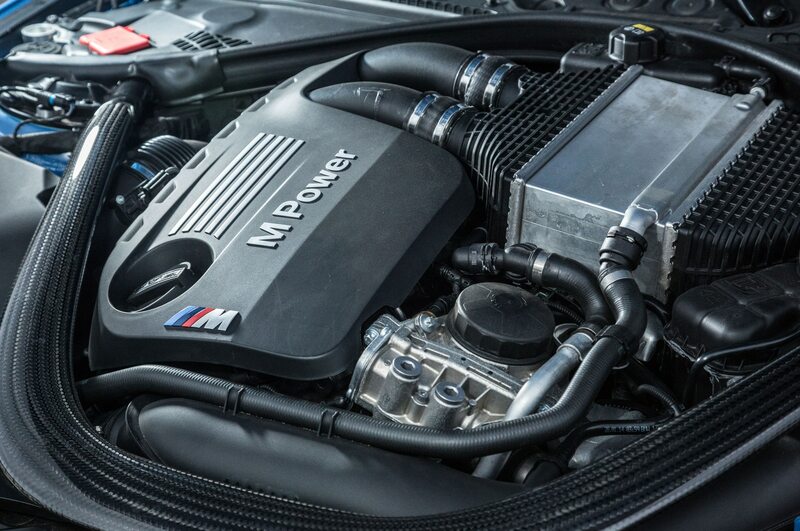 It is, in other words, what an M3 has always been. 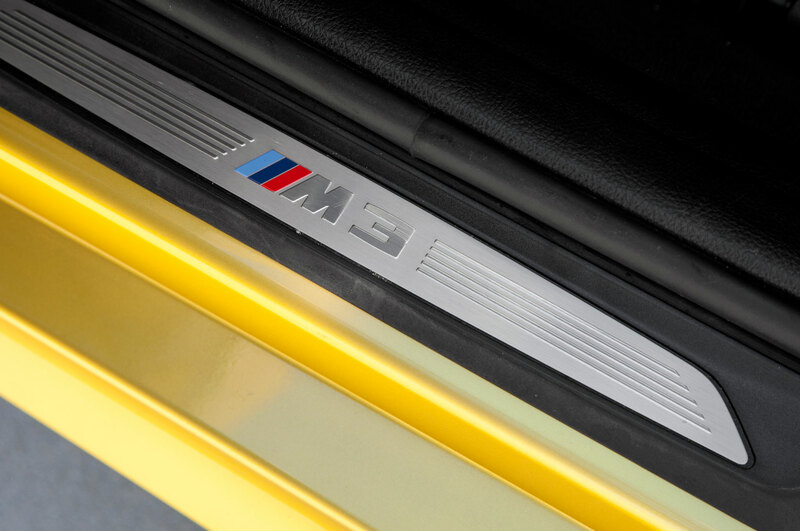 Those who’ve loved this car in the past will worship it still. 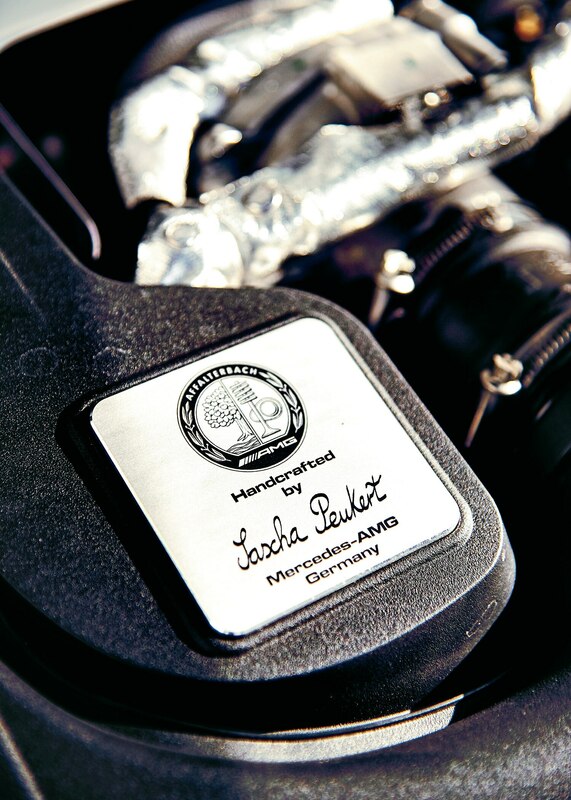 This side of the SLS and GT, AMGs have always been high-powered grand tourers. 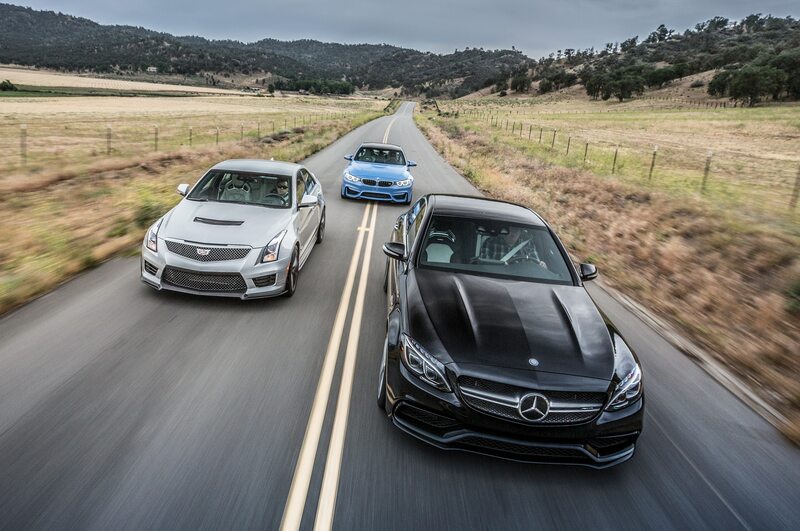 The 2015 Mercedes-AMG C63 certainly upholds that tradition. 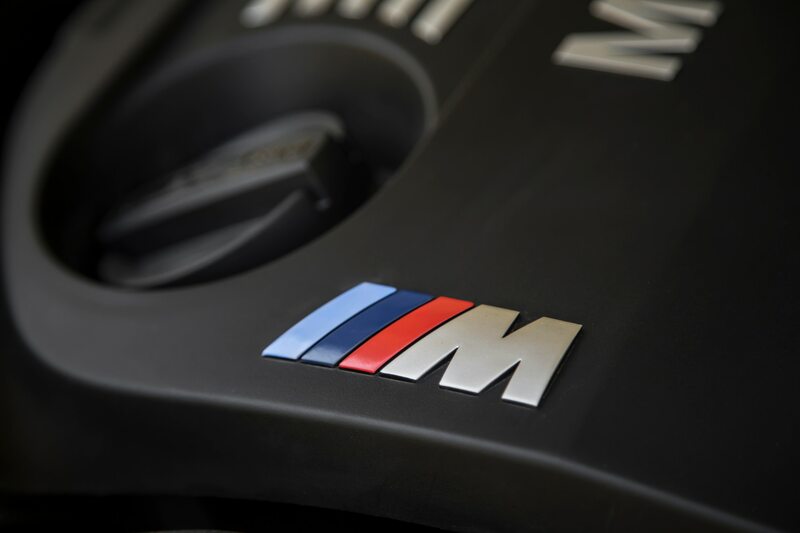 But it is not, especially in all the areas that matter, simply more of the same. 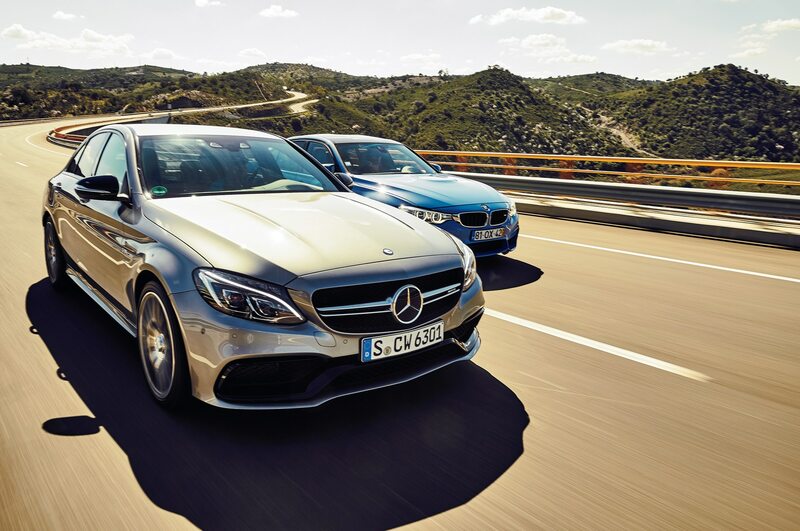 Over the course of its redesign, the top-of-the-line C-Class has picked up a bunch of fresh virtues. 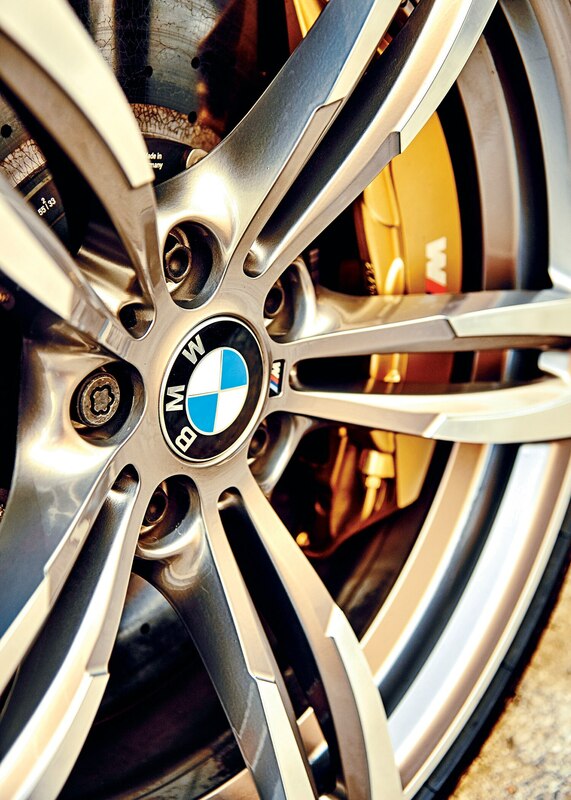 It steers with more enthusiasm, it brakes with more bite, it puts power down with more determination. 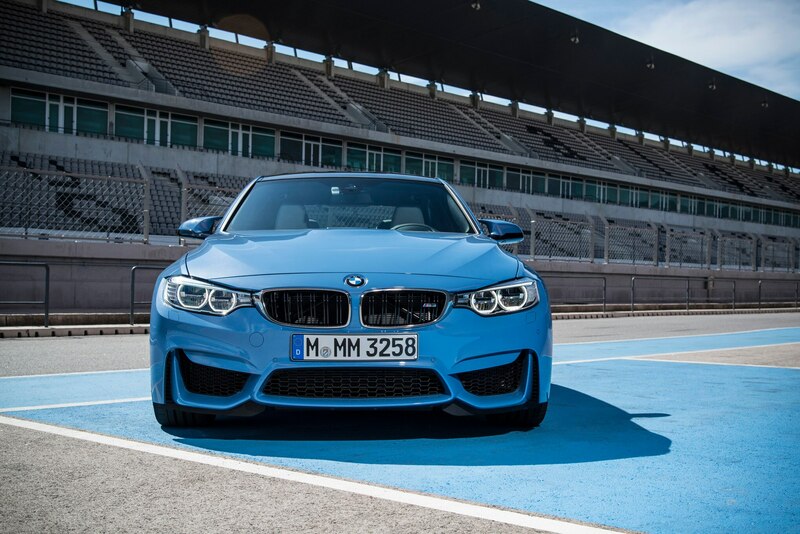 And, most important, it handles with a delicate sweetness none of its nose-heavy, tail-happy predecessors ever approached. 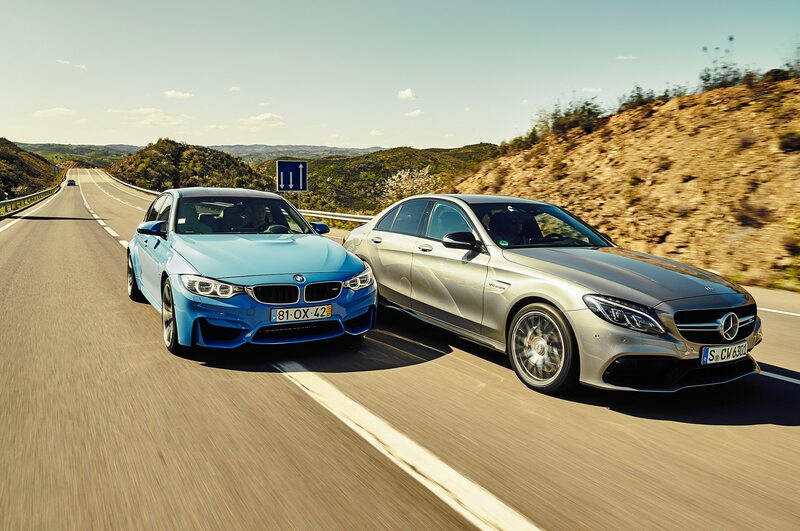 Compared with the M3, the new C63 AMG is the more complete all-’rounder, creamier and more composed but dynamically just as awesome. 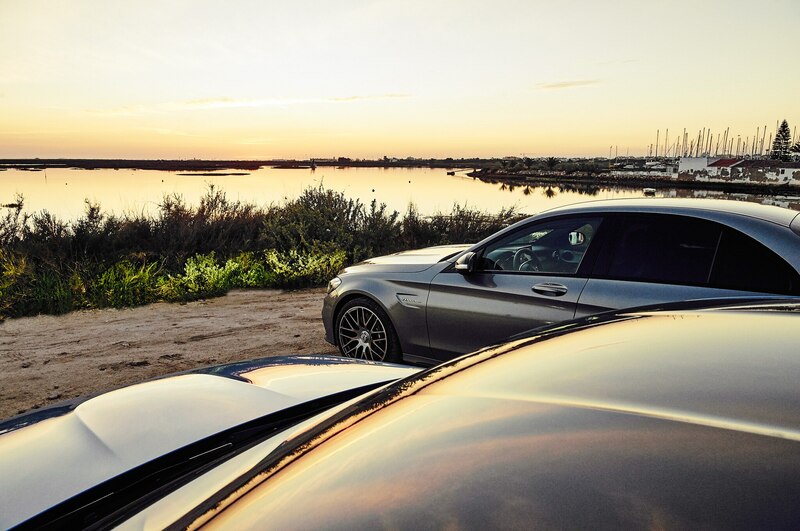 If you want the smiles without the pain, the Mercedes is the one to reach out for.